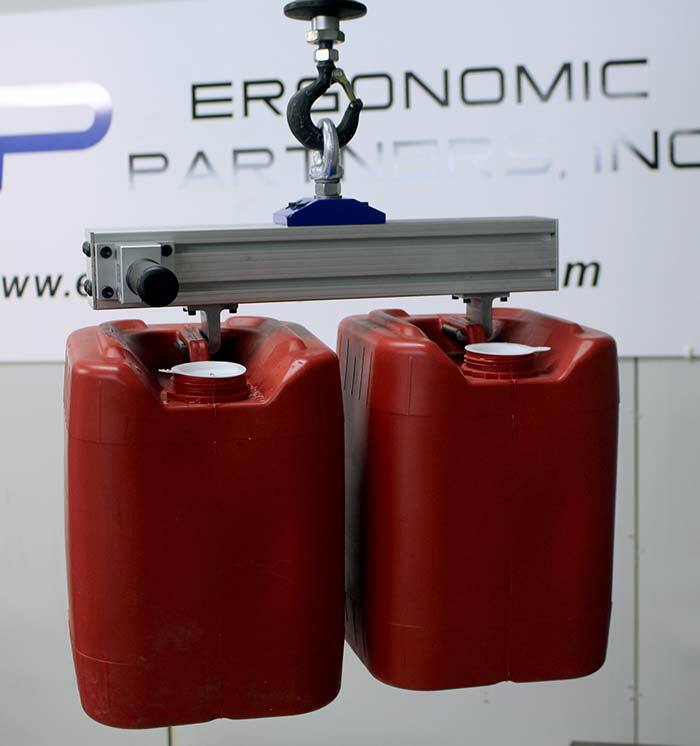 Ideal for boxes, bags, glass, wood, stone and metal. 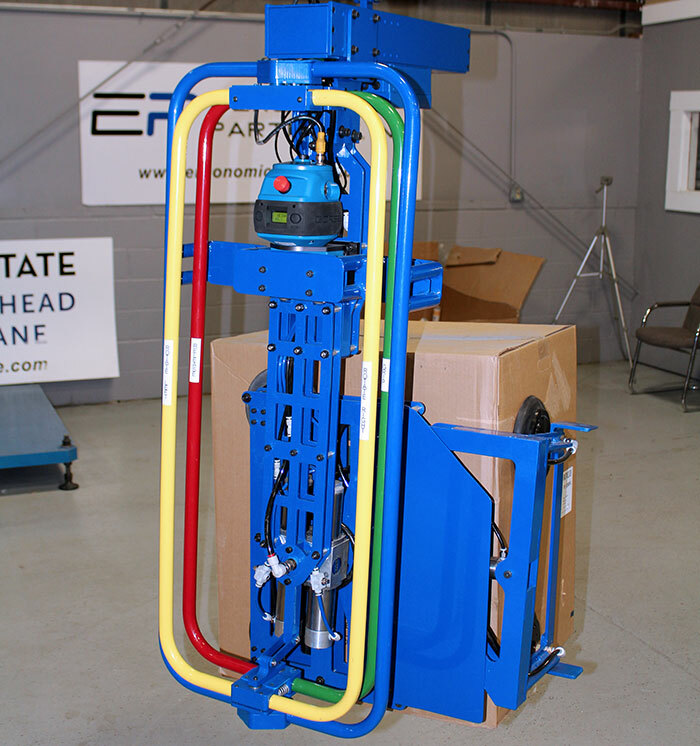 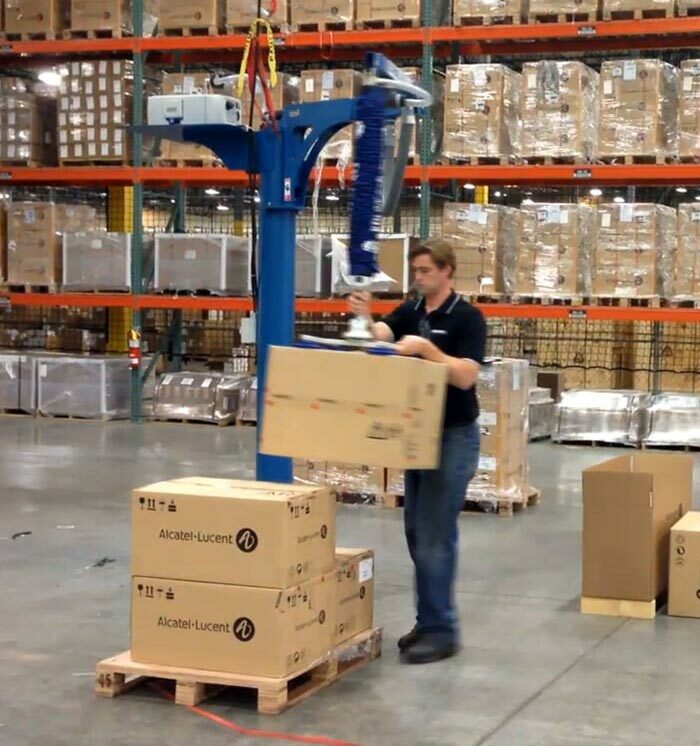 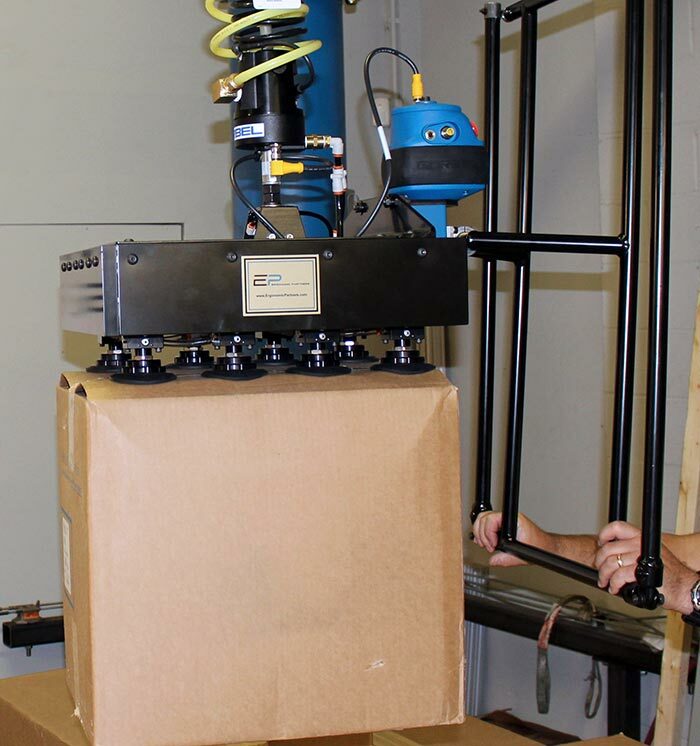 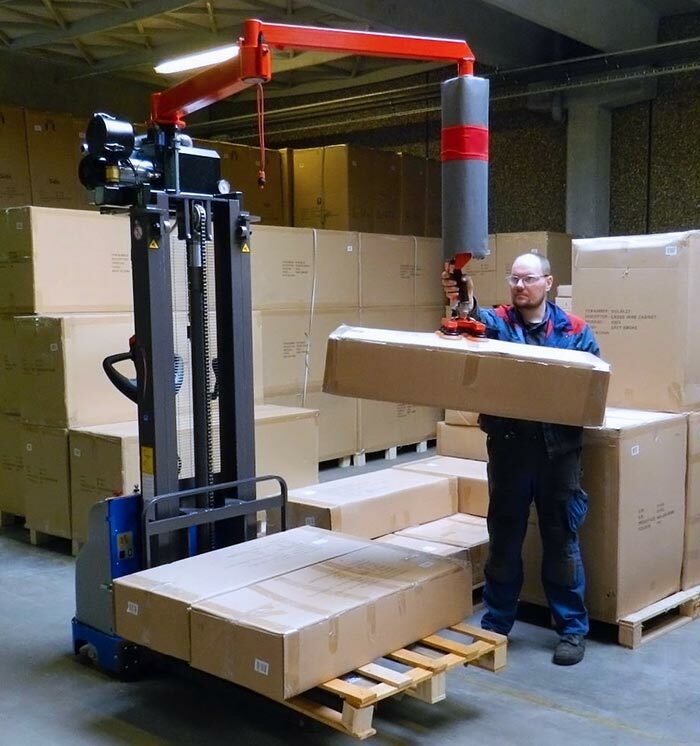 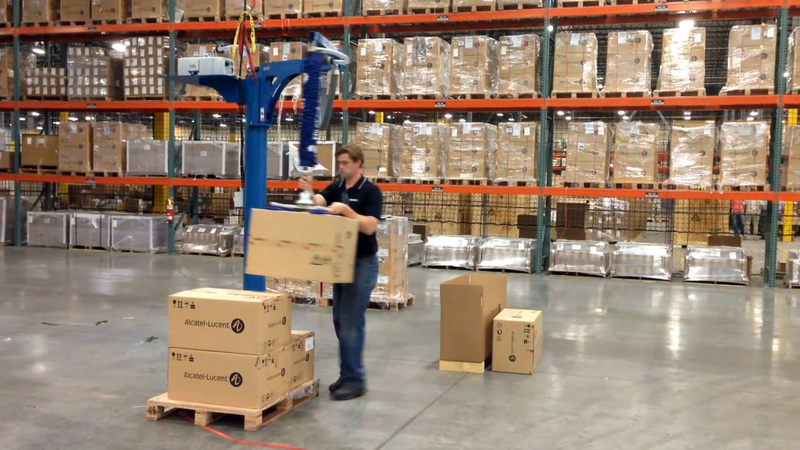 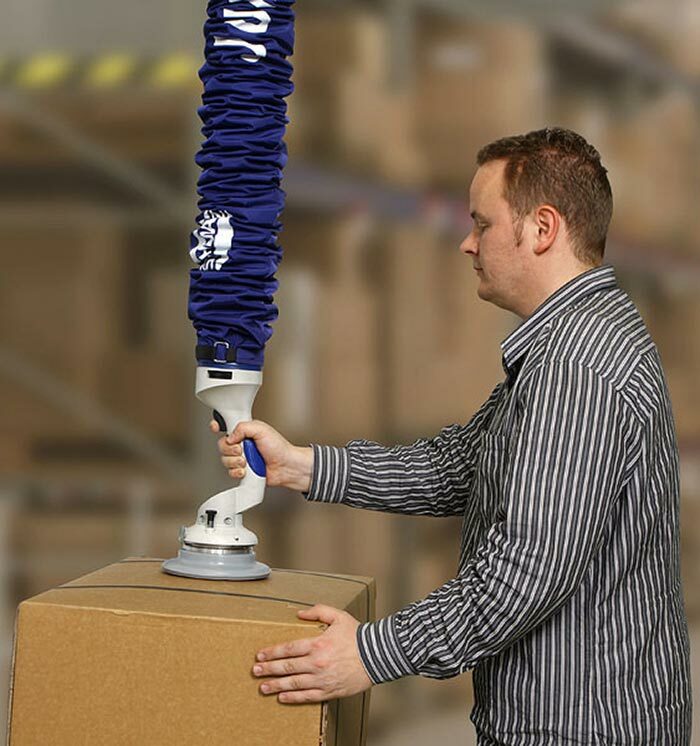 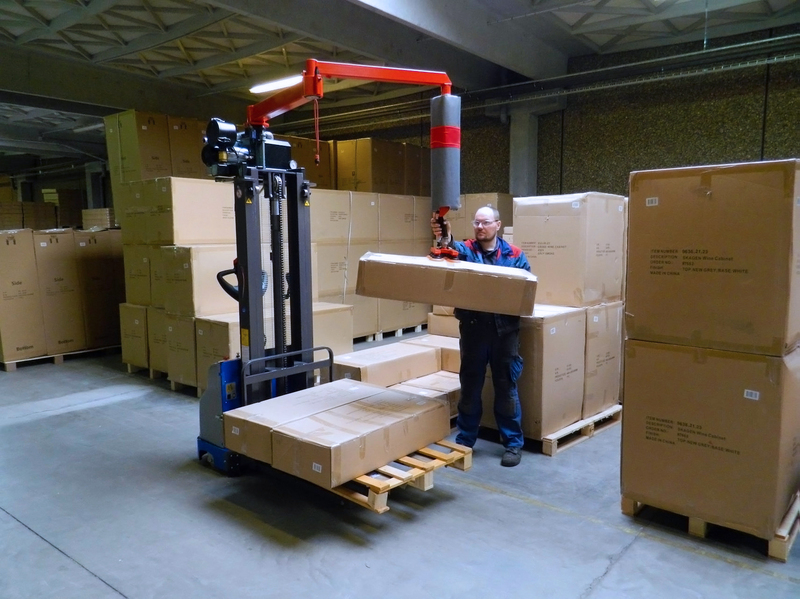 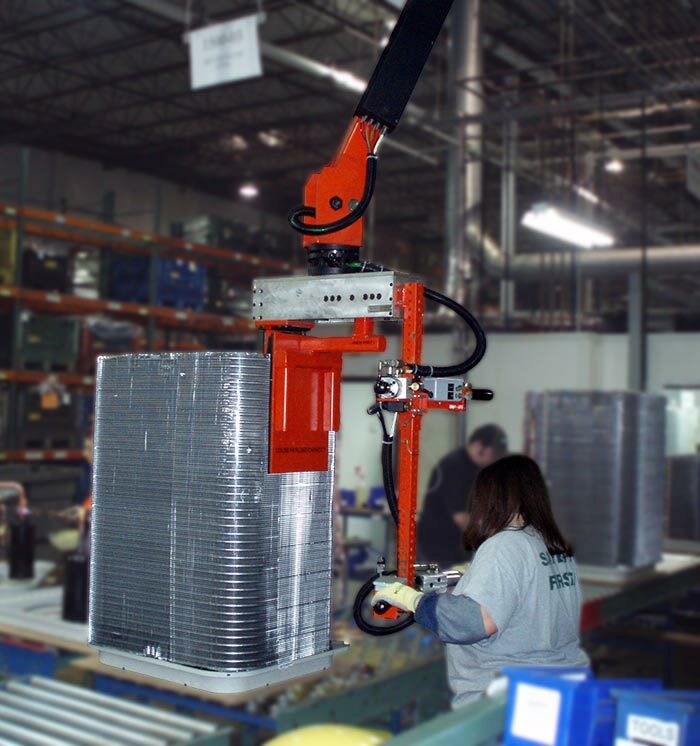 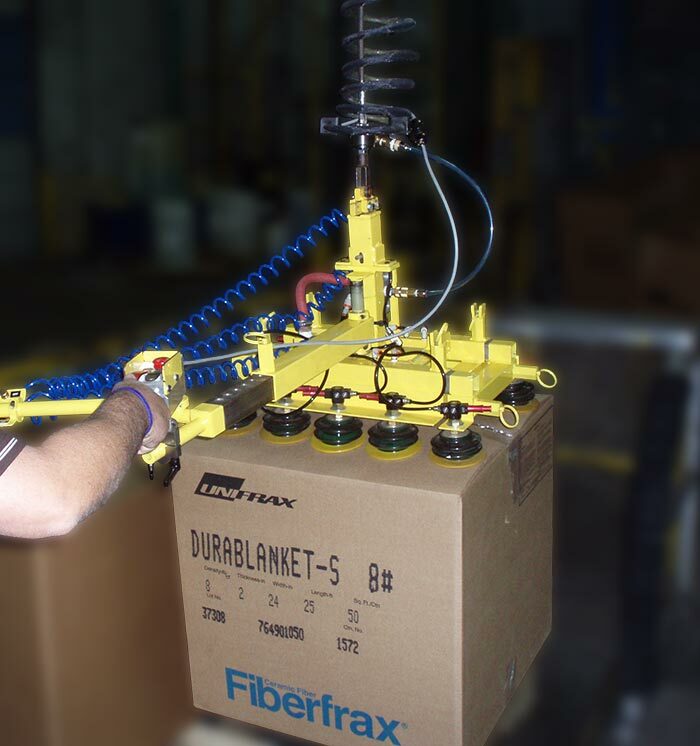 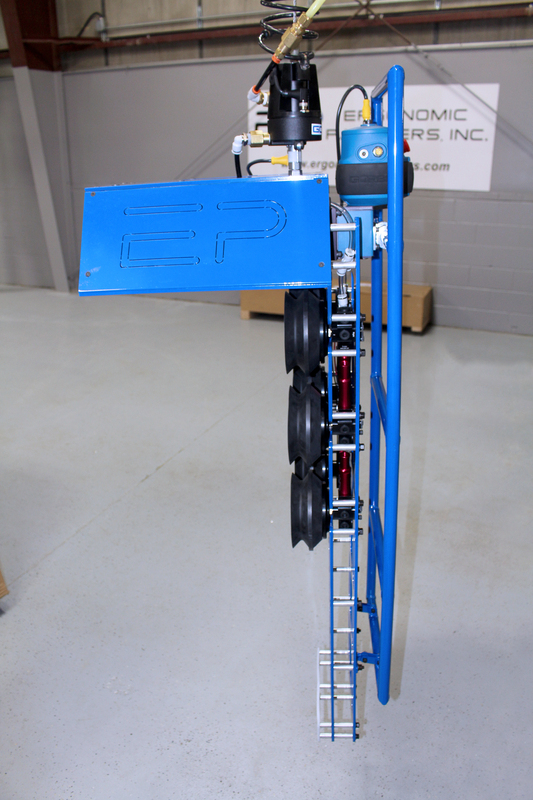 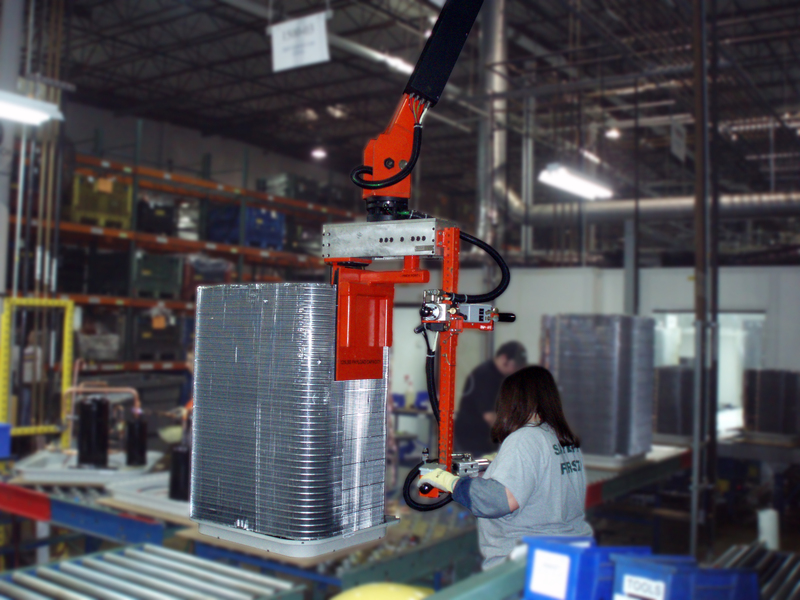 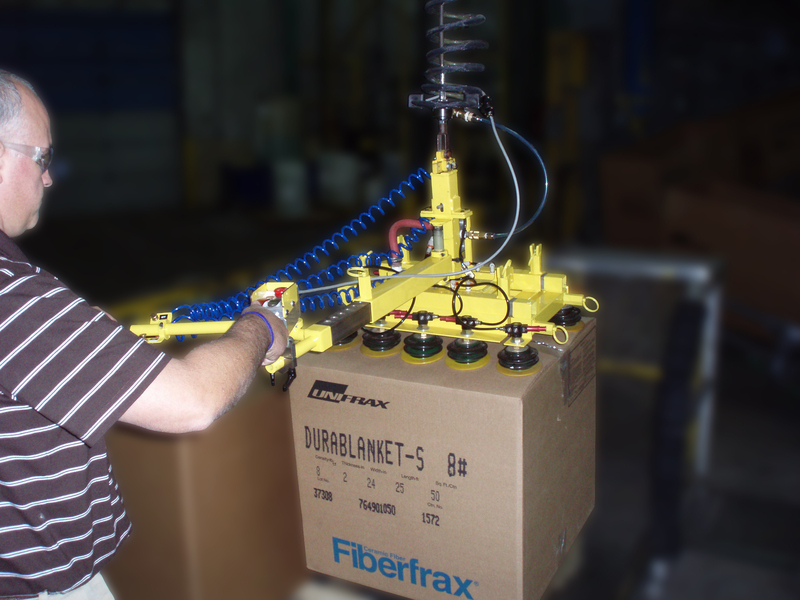 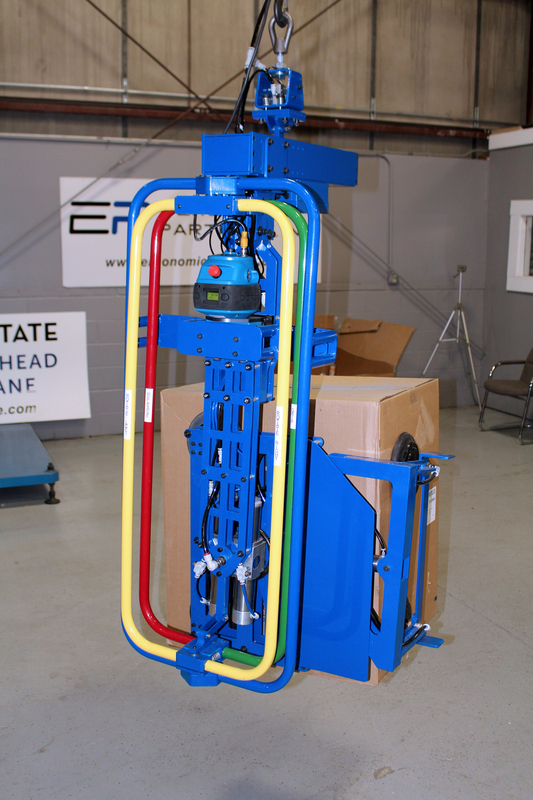 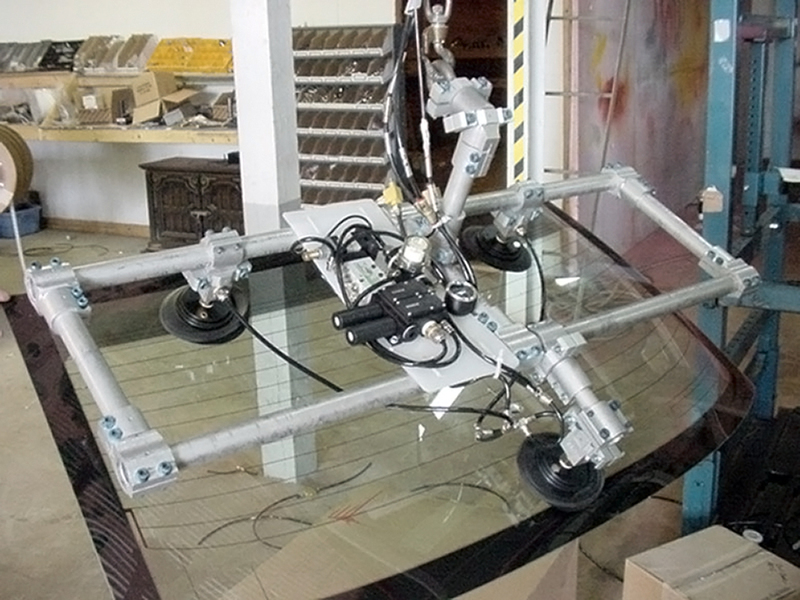 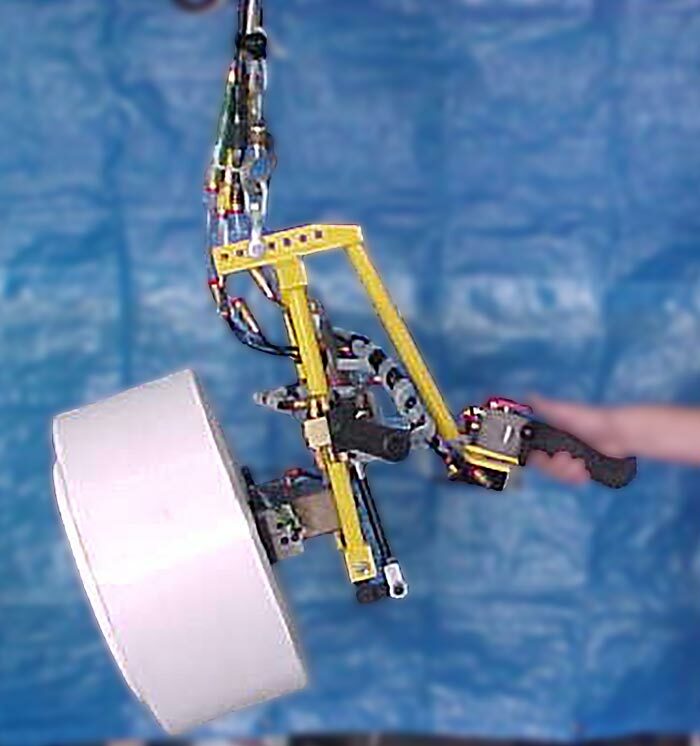 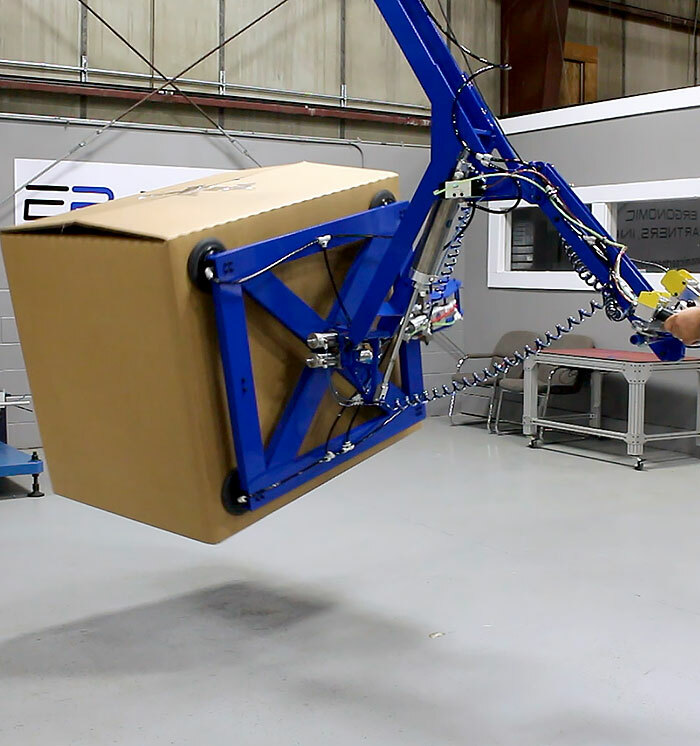 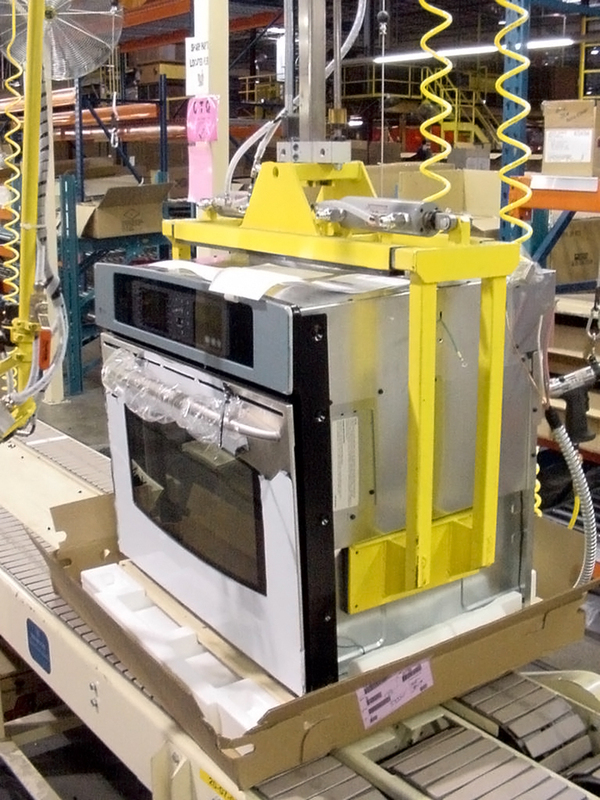 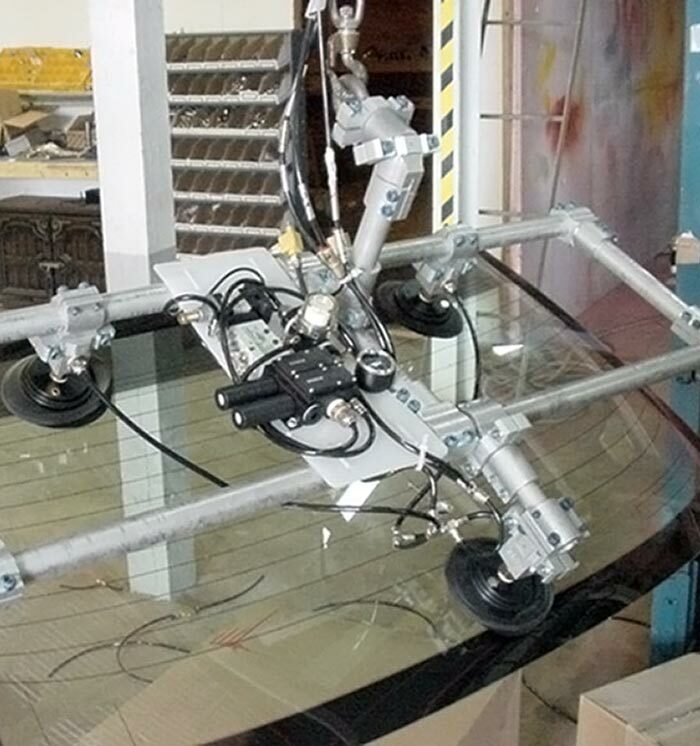 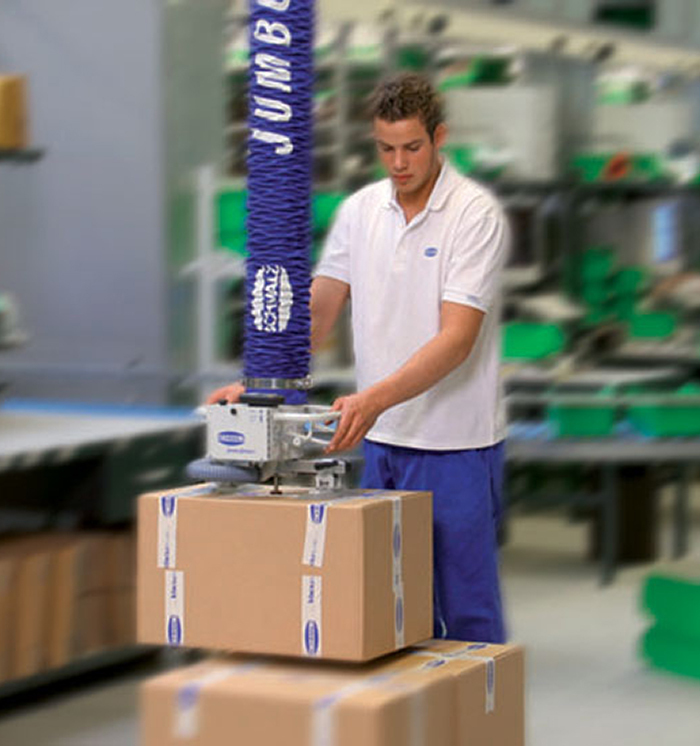 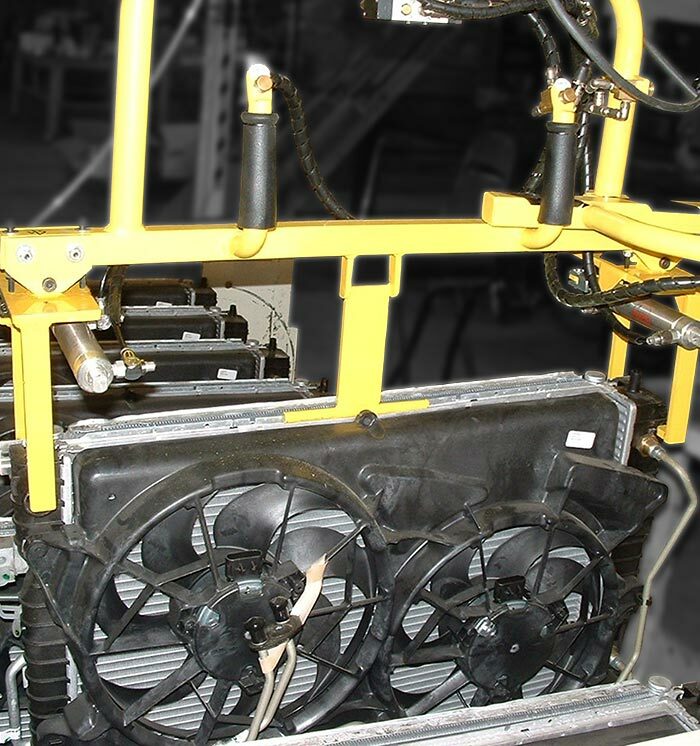 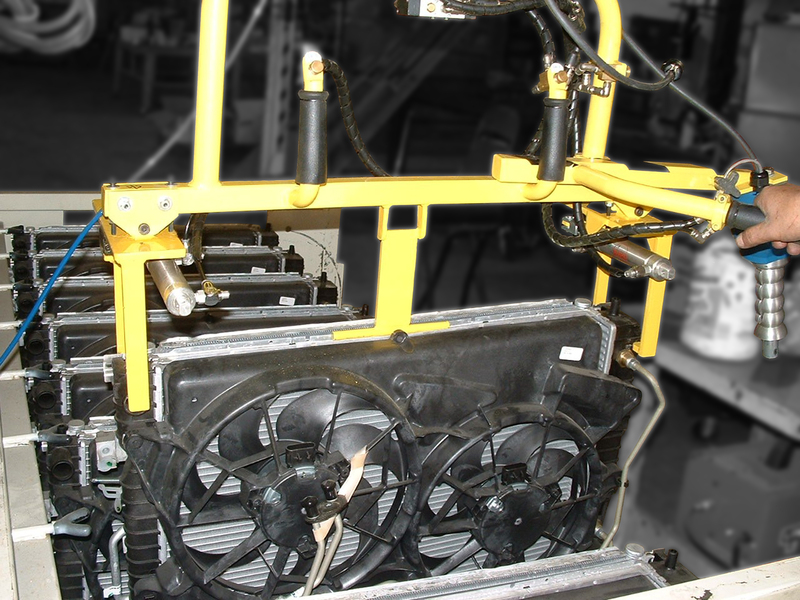 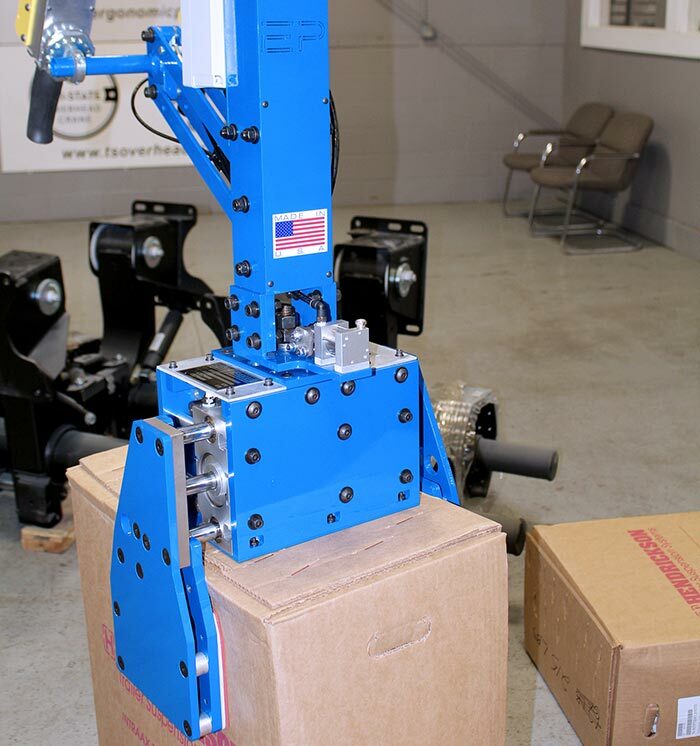 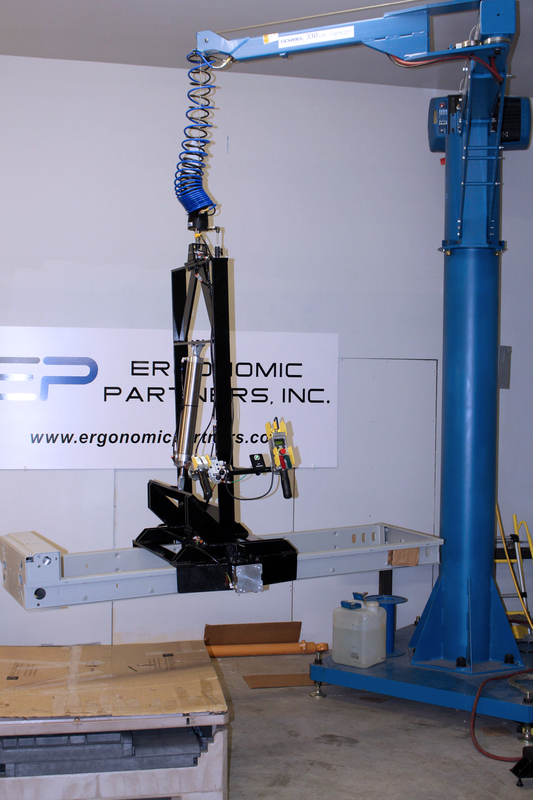 Ergonomic Lift Assist for Boxes, Rolls, Glass, Panels, Sheet Metal, Castings and Materials. 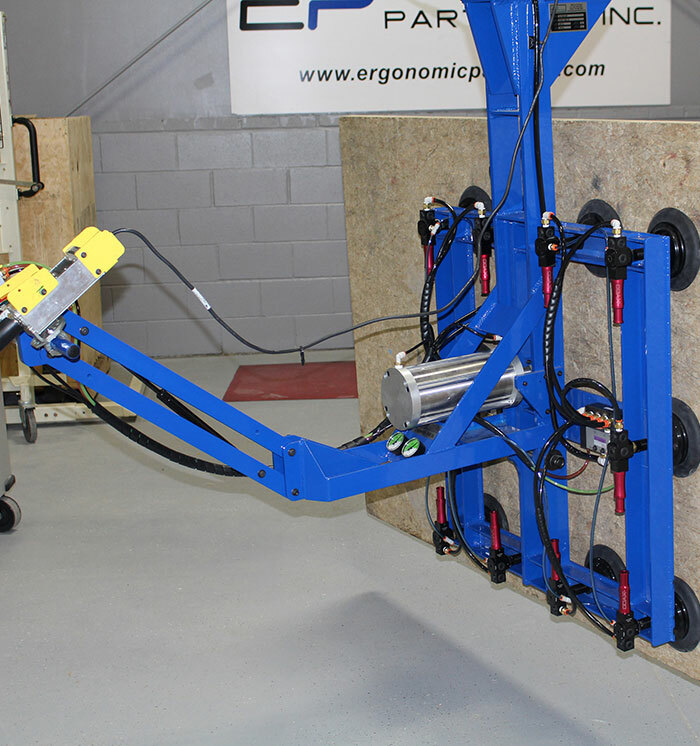 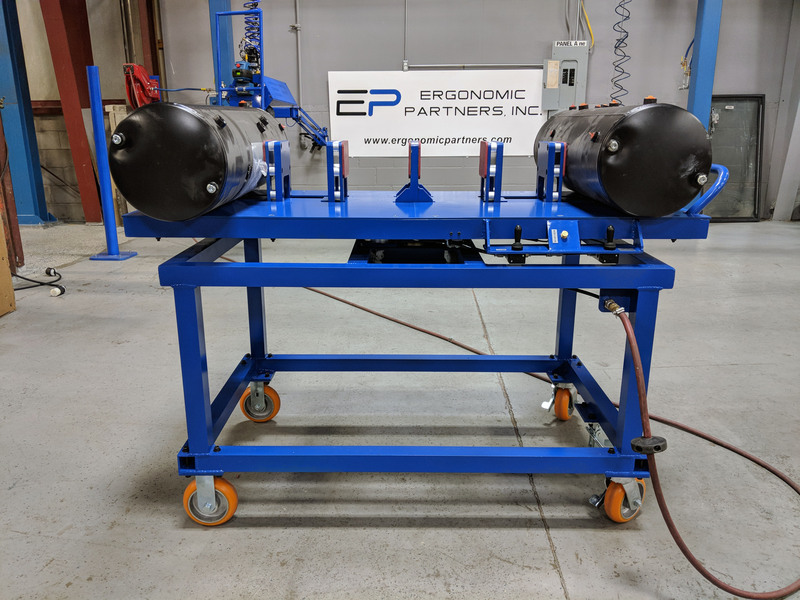 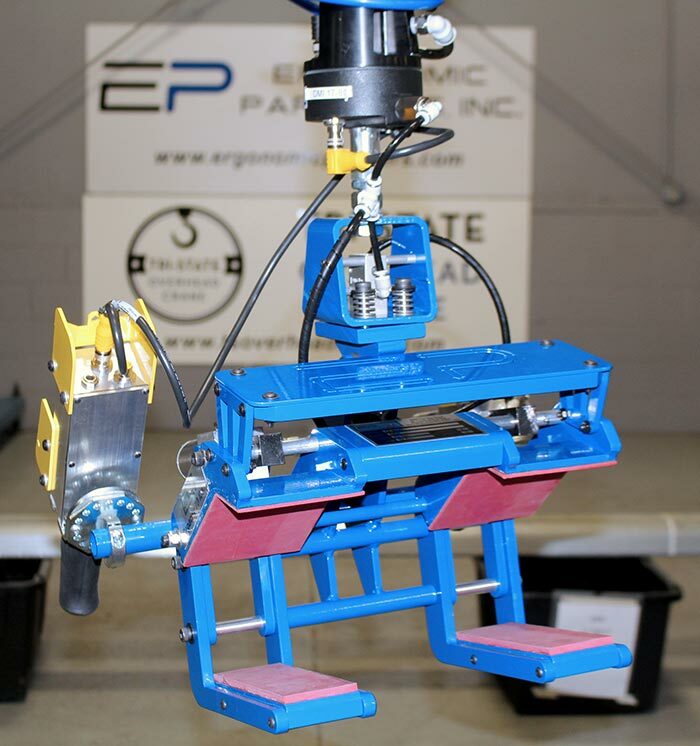 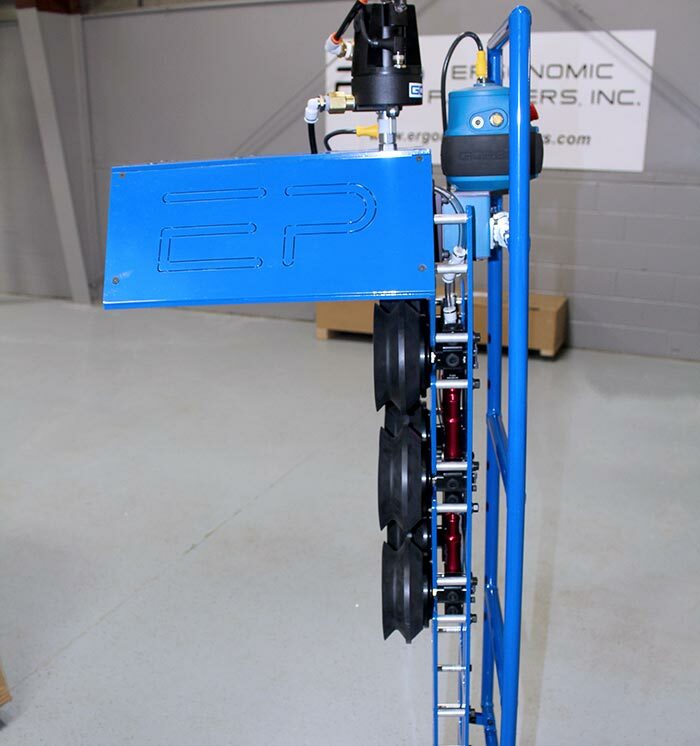 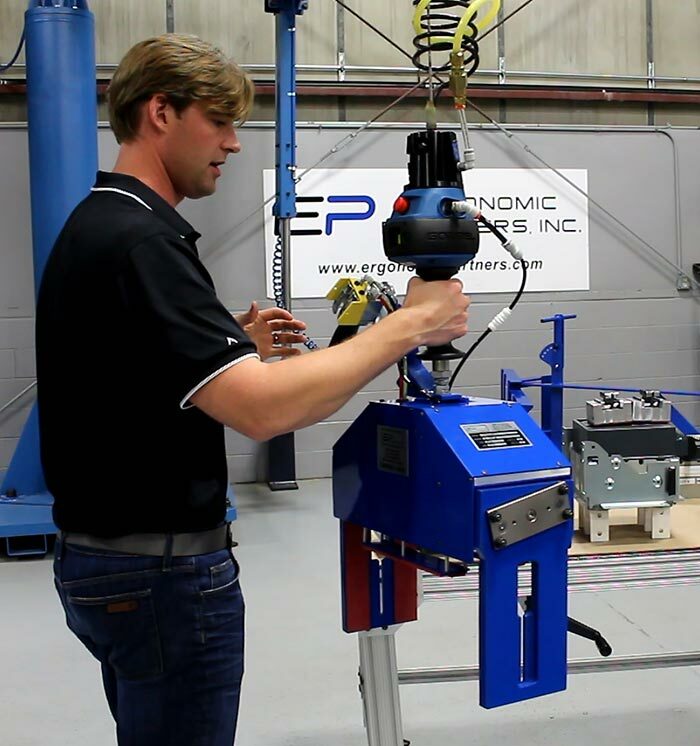 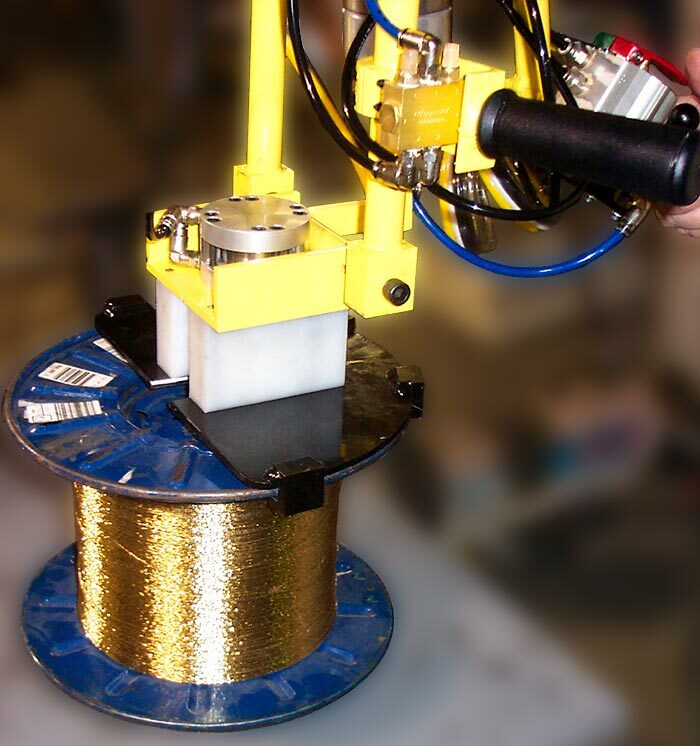 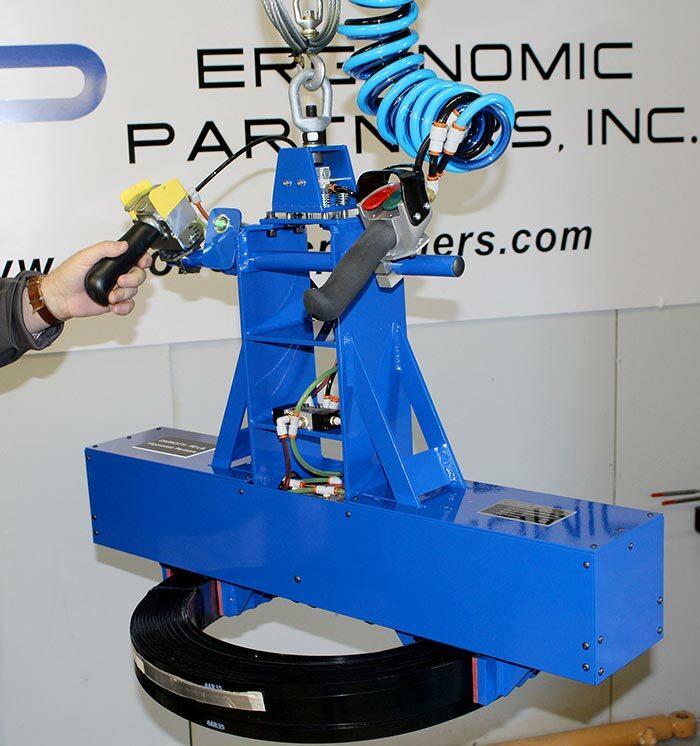 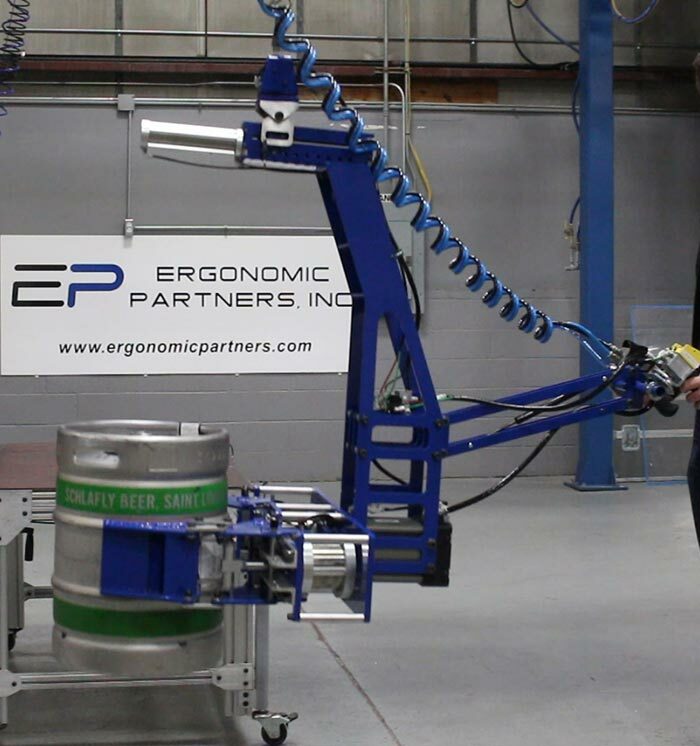 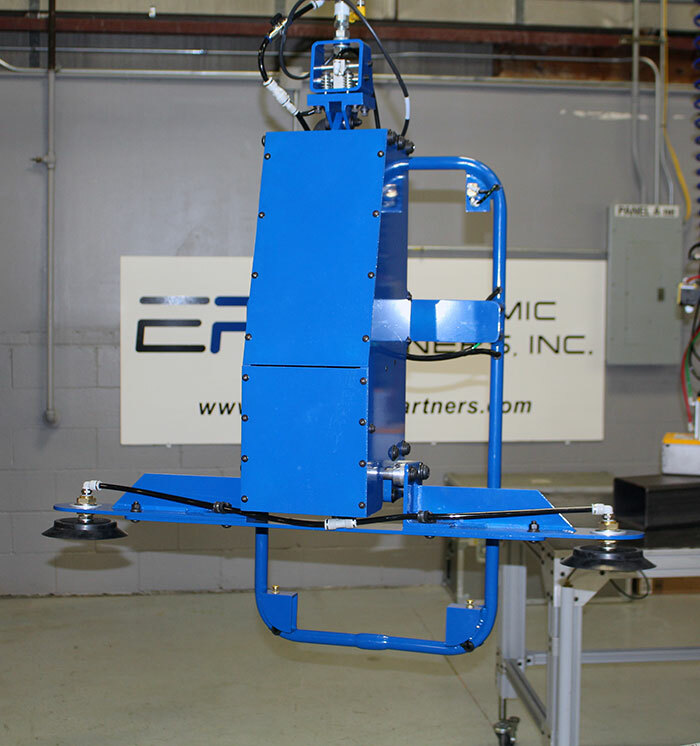 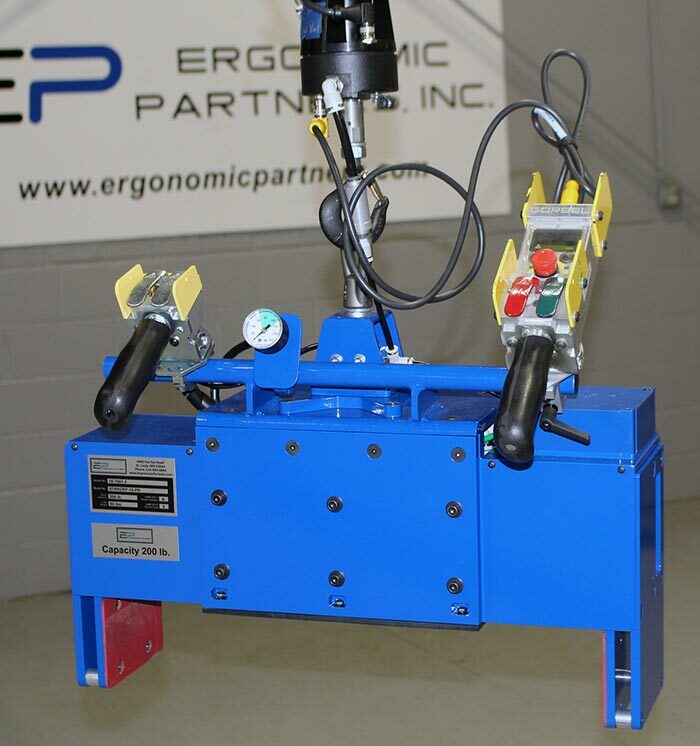 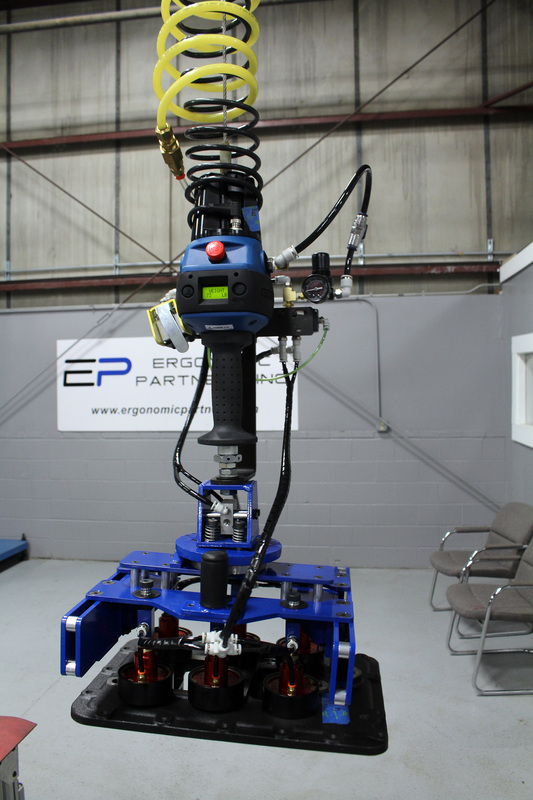 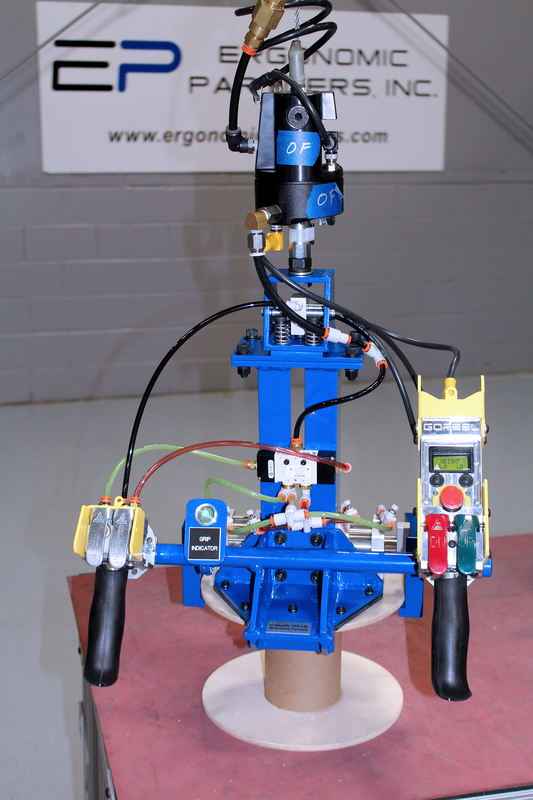 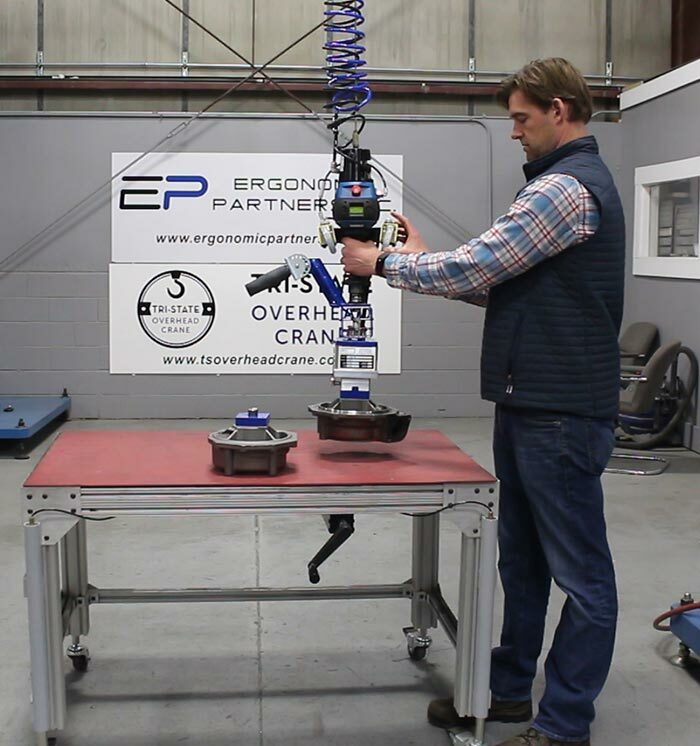 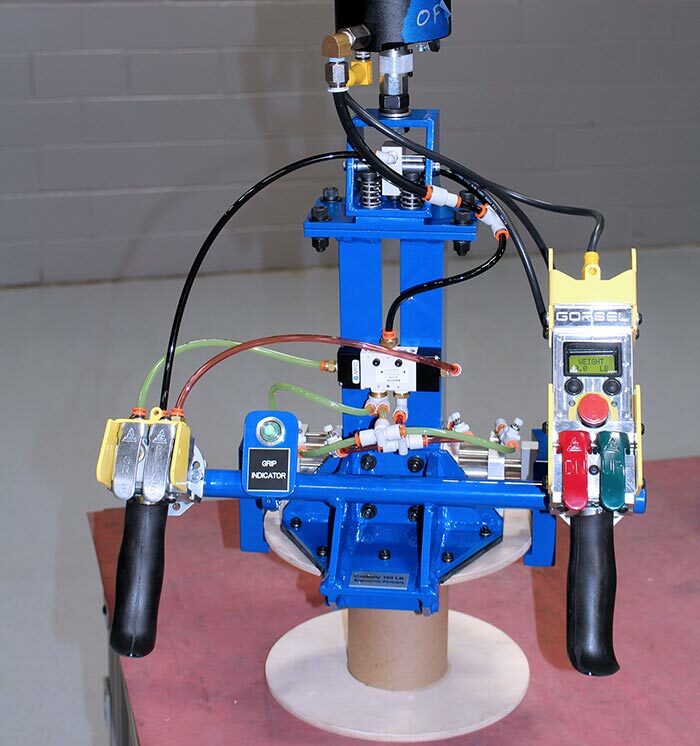 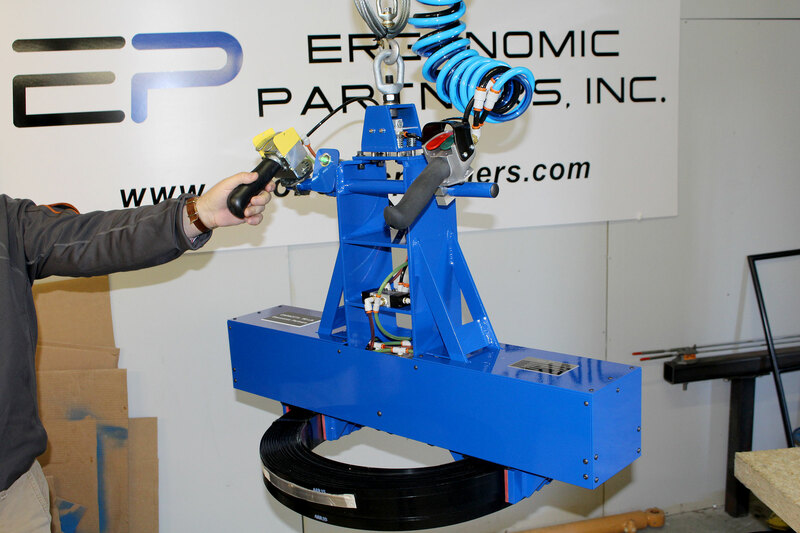 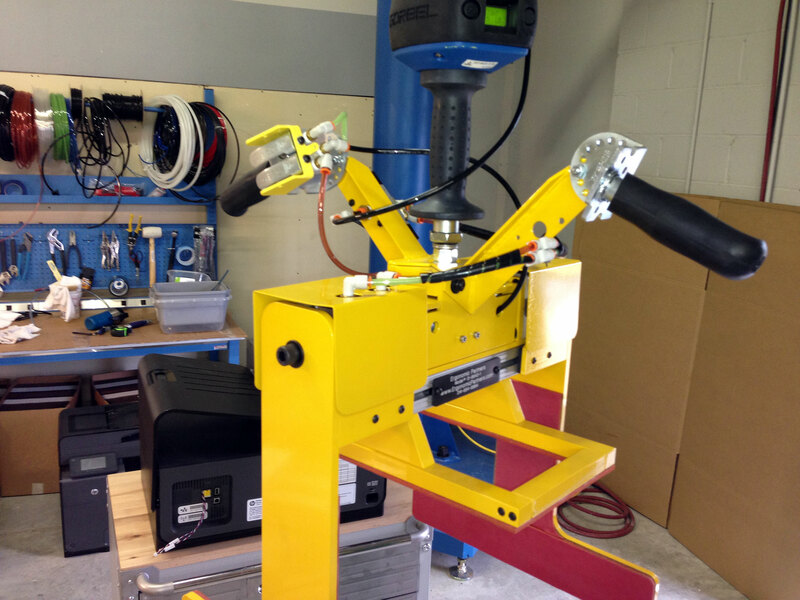 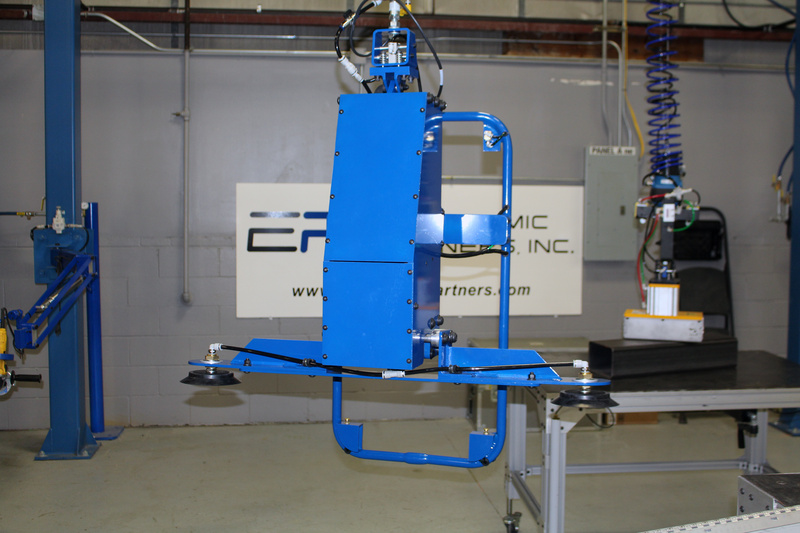 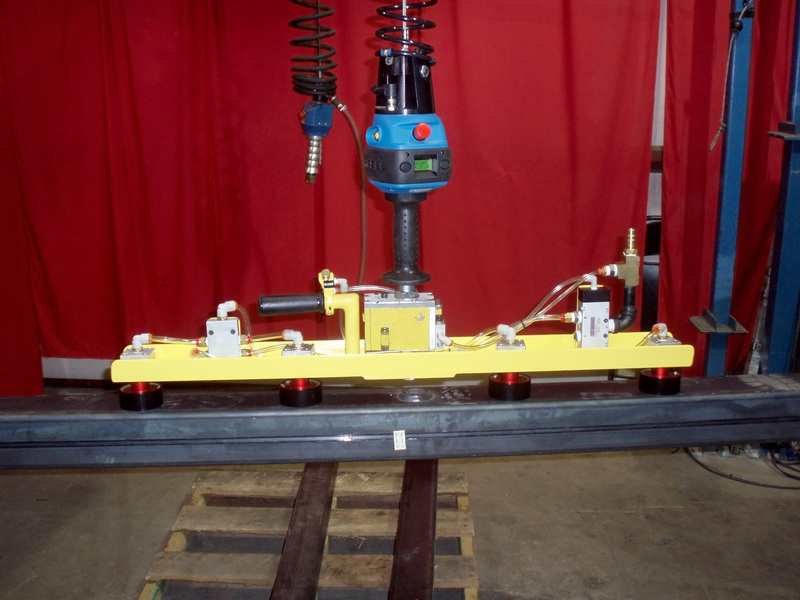 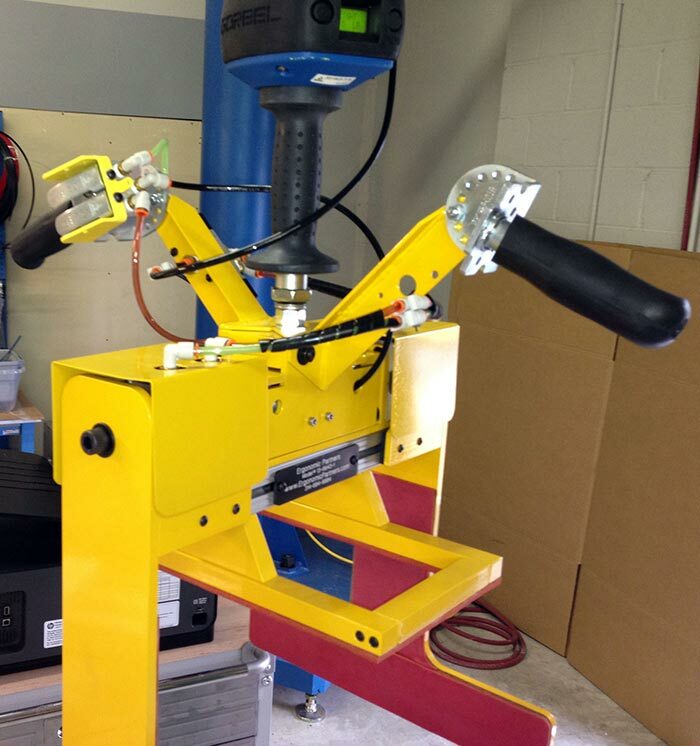 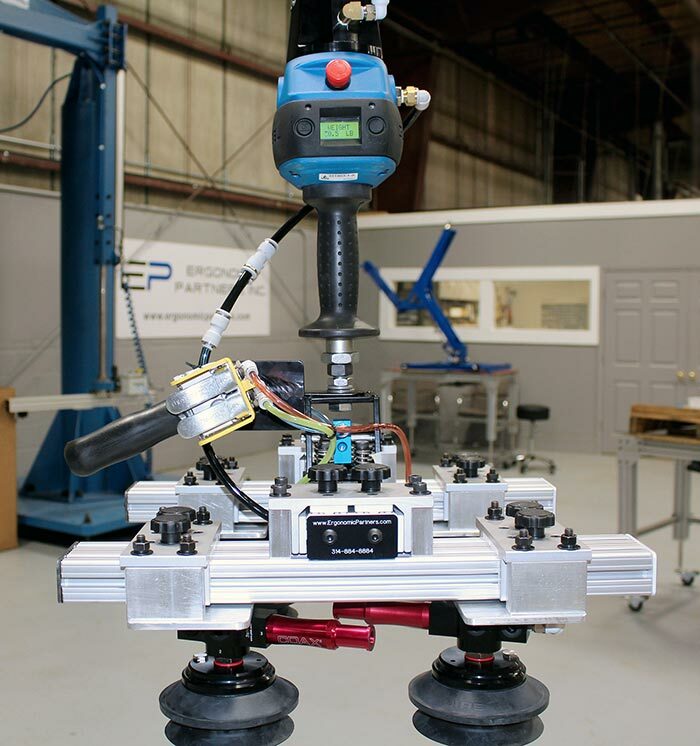 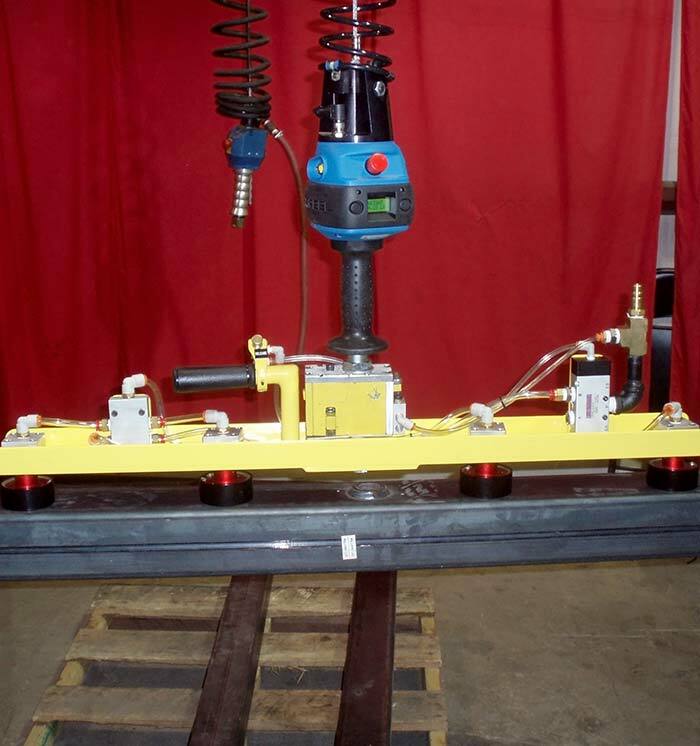 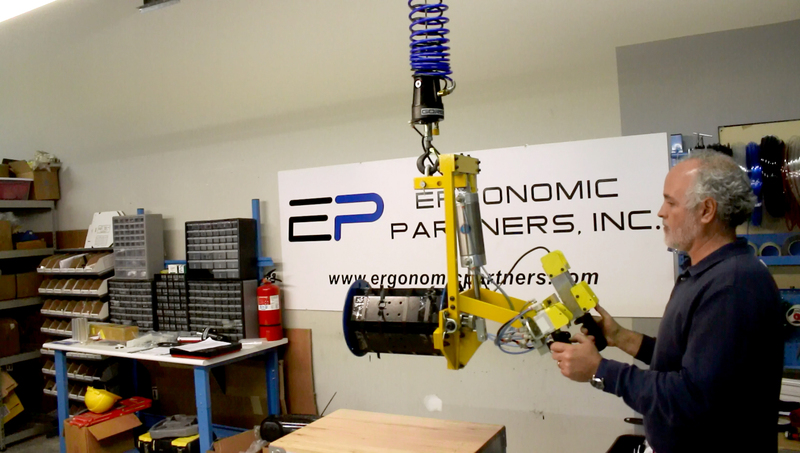 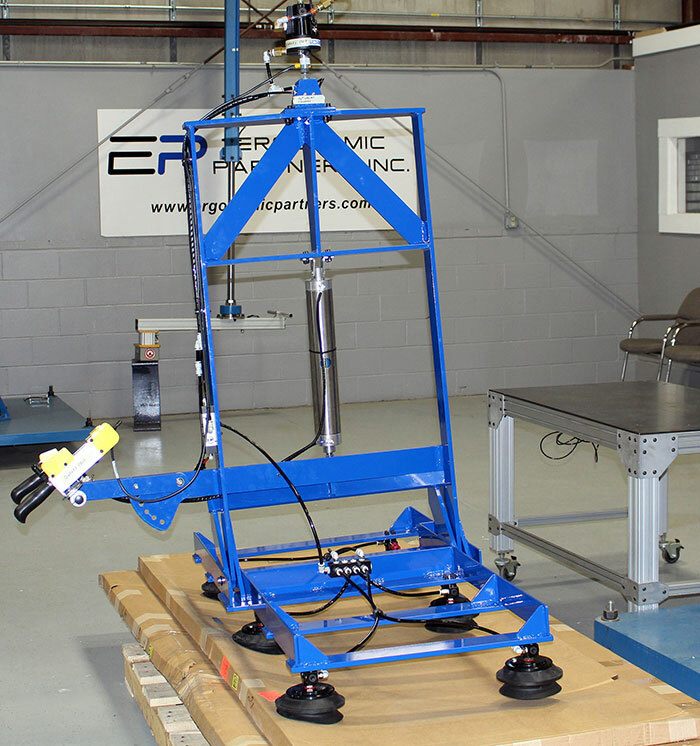 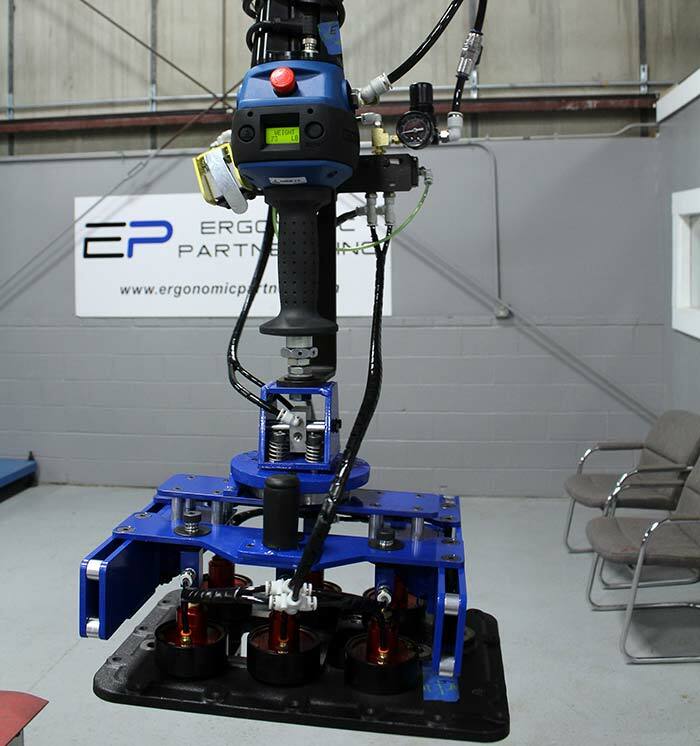 Ergonomic Partners manufacturers custom lift assist, vacuum lifters, lift assists, pneumatic grippers, electromagnet tooling, permanent magnet grippers and other custom end effectors for all industries. 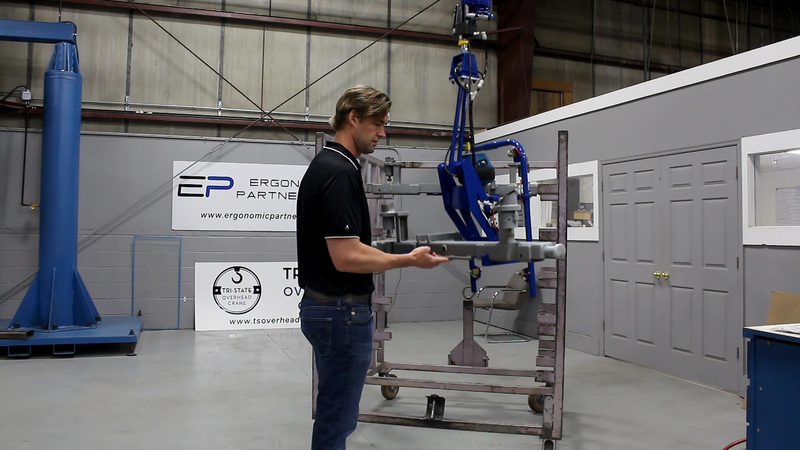 Why Use Ergonomic Lift Assists? 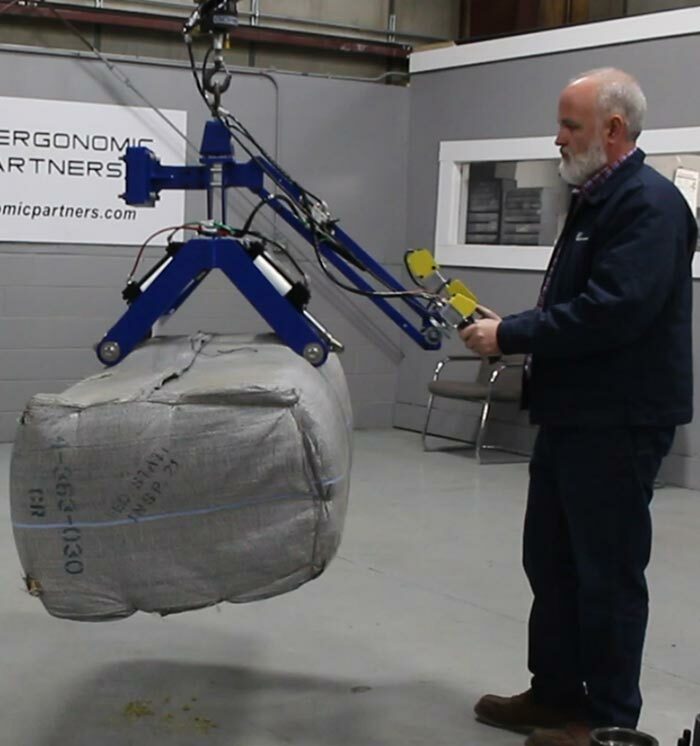 Highly repetitive manual lifting of heavy awkward loads can contribute to back, neck, shoulder, and wrist strain. 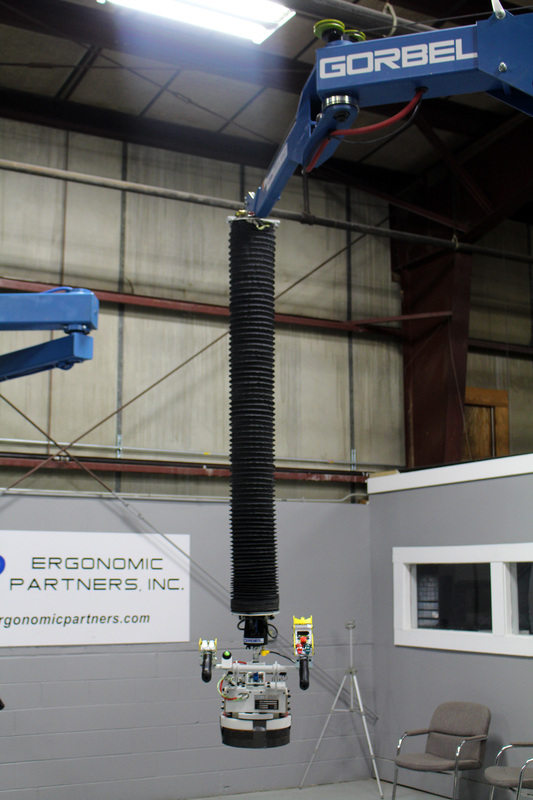 By eliminating these unnatural motions, ergonomic lift assists greatly reduce the risk of a repetitive stress injury. 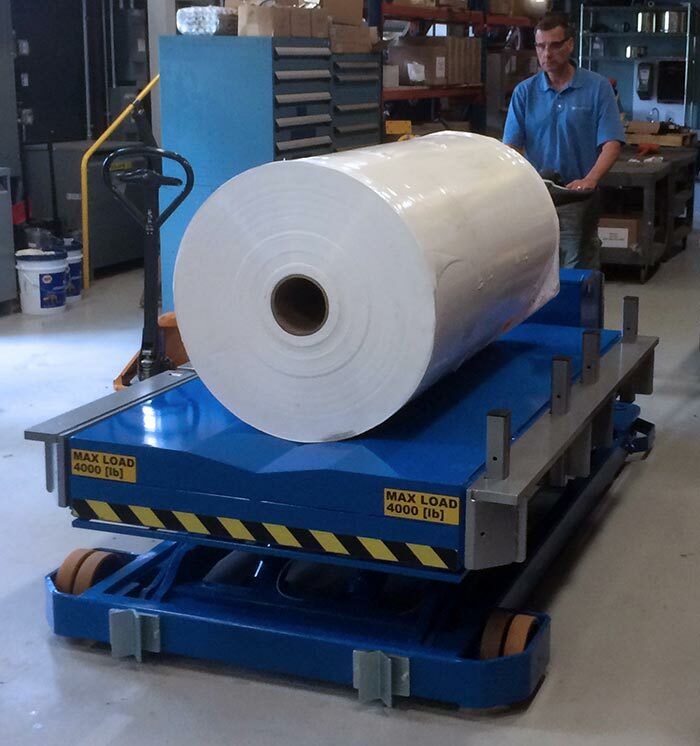 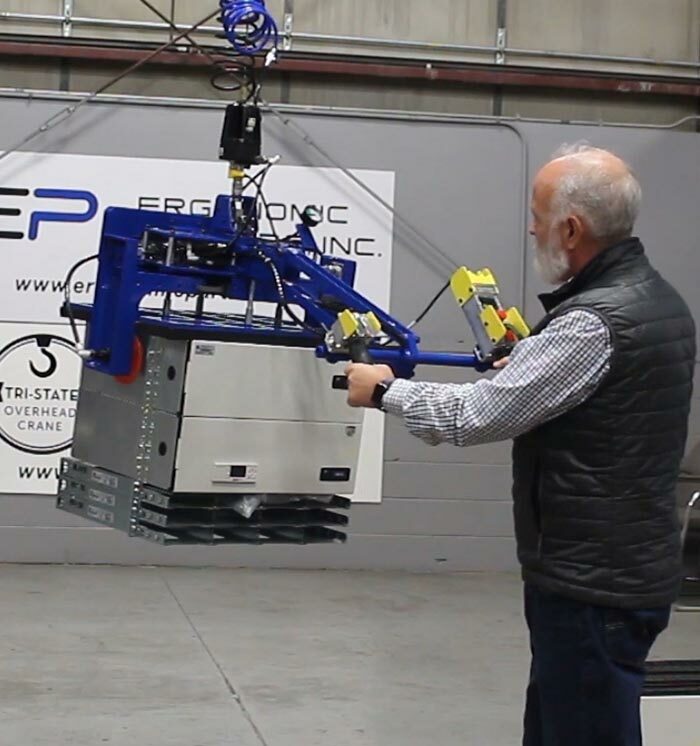 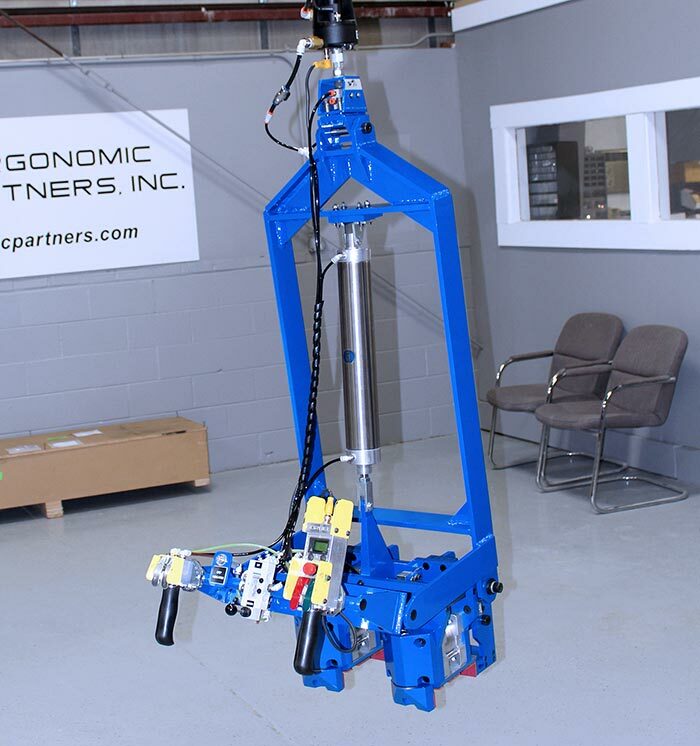 Special lifting devices for rolls, glass, or panels can be more productive than manual handling, especially when long work hours and fatigue are considered as contributors to costly repetitive motion, musculoskeletal, and back injuries. 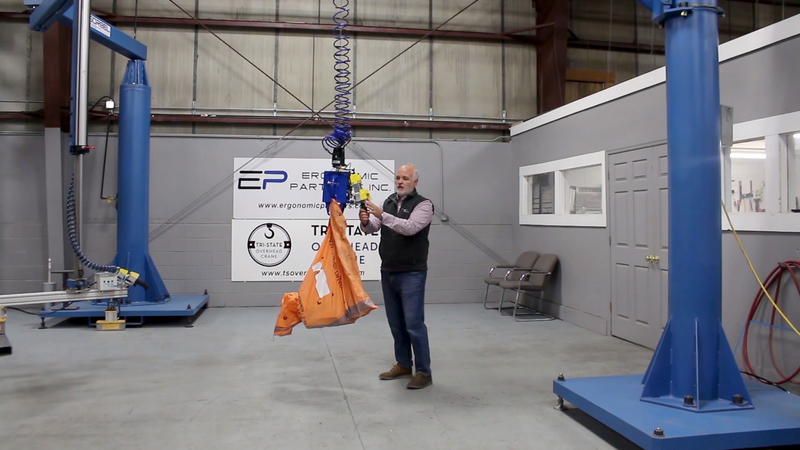 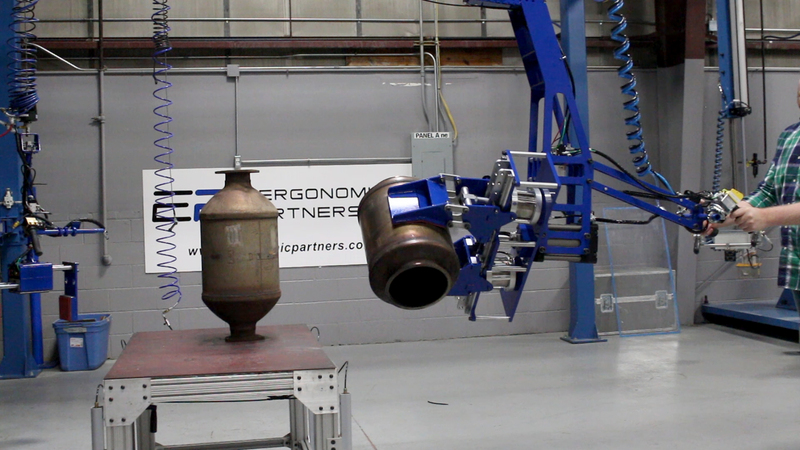 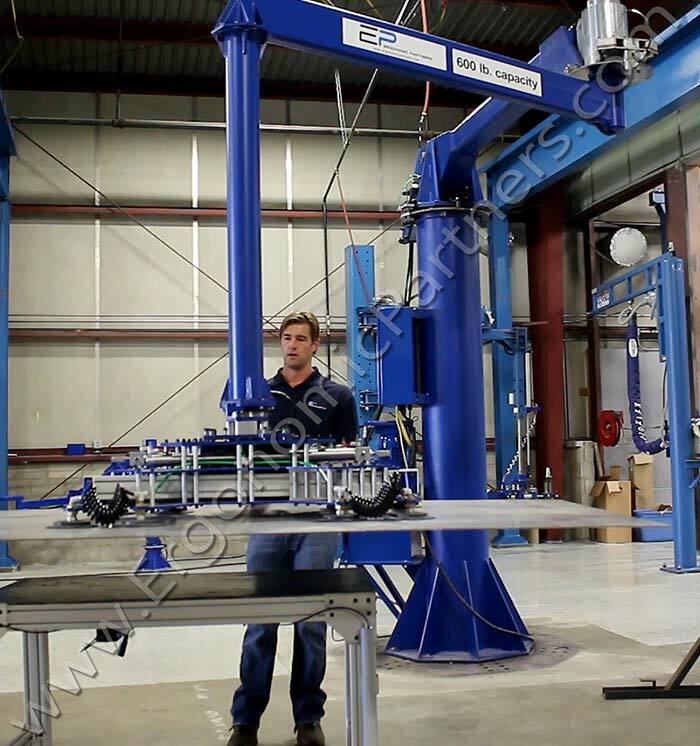 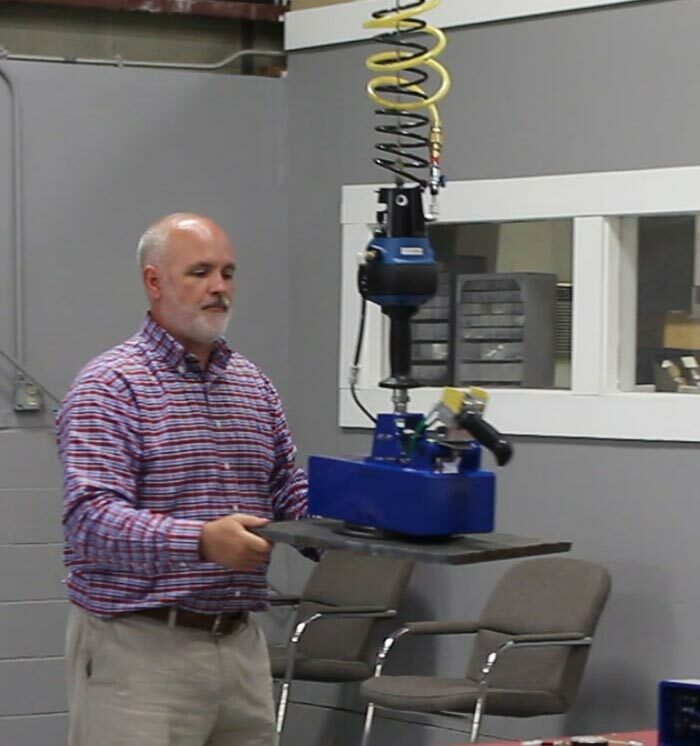 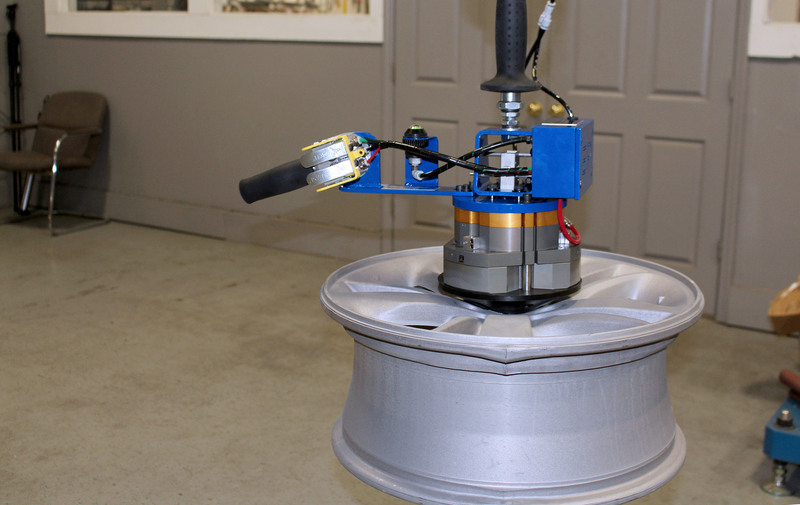 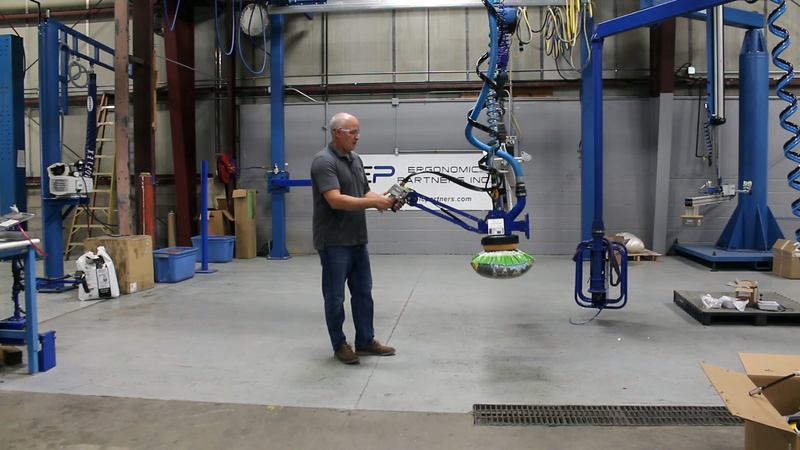 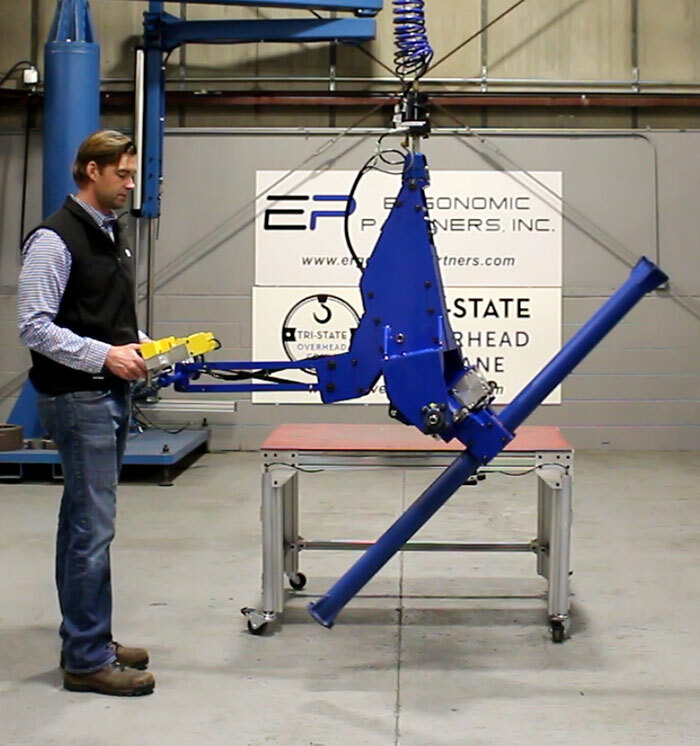 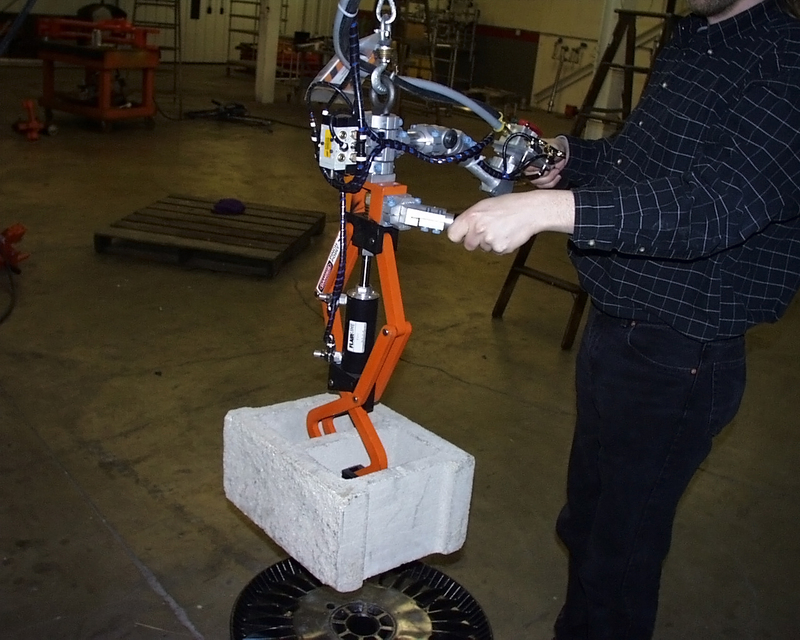 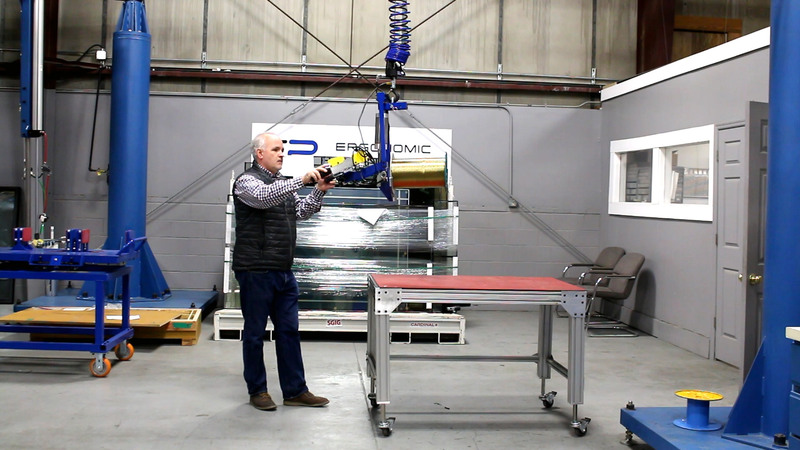 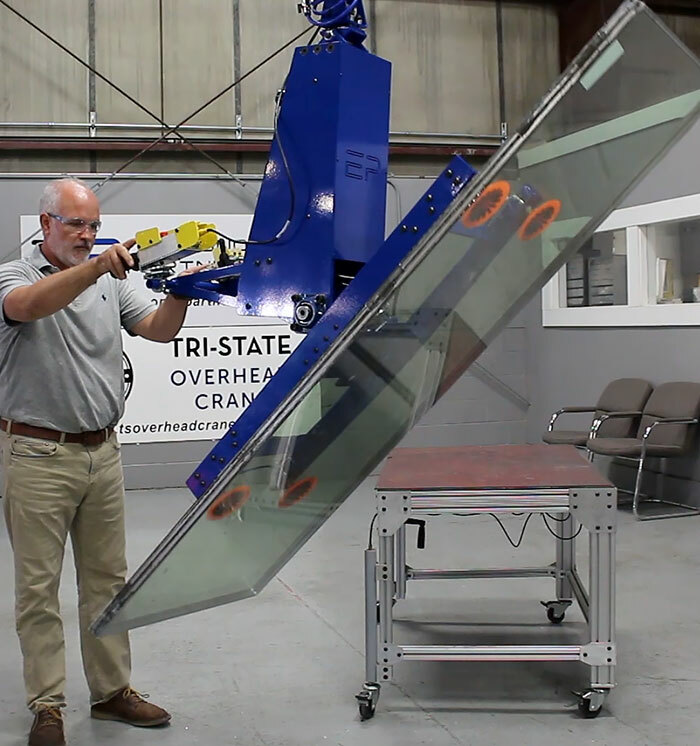 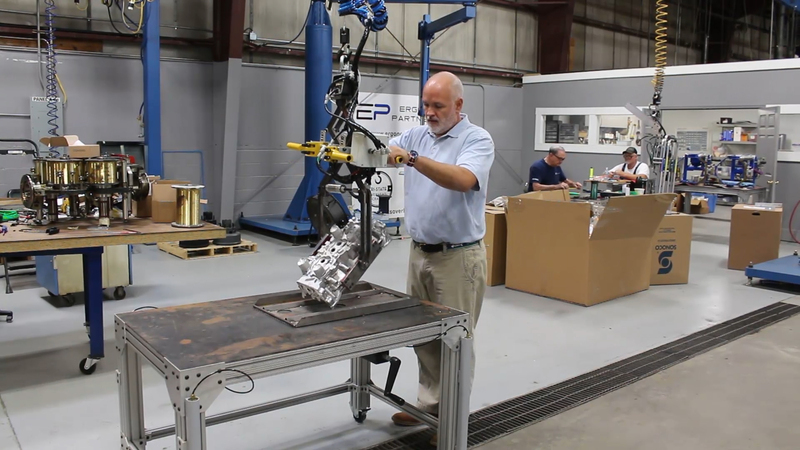 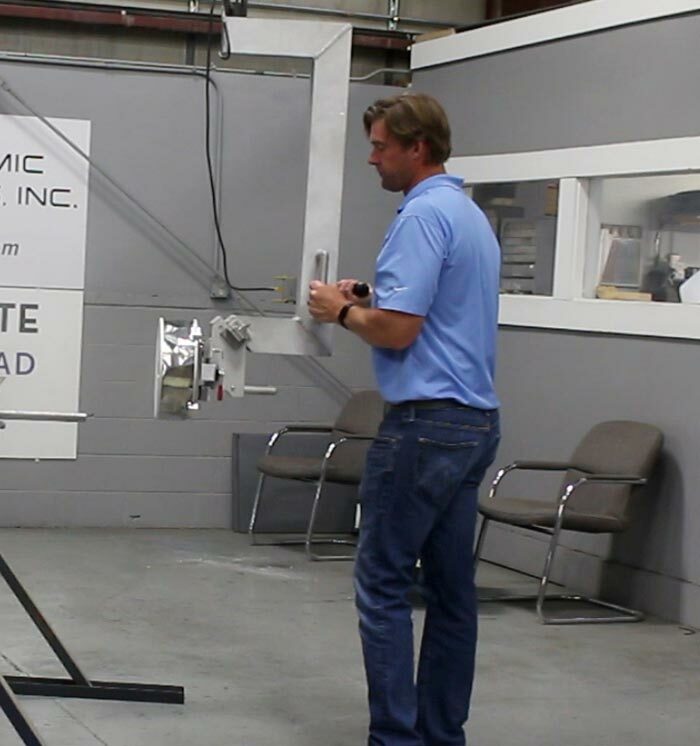 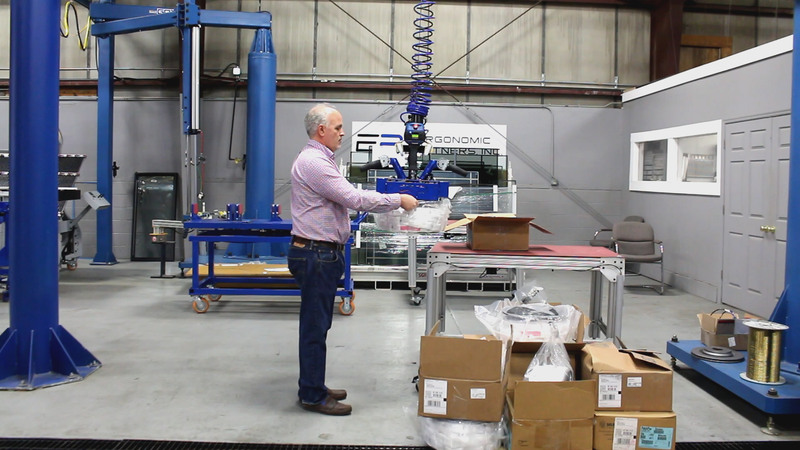 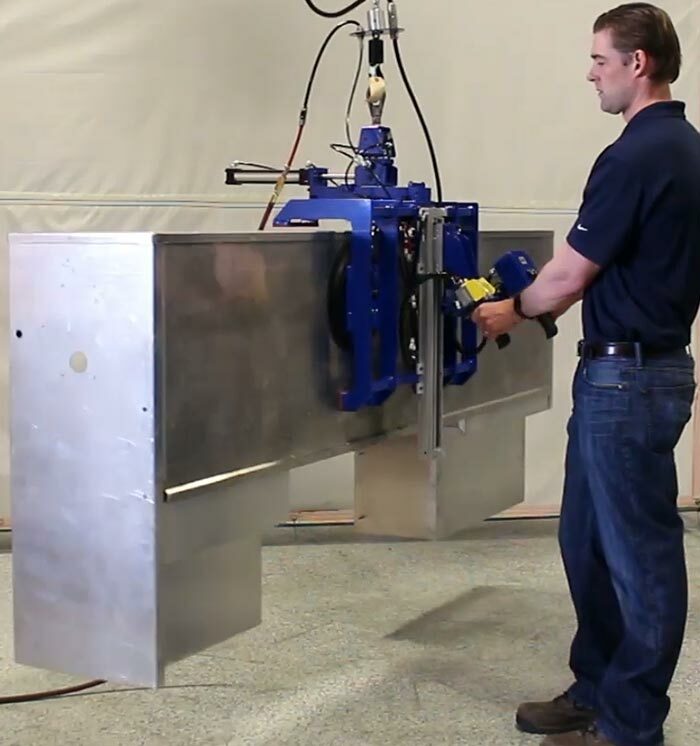 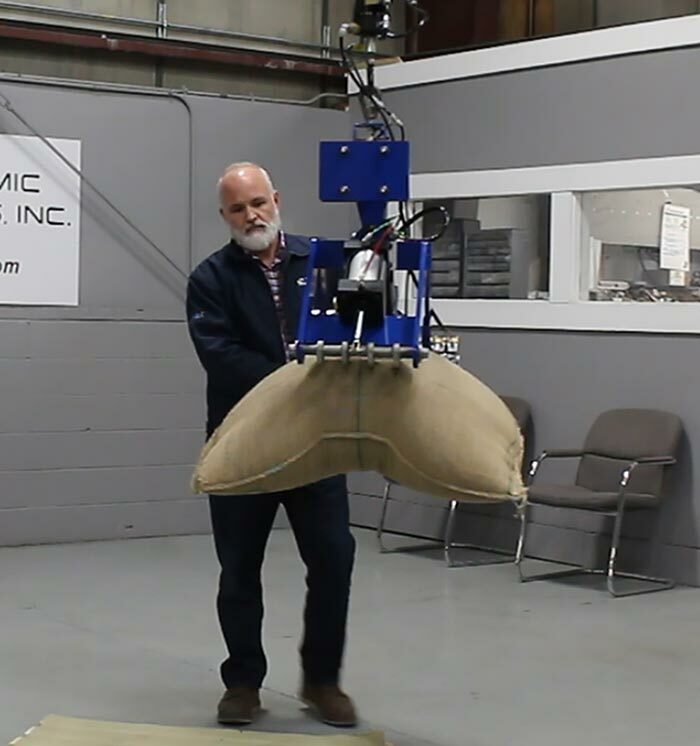 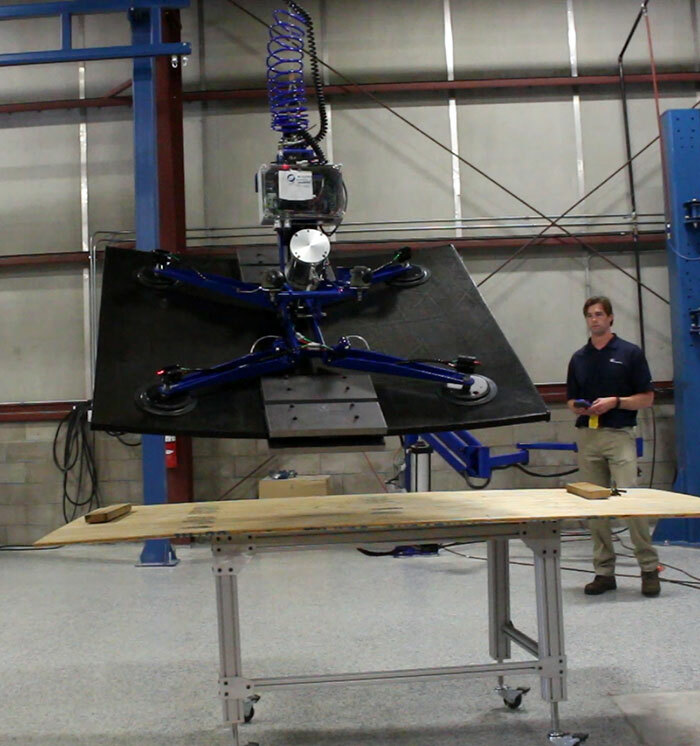 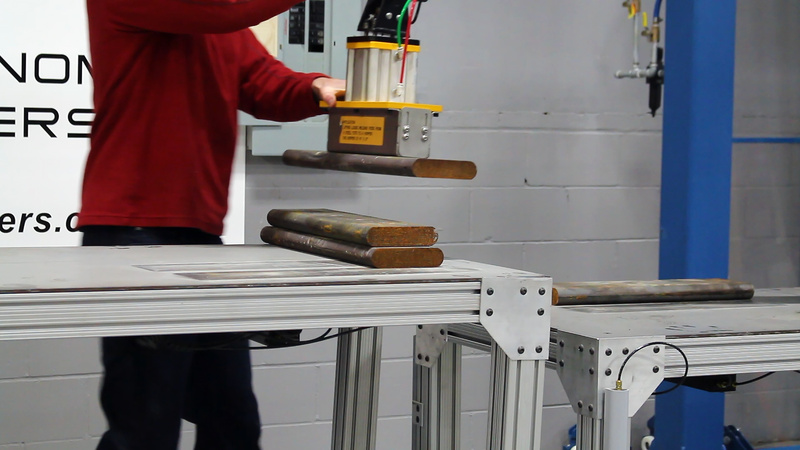 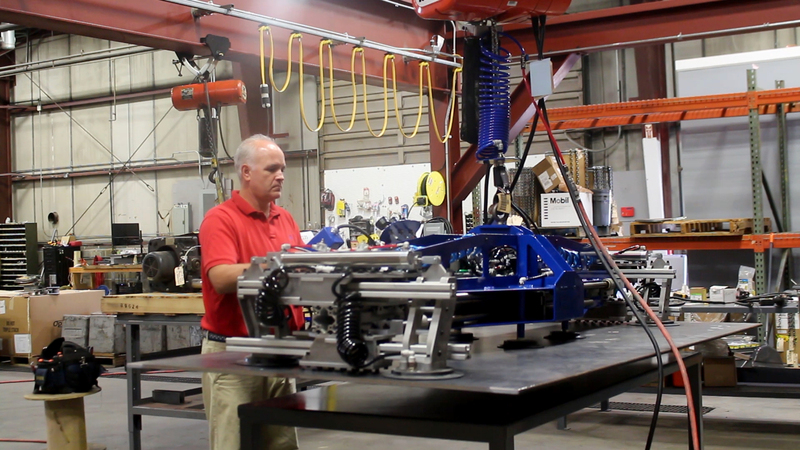 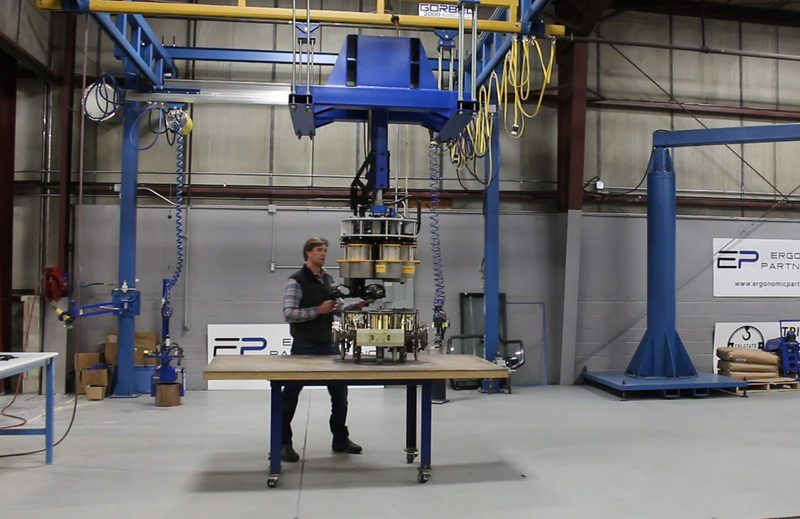 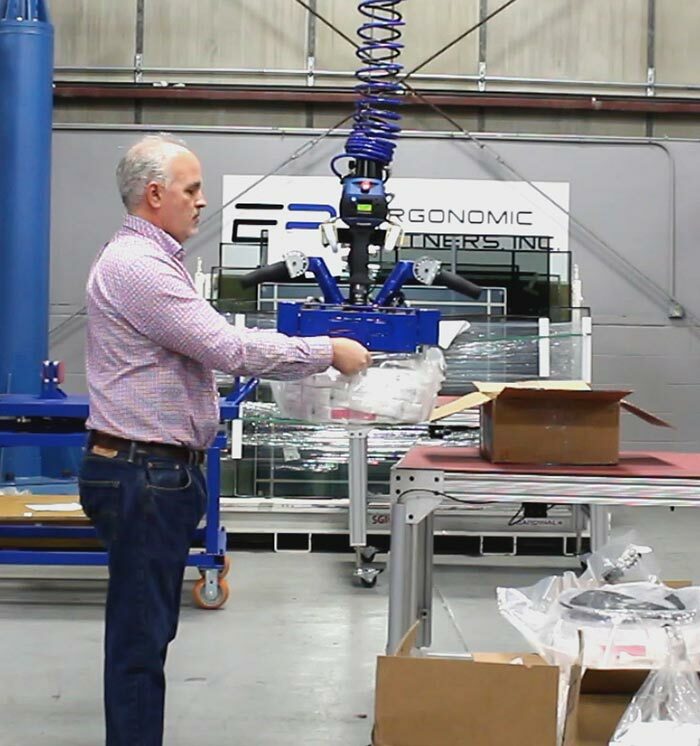 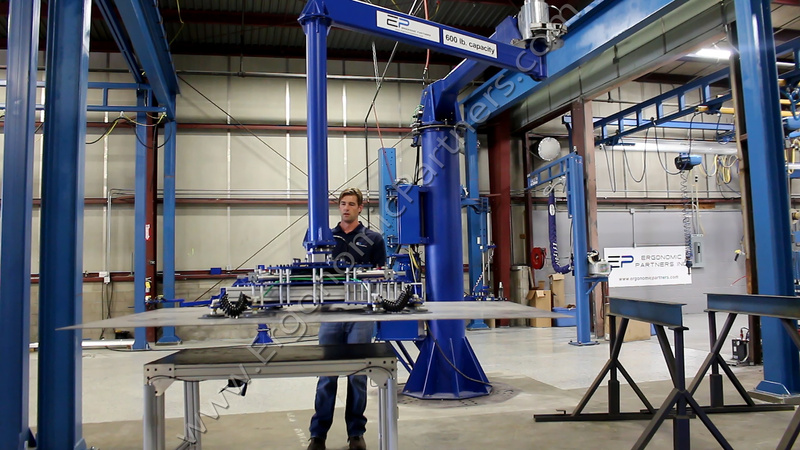 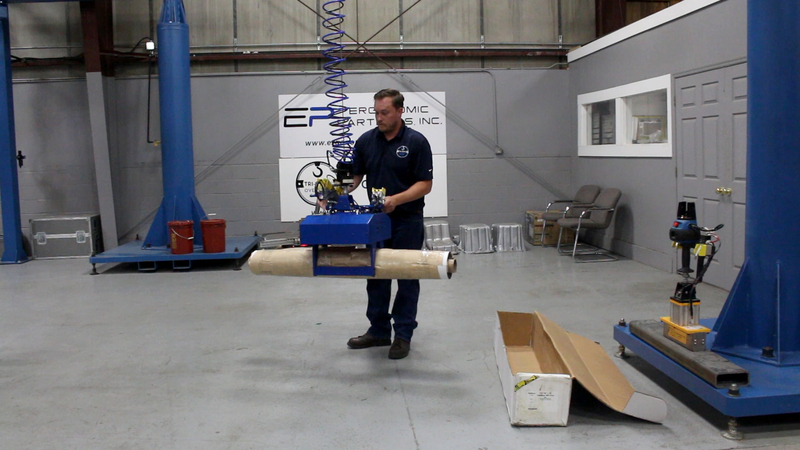 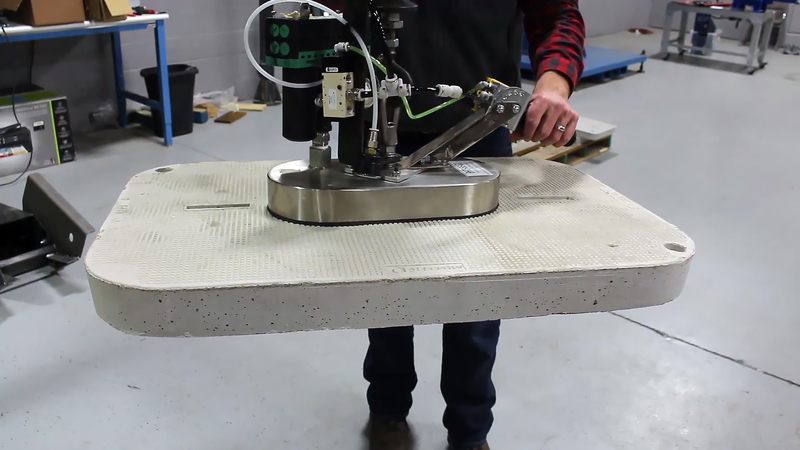 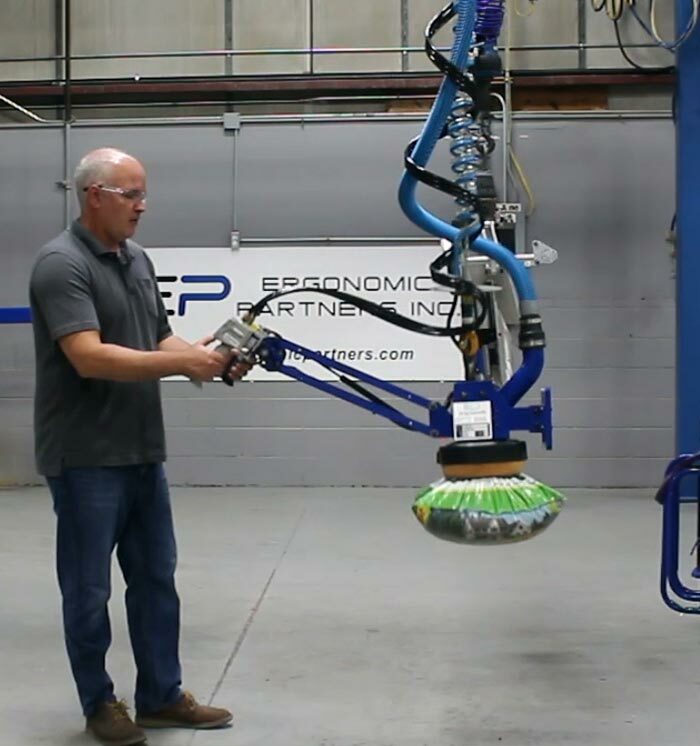 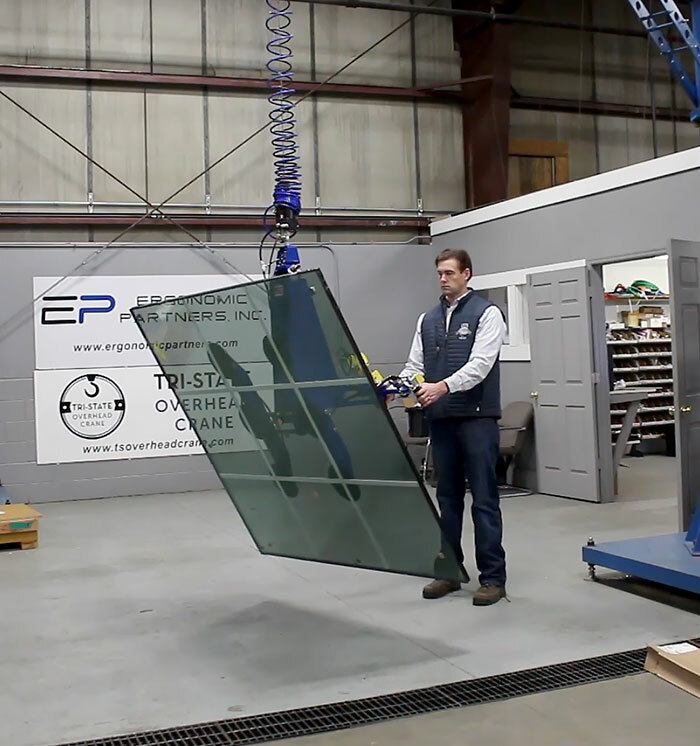 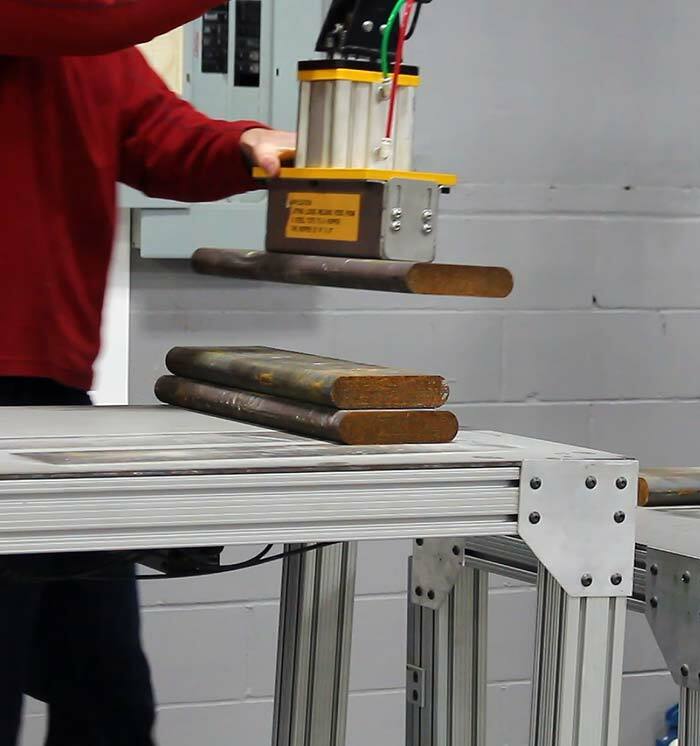 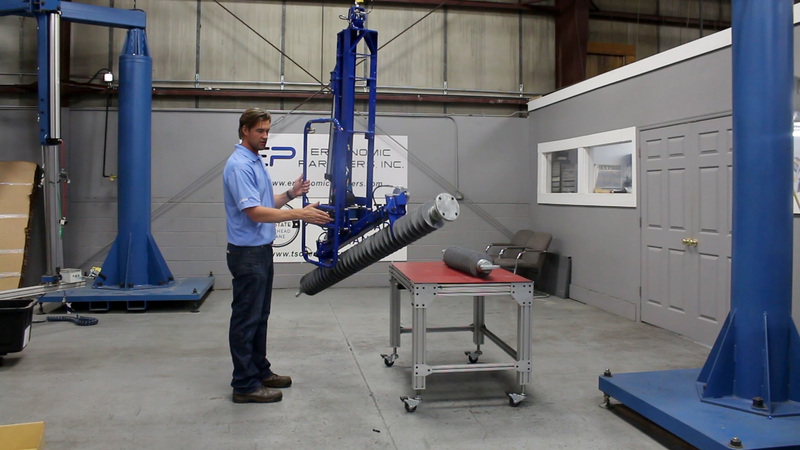 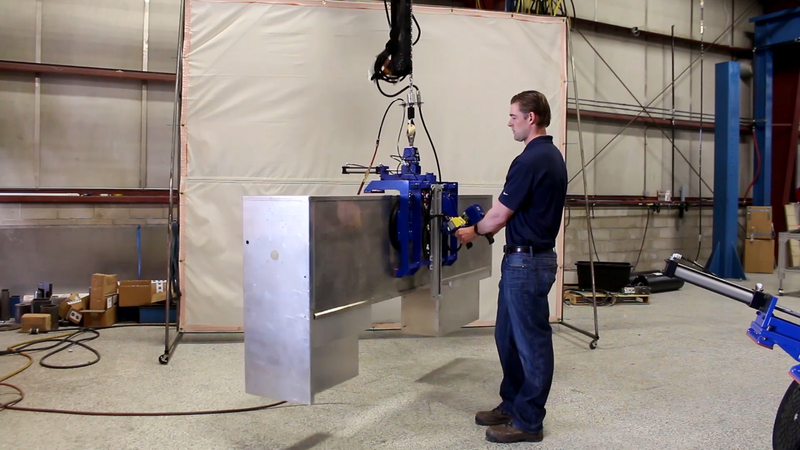 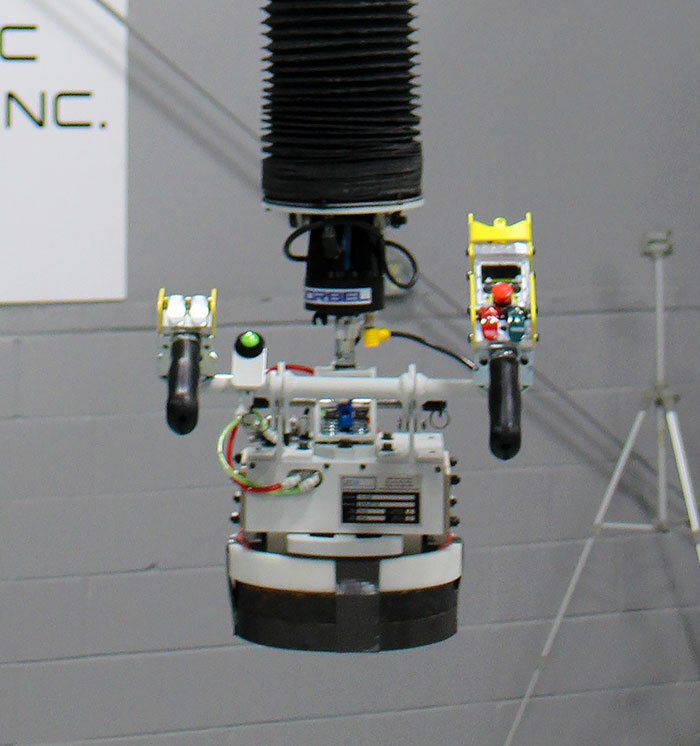 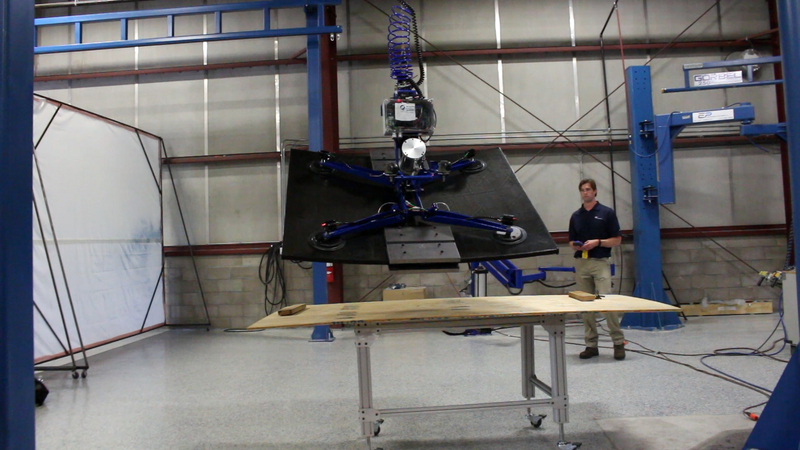 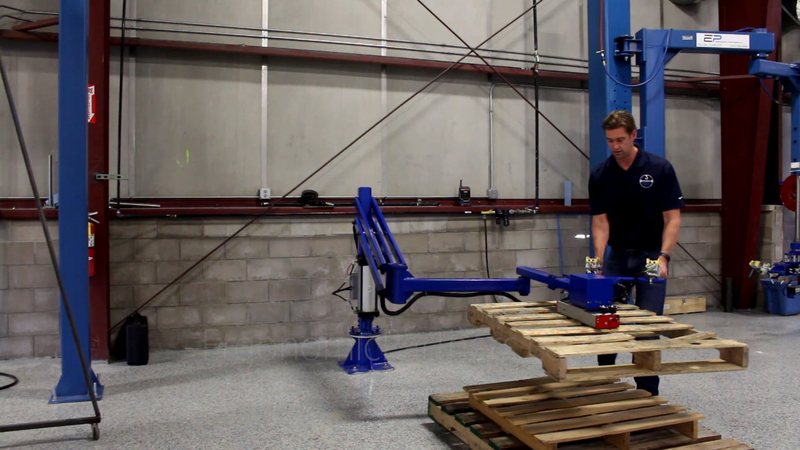 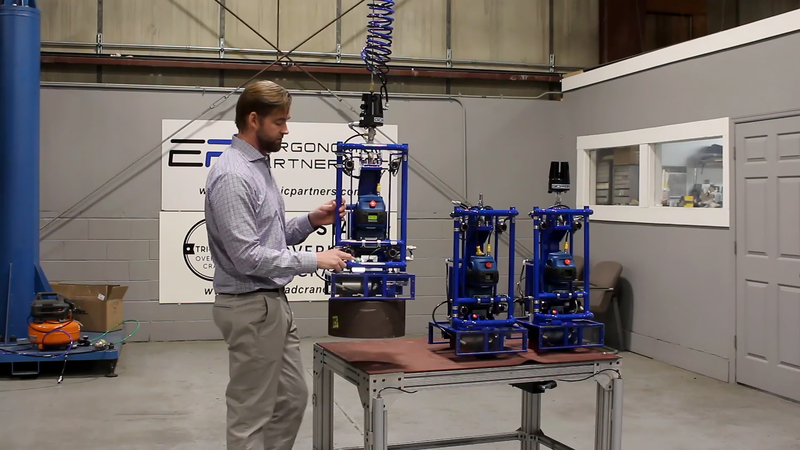 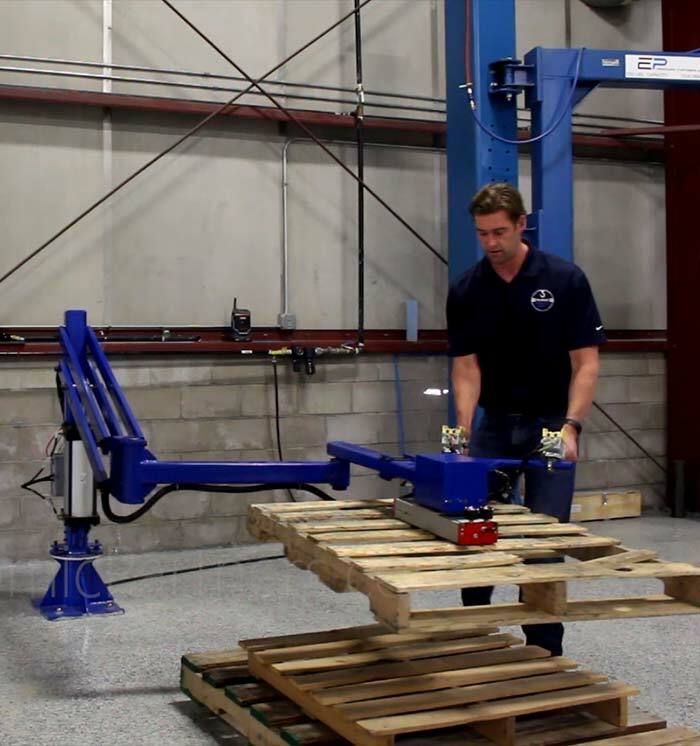 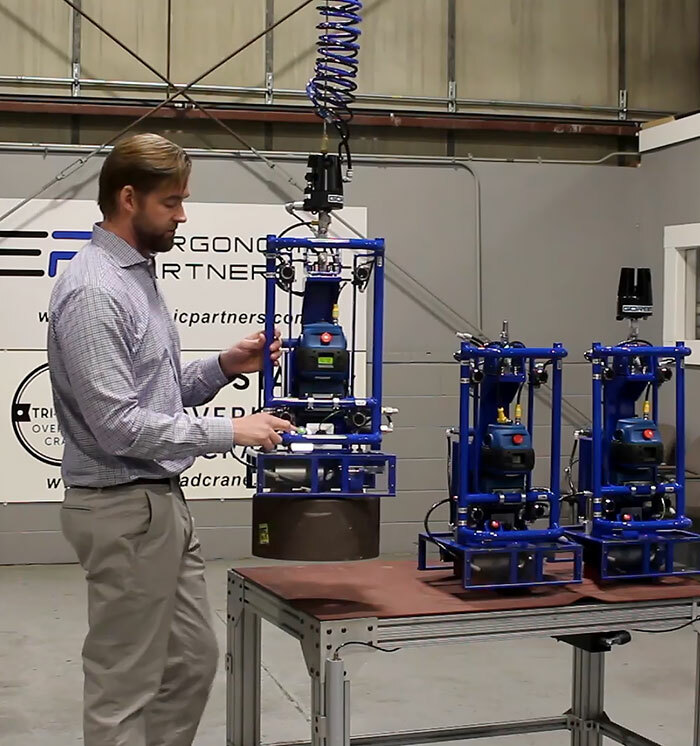 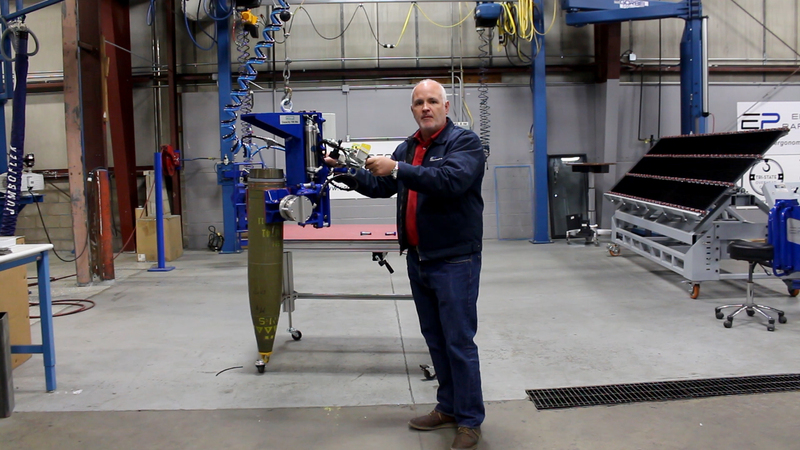 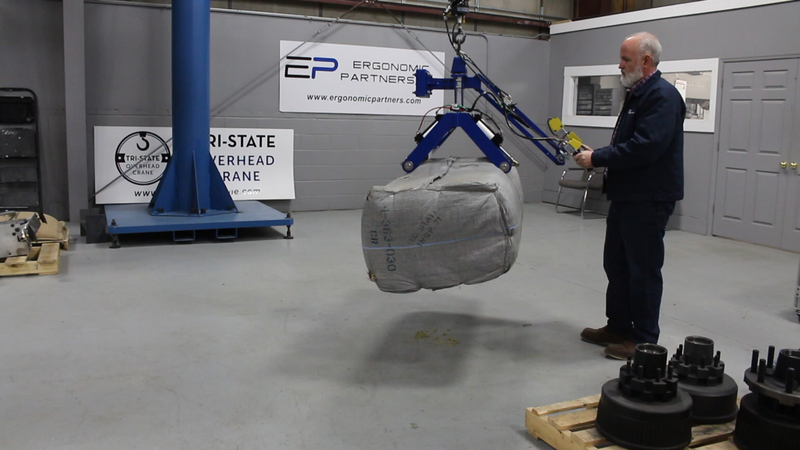 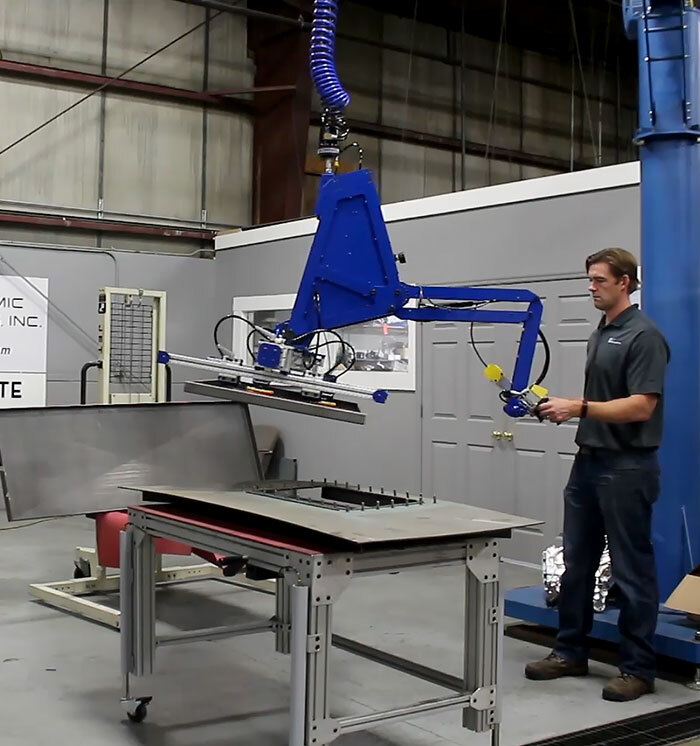 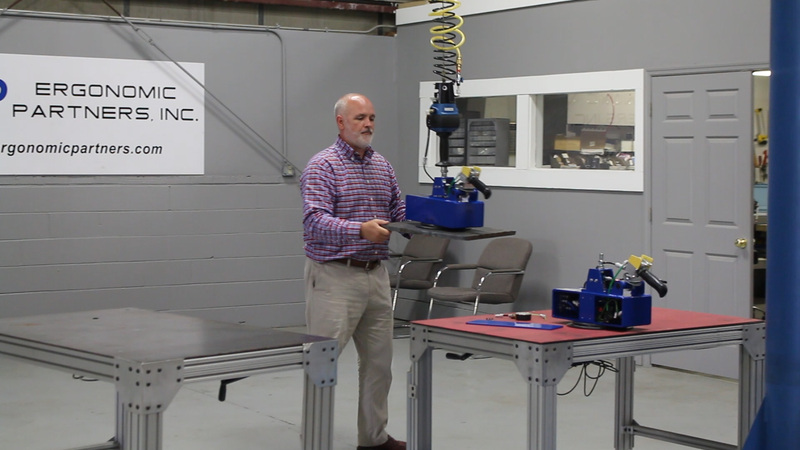 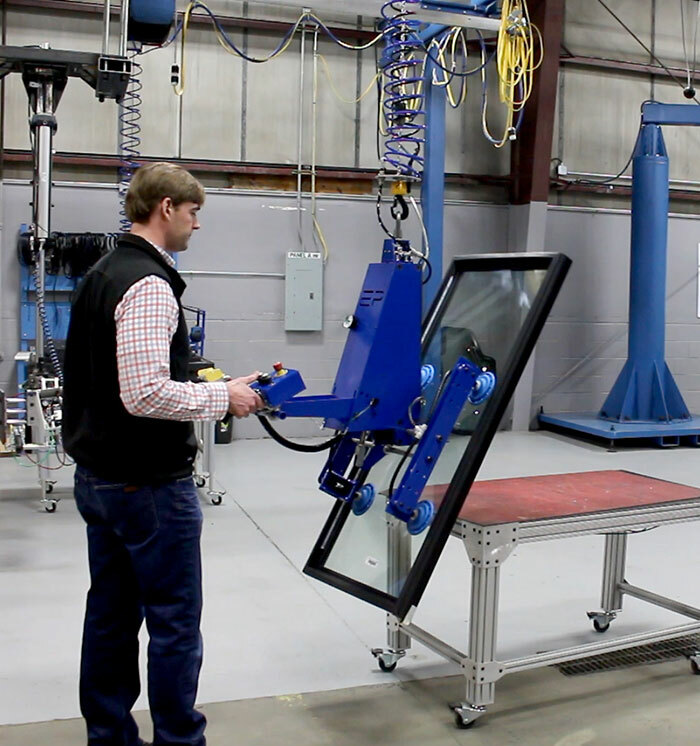 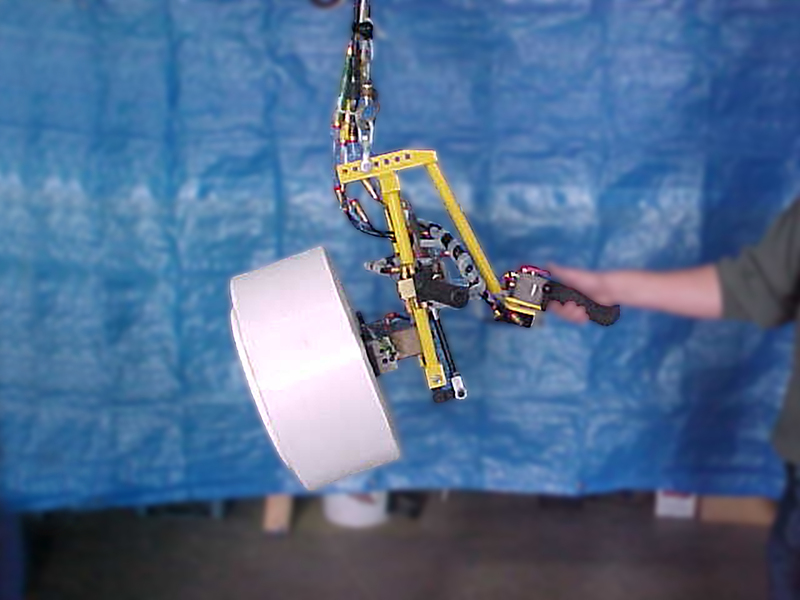 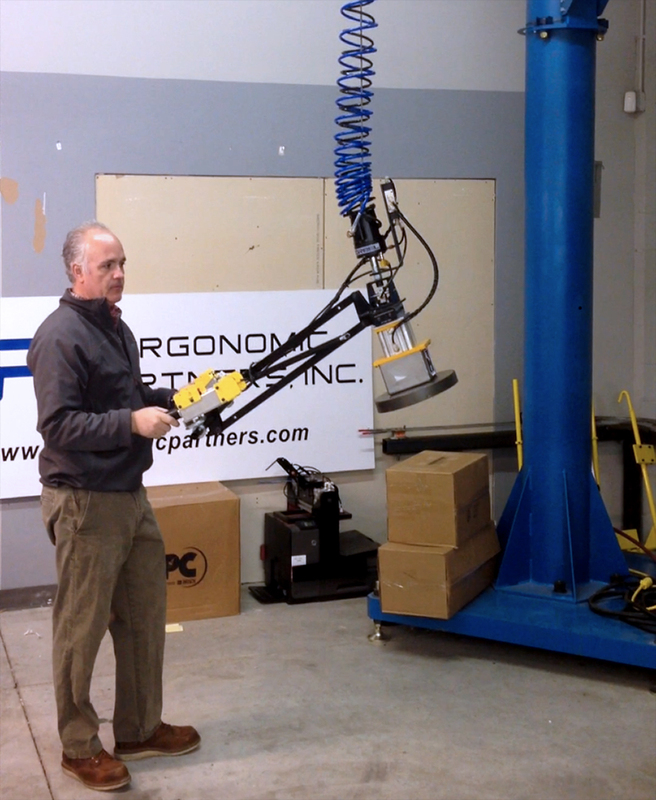 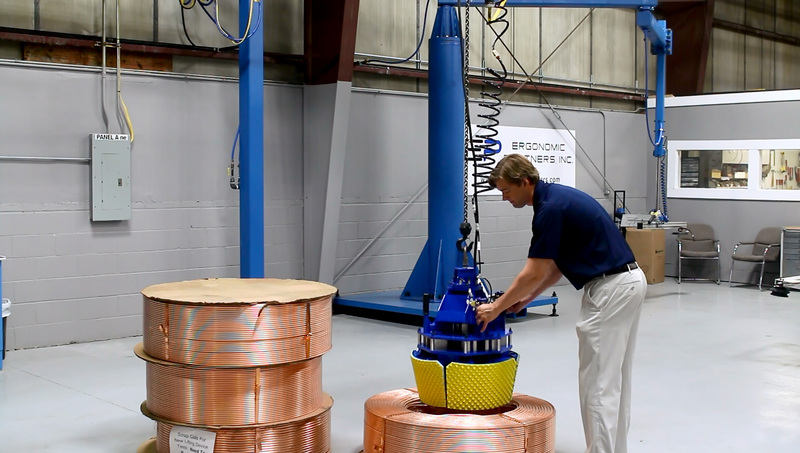 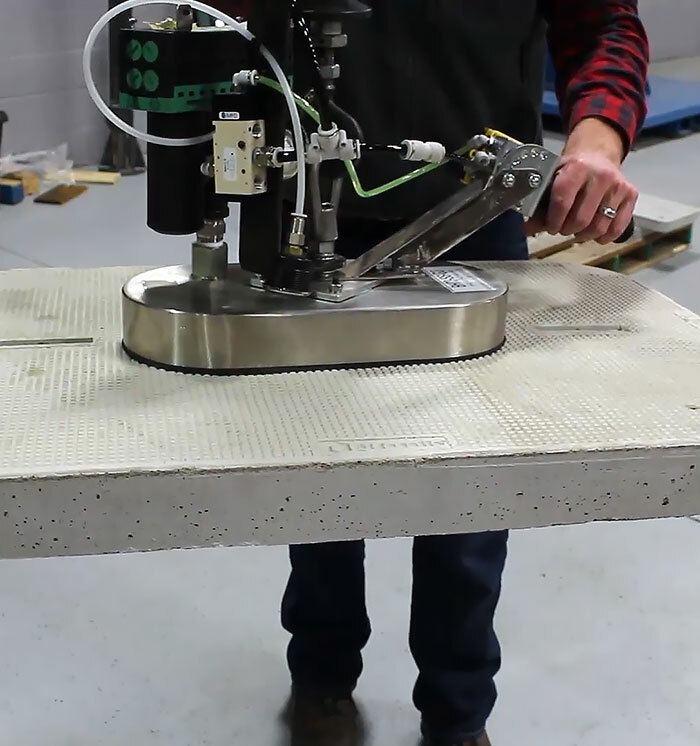 Check out our short videos of Lift Assists and Vacuum Lifters in action here. 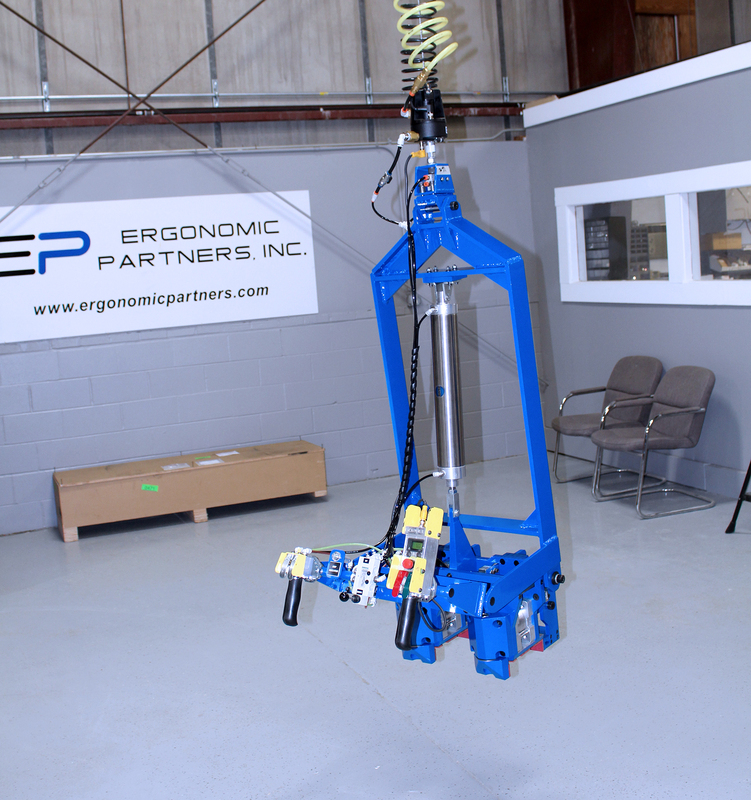 Ergonomic lift assists can include anything from standard hooks, electromagnets and core grips, as well as pneumatic clamps or vacuum. 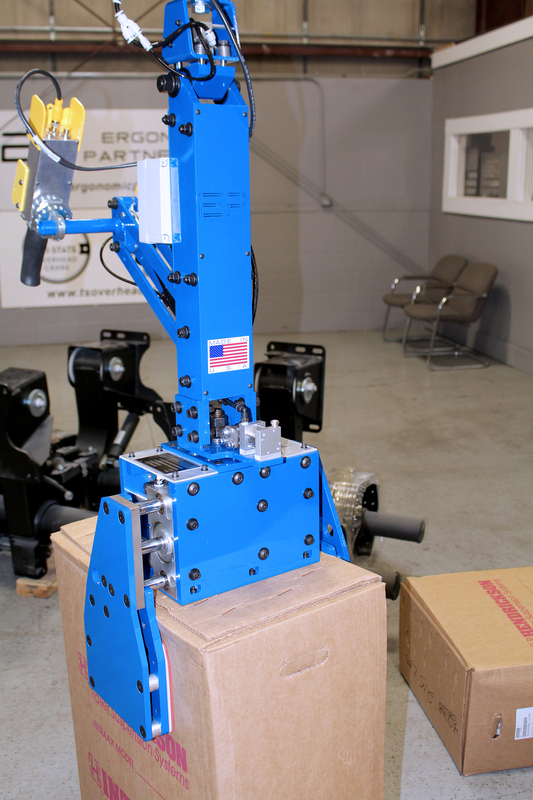 All attachments can be equipped with up-end, down-end, rotate, pitch, and tilt functions. 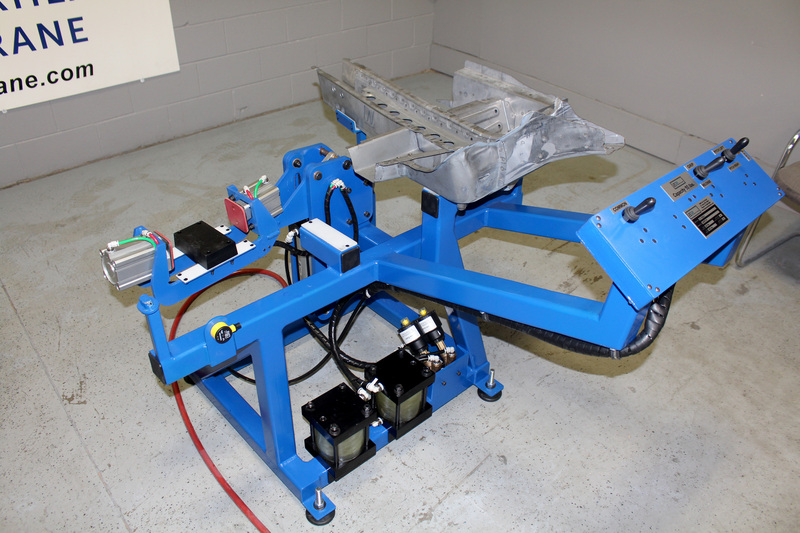 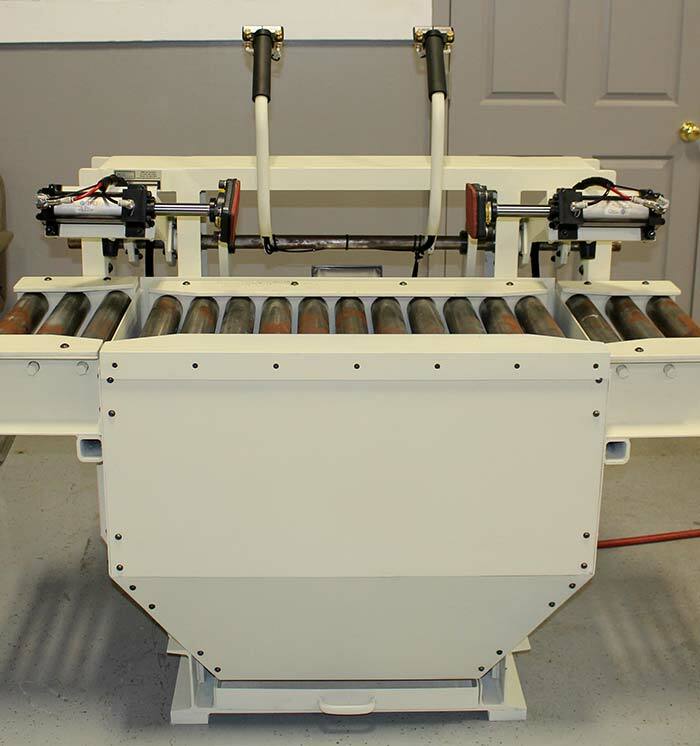 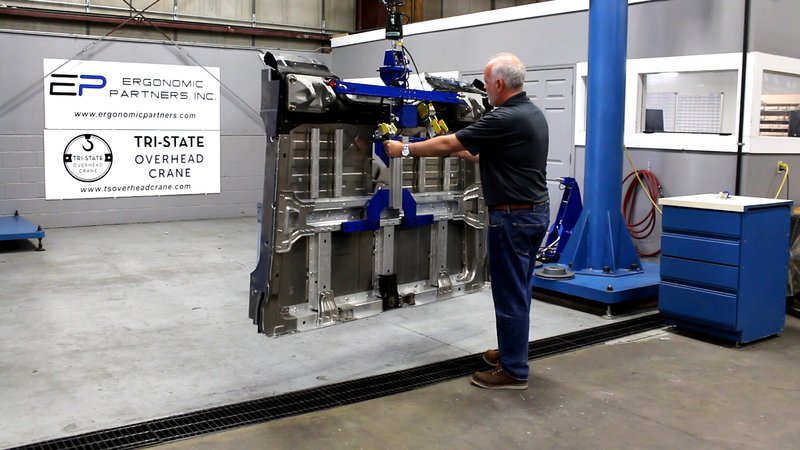 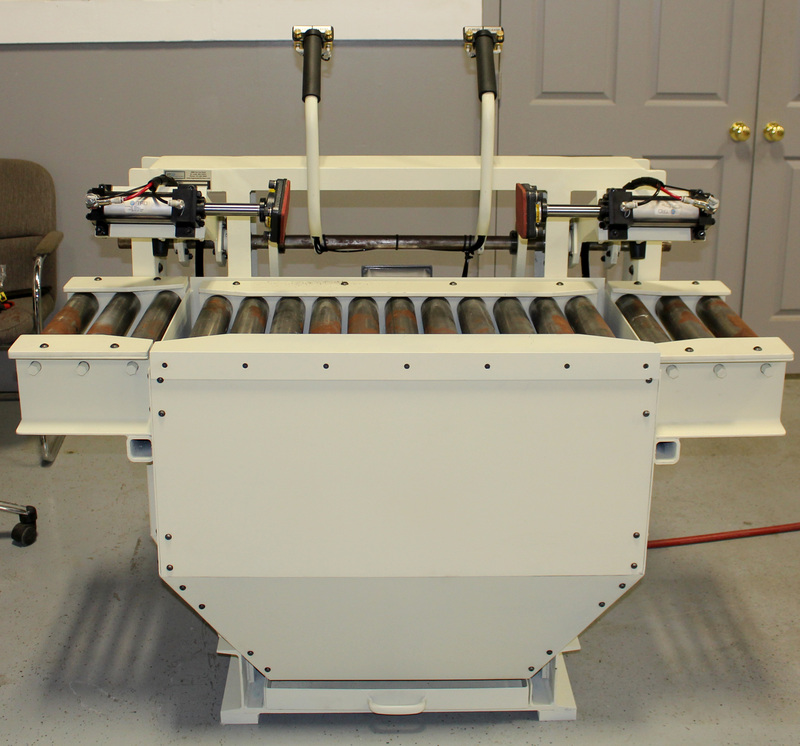 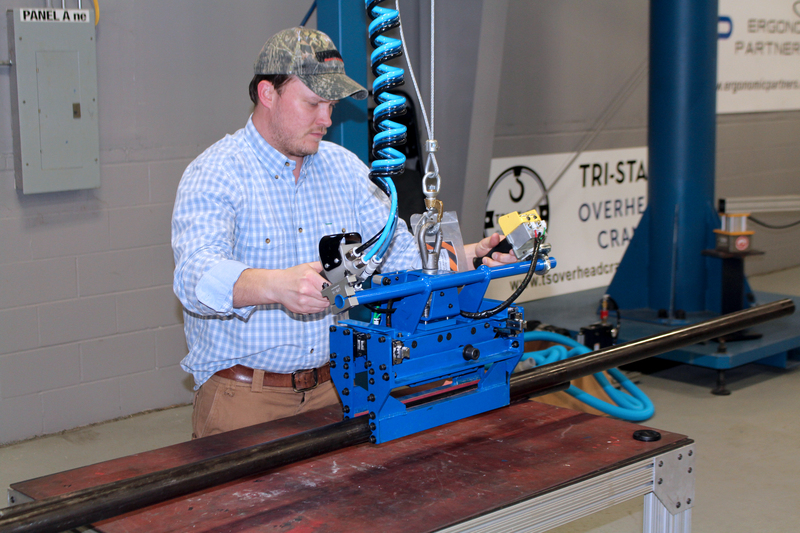 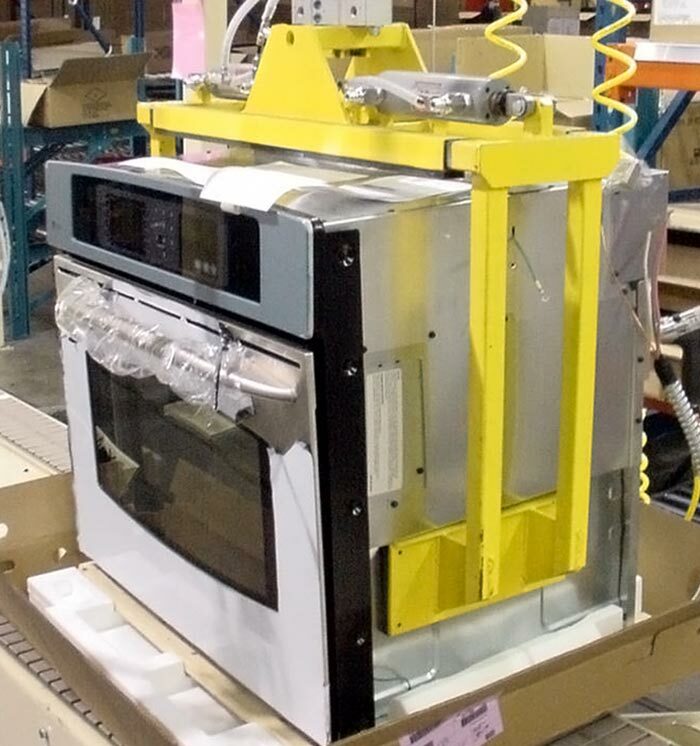 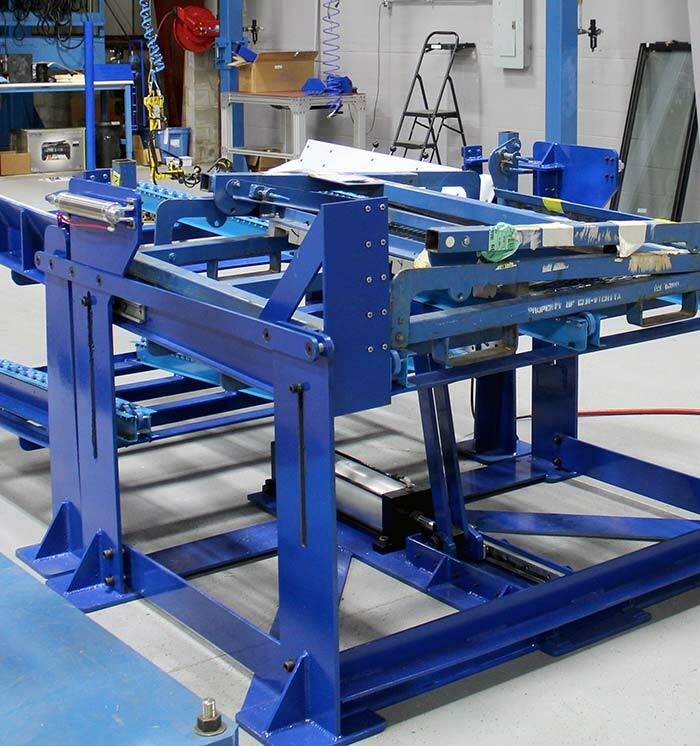 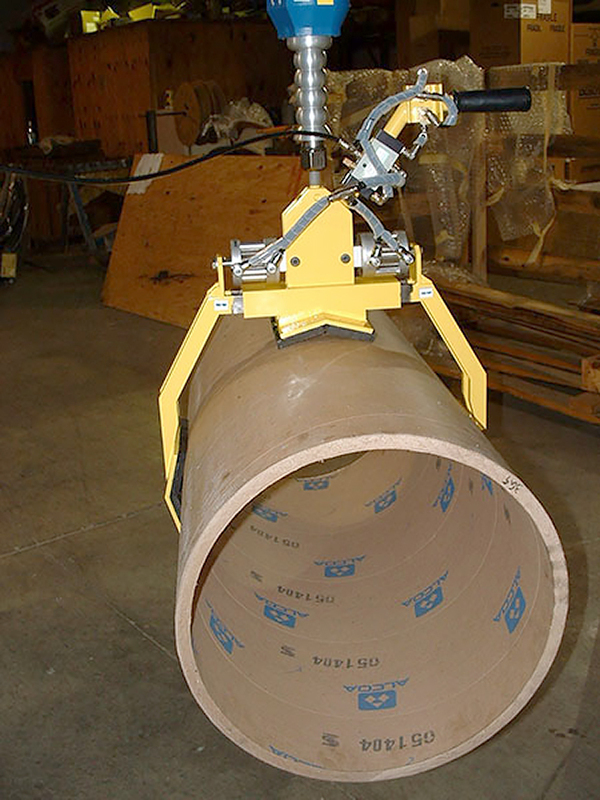 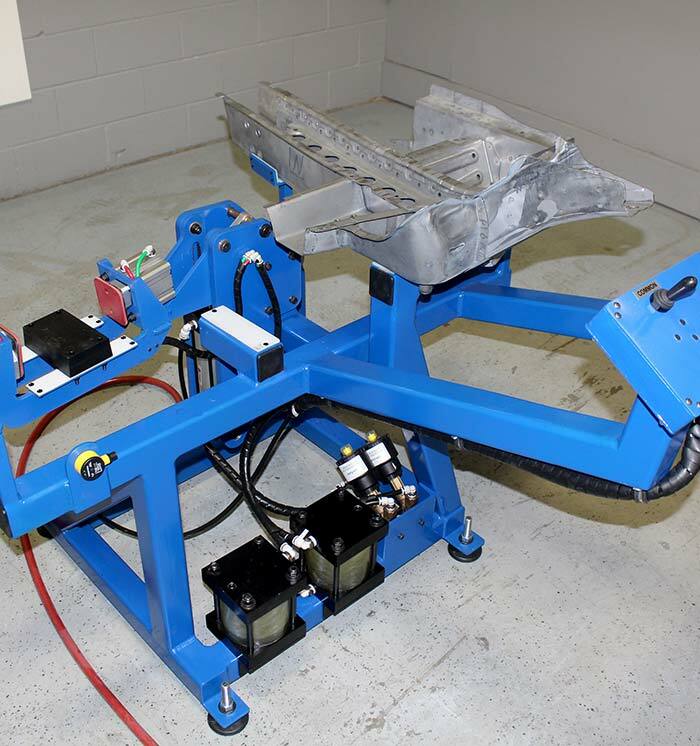 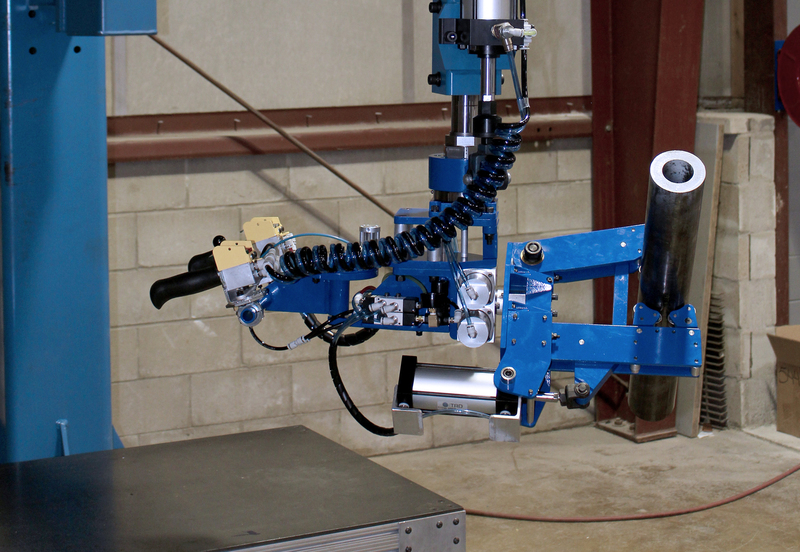 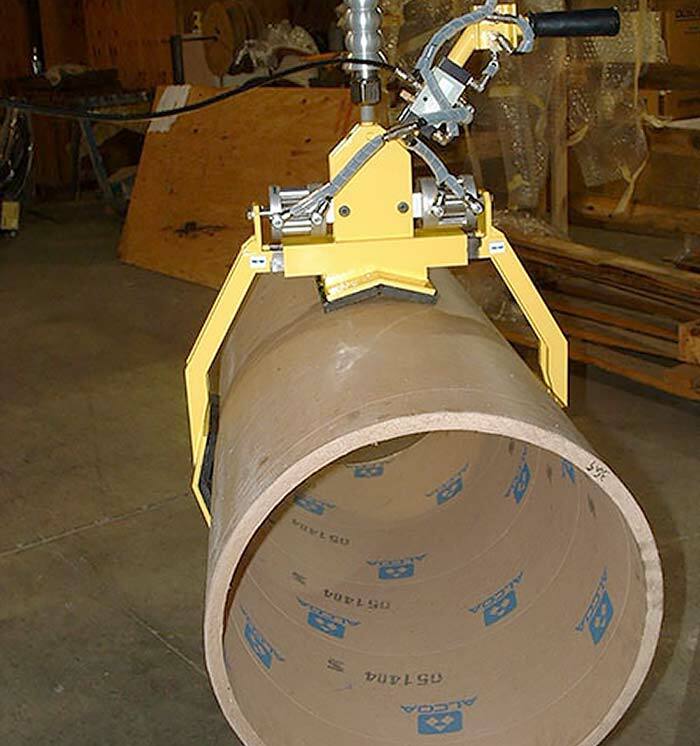 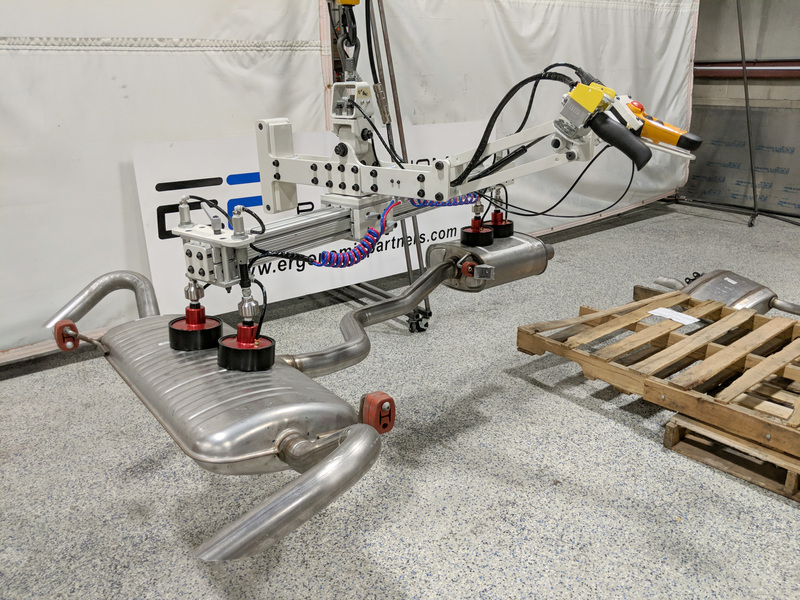 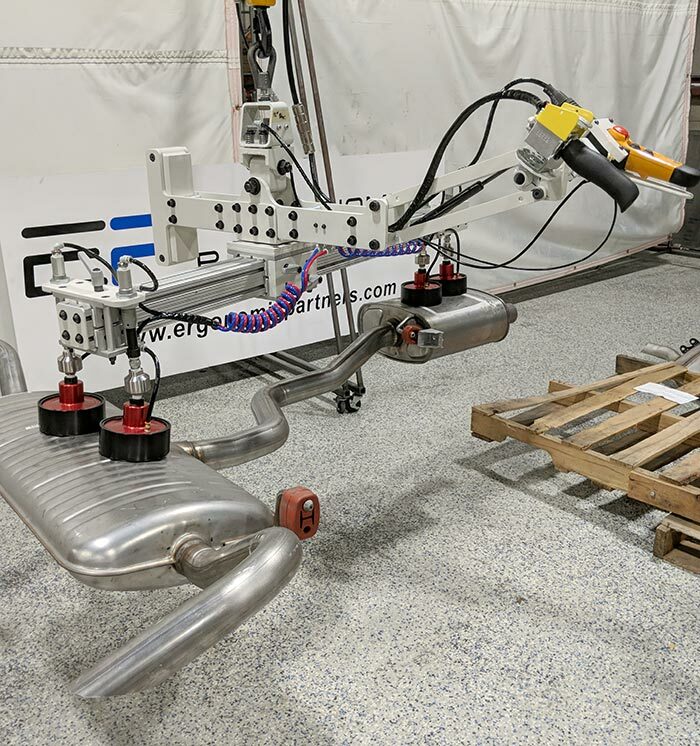 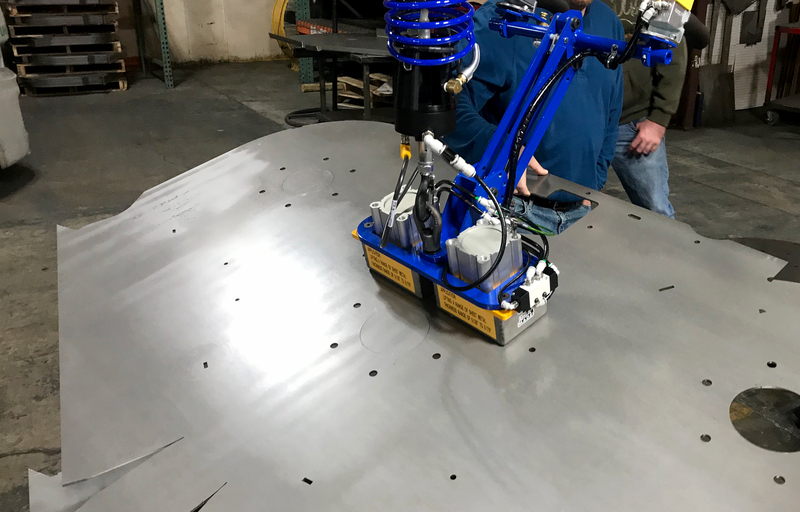 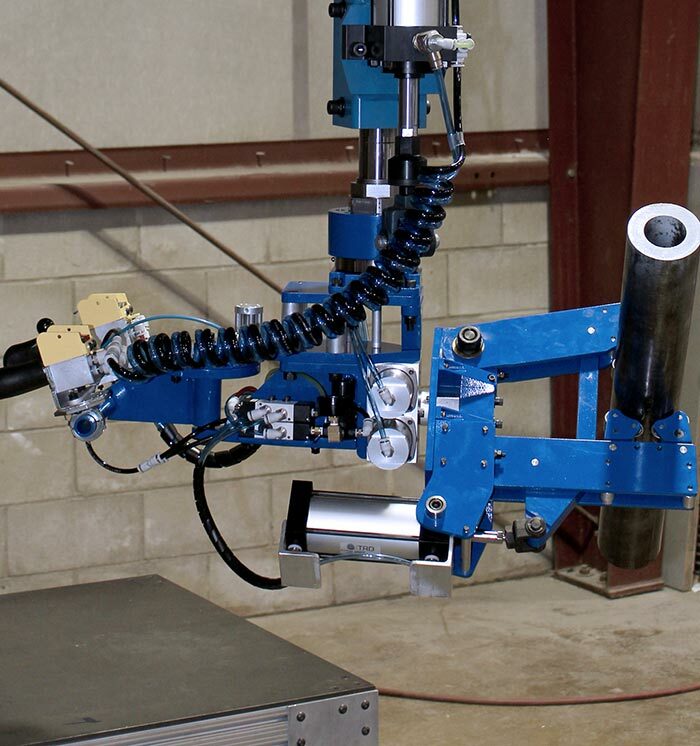 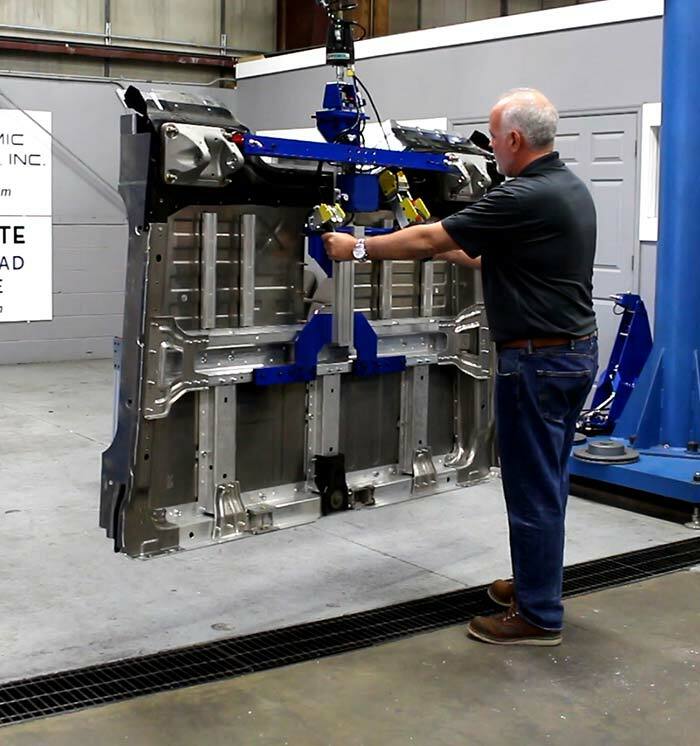 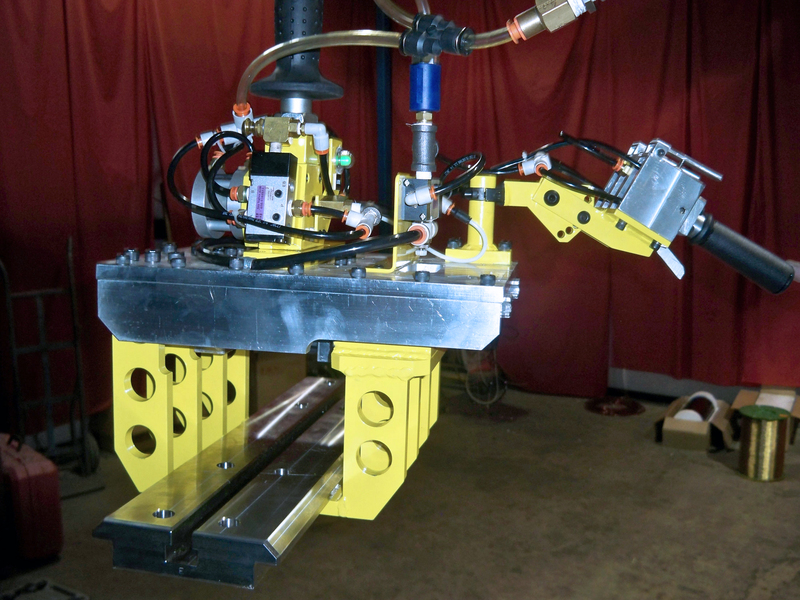 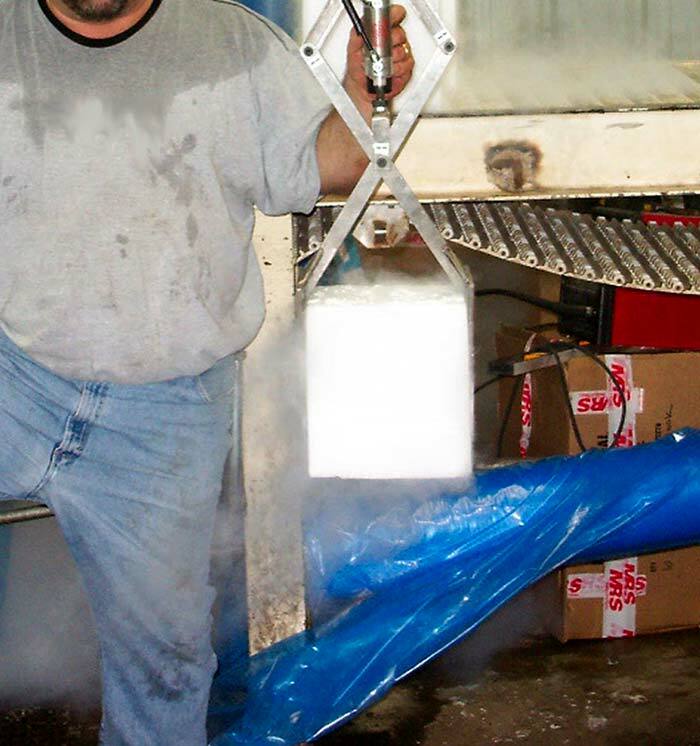 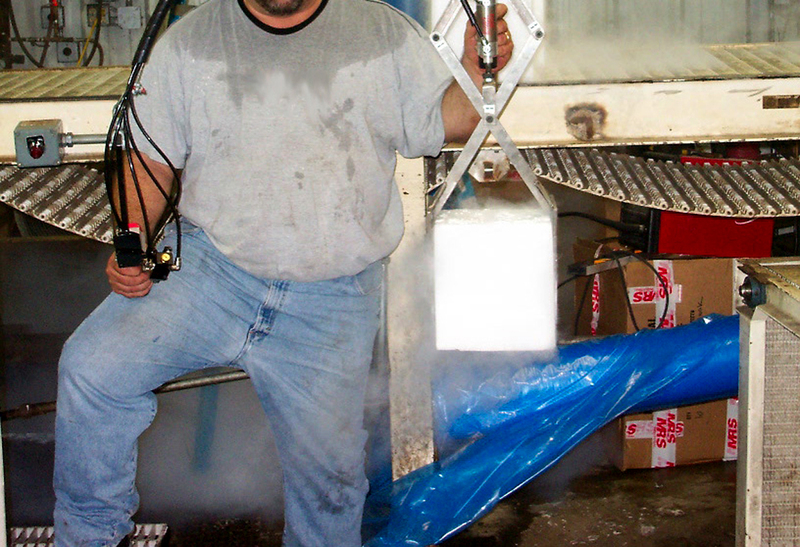 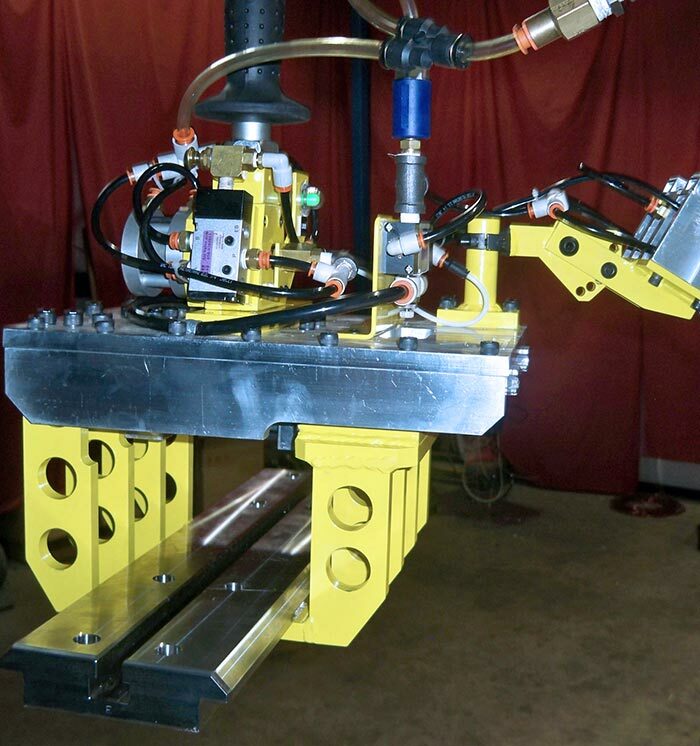 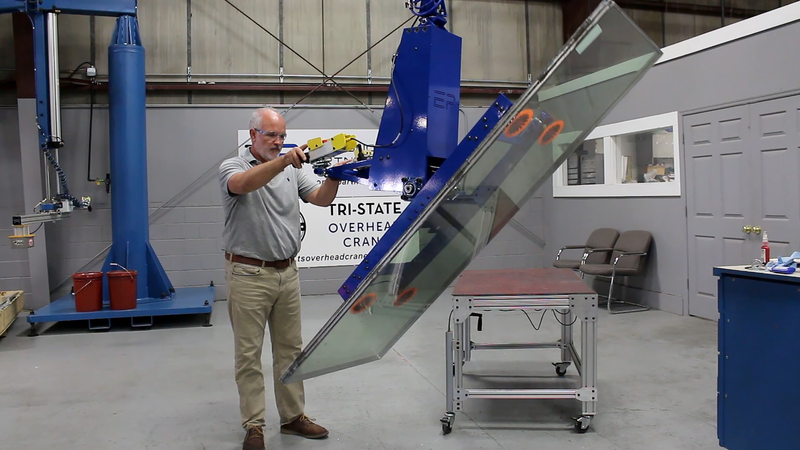 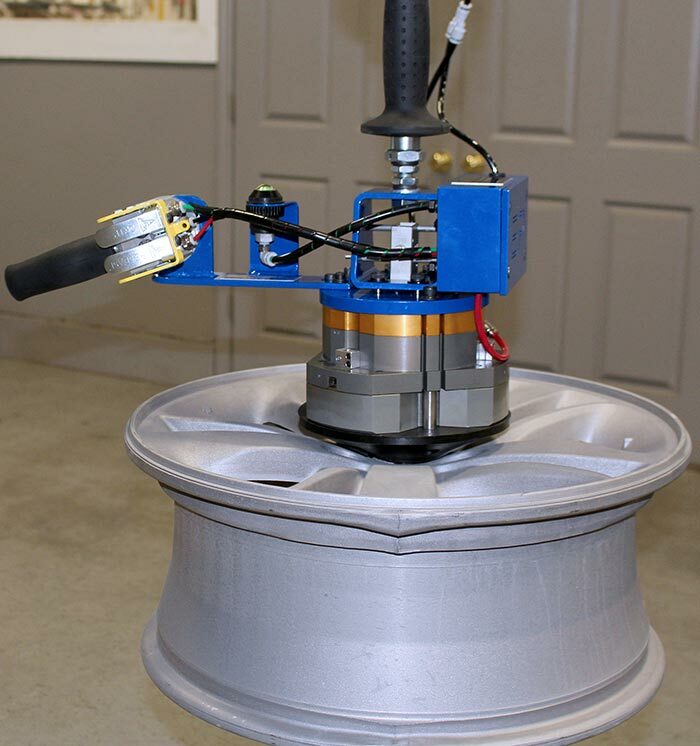 The above custom tooling is ideal to handle payloads for materials including: sheet metal, panels, plywood, planks, boxes, stone slabs, windows, doors, rolls, castings, glass, parts and more. 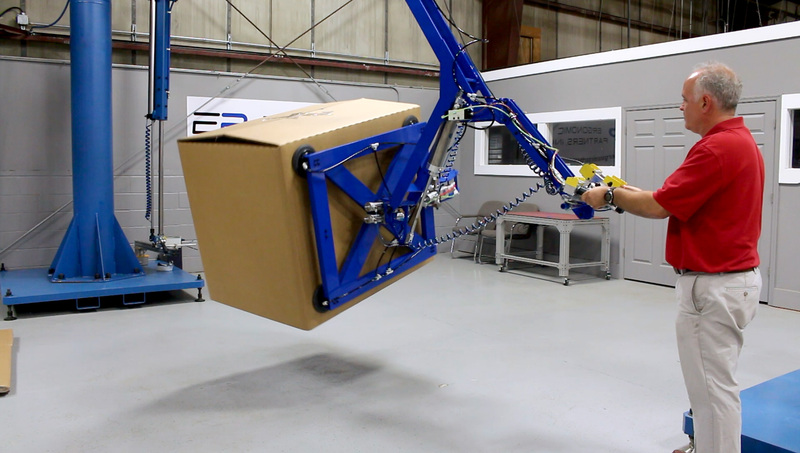 Special lifting applications come in all shapes and sizes. 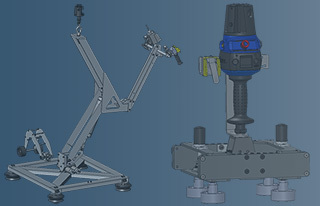 Most of the above tools are designed for various working elevations, process production lines or work areas that have very close quarters. 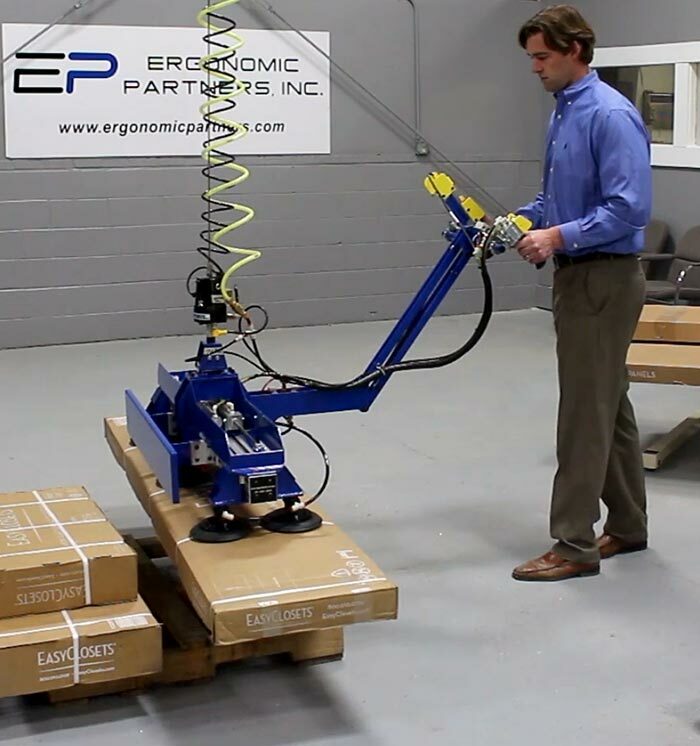 This ergonomic improvement minimizes awkward working postures, heavy lifting, forceful exertions and manual carrying of material. 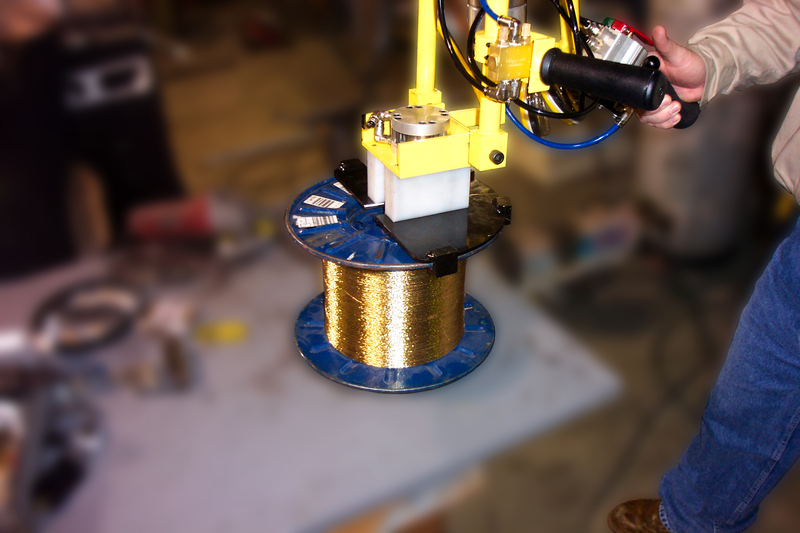 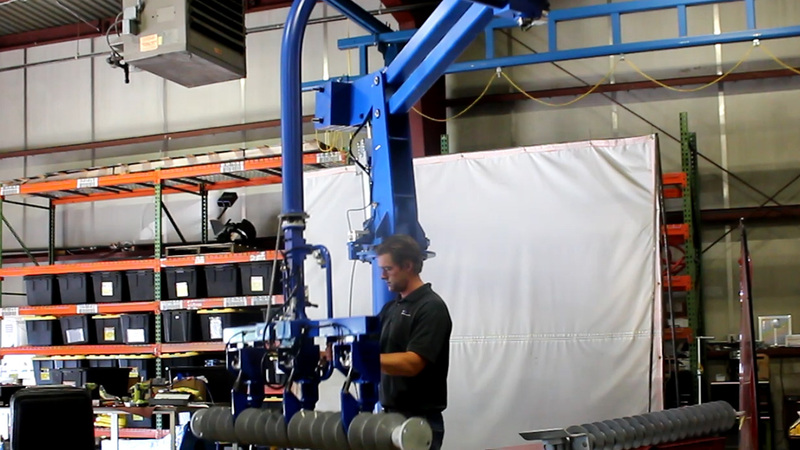 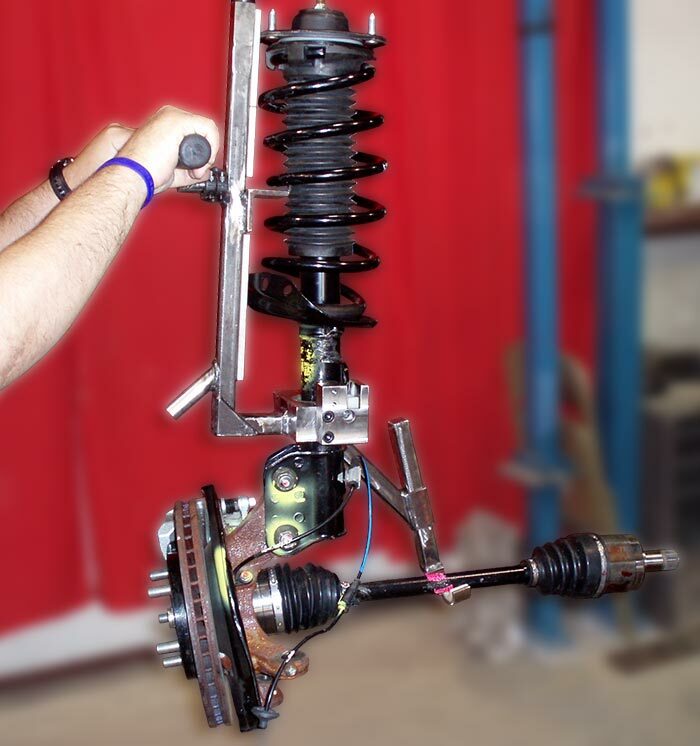 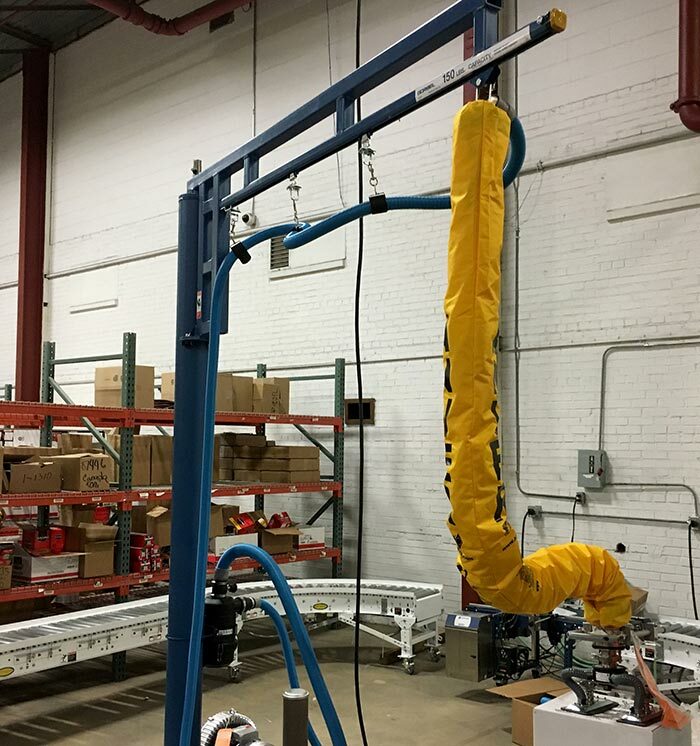 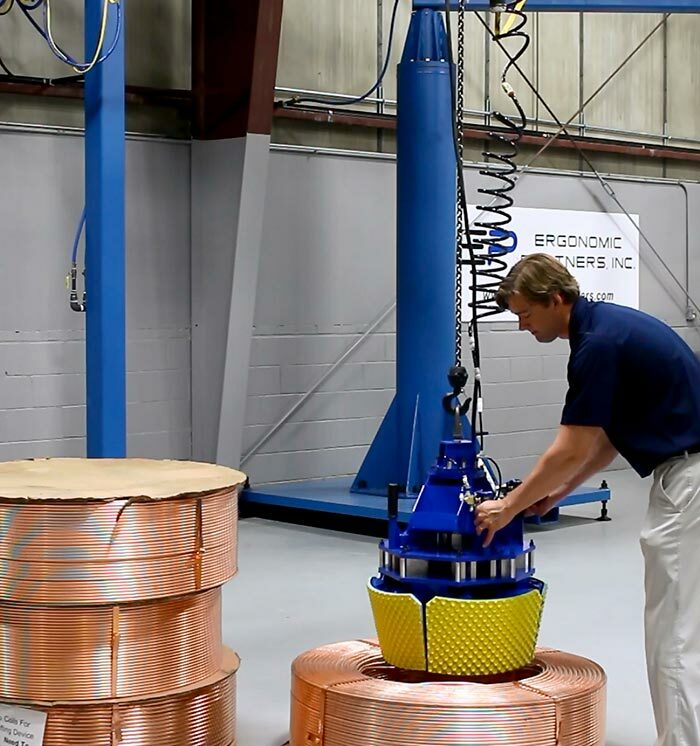 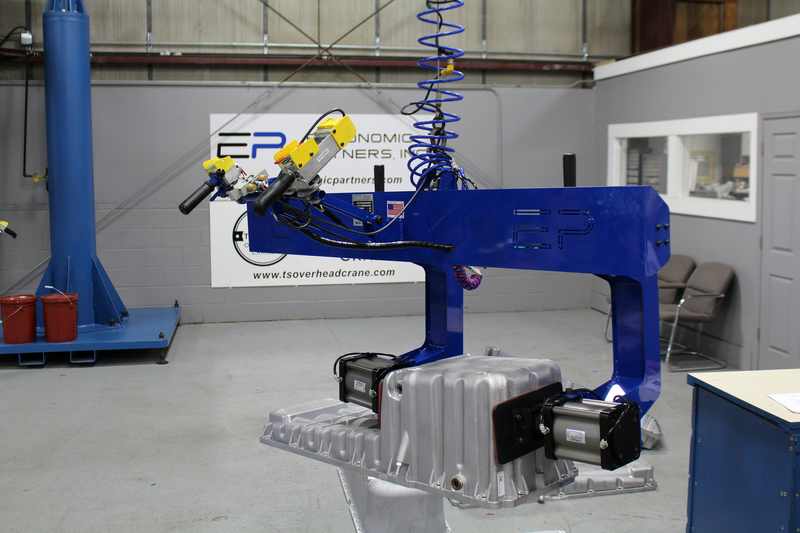 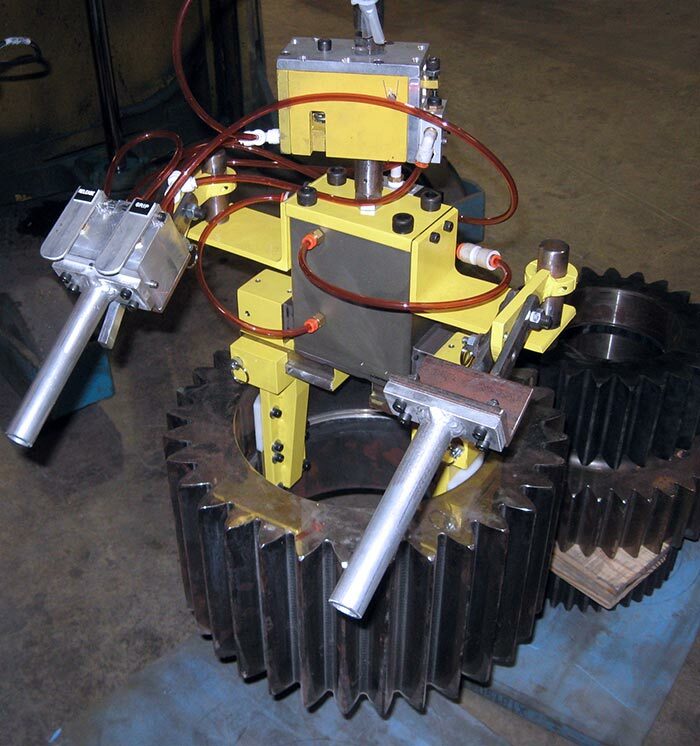 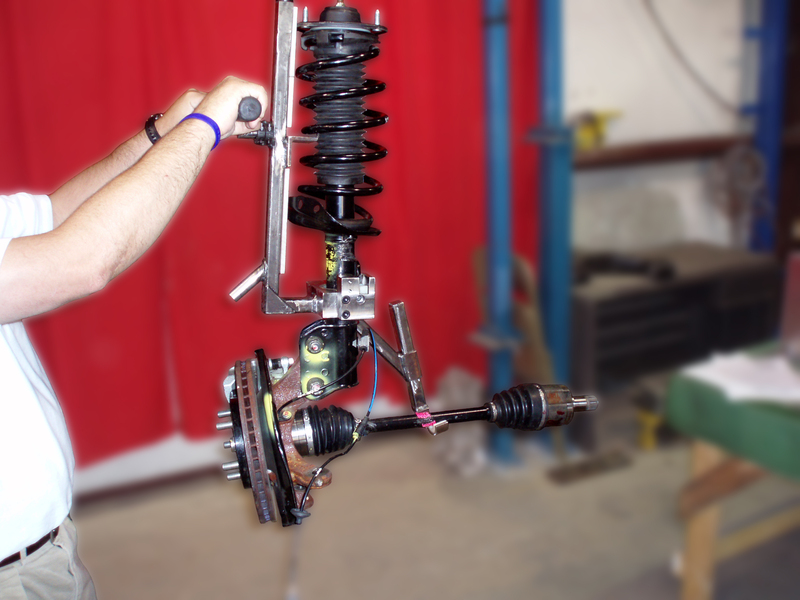 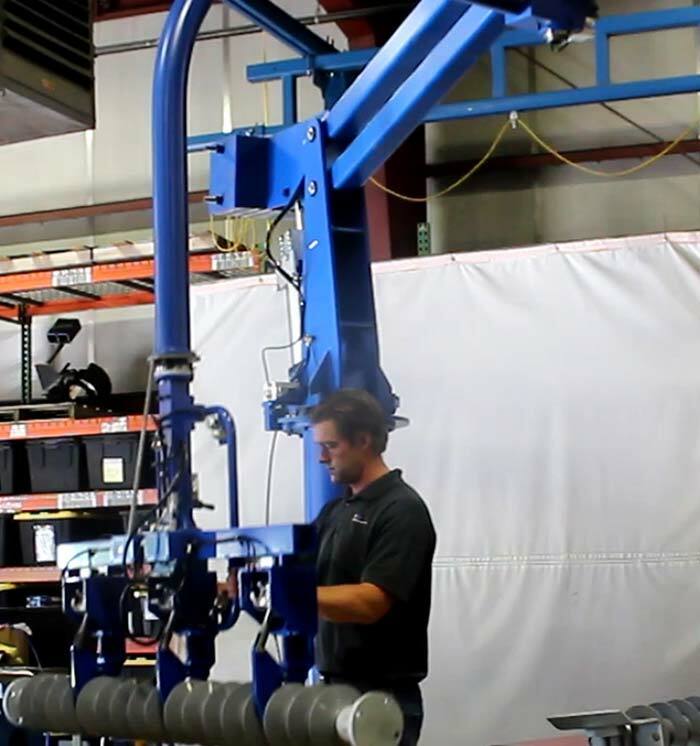 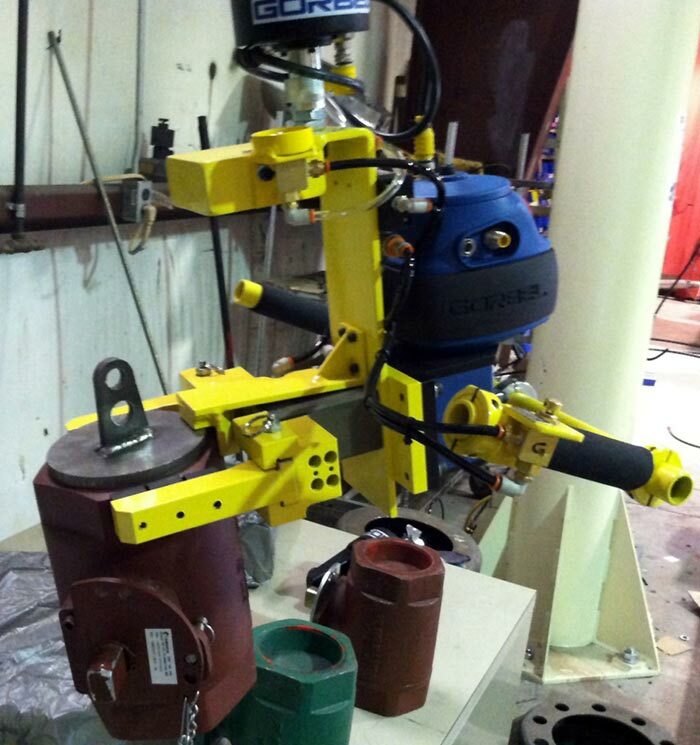 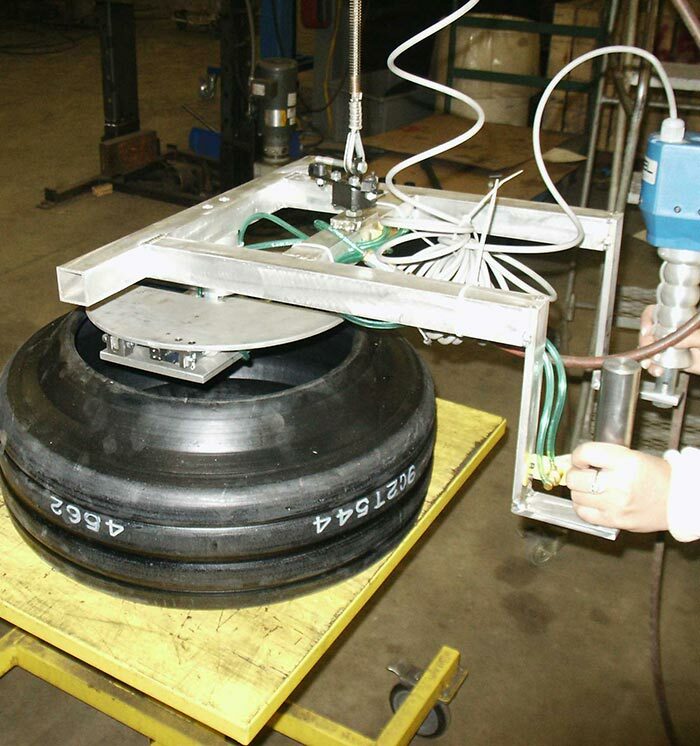 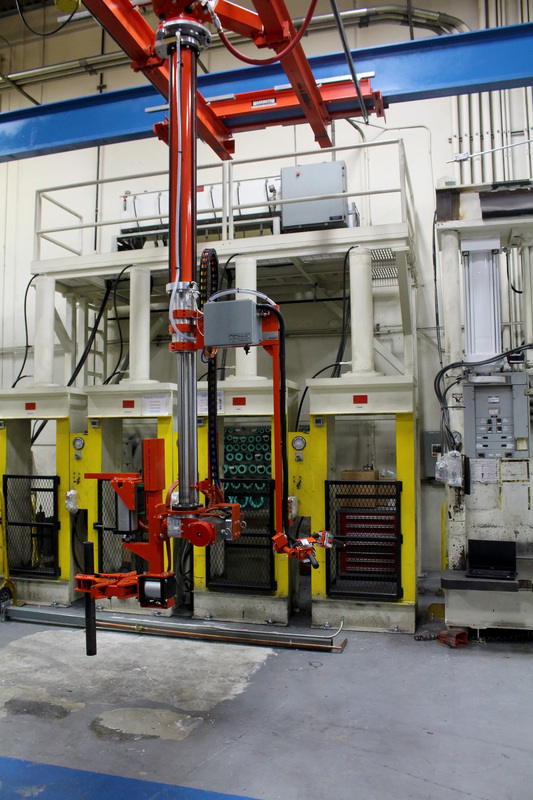 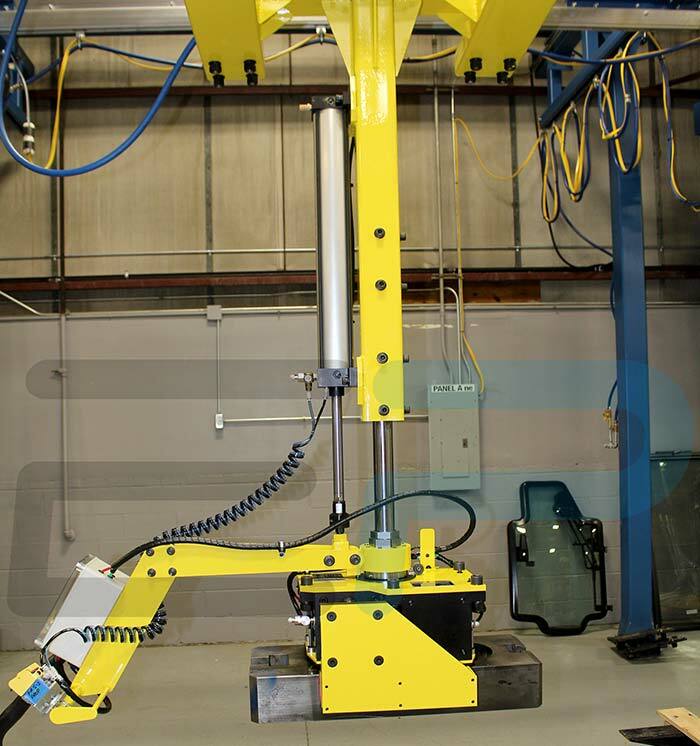 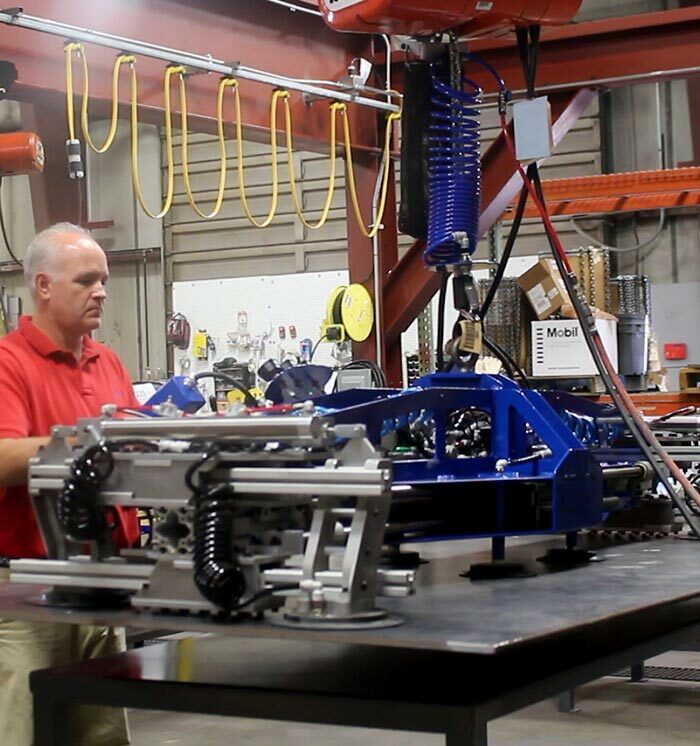 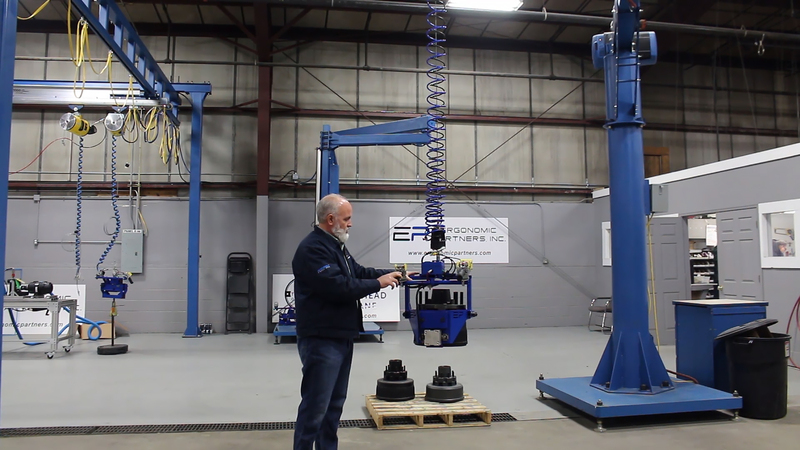 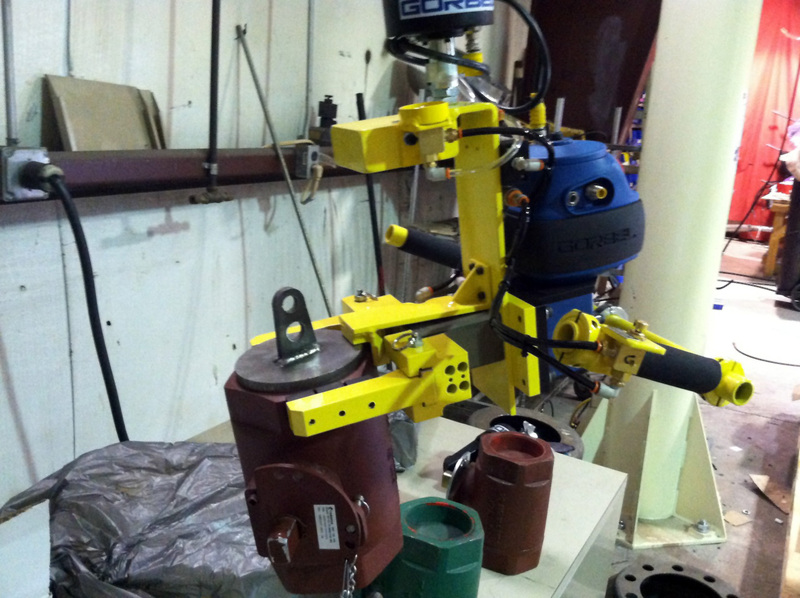 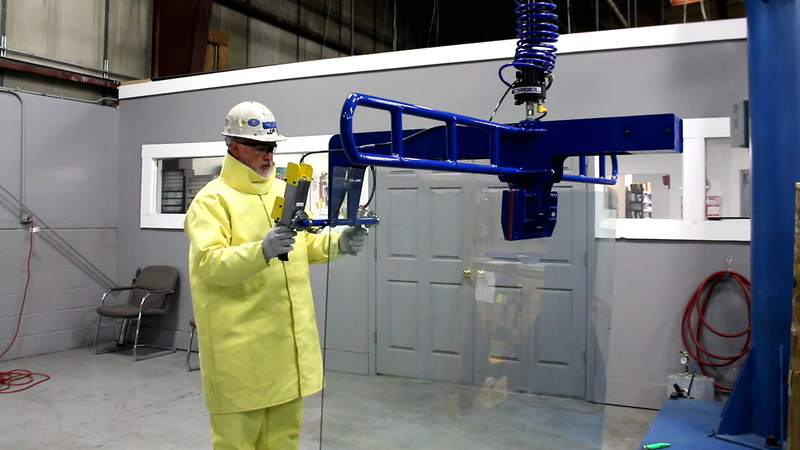 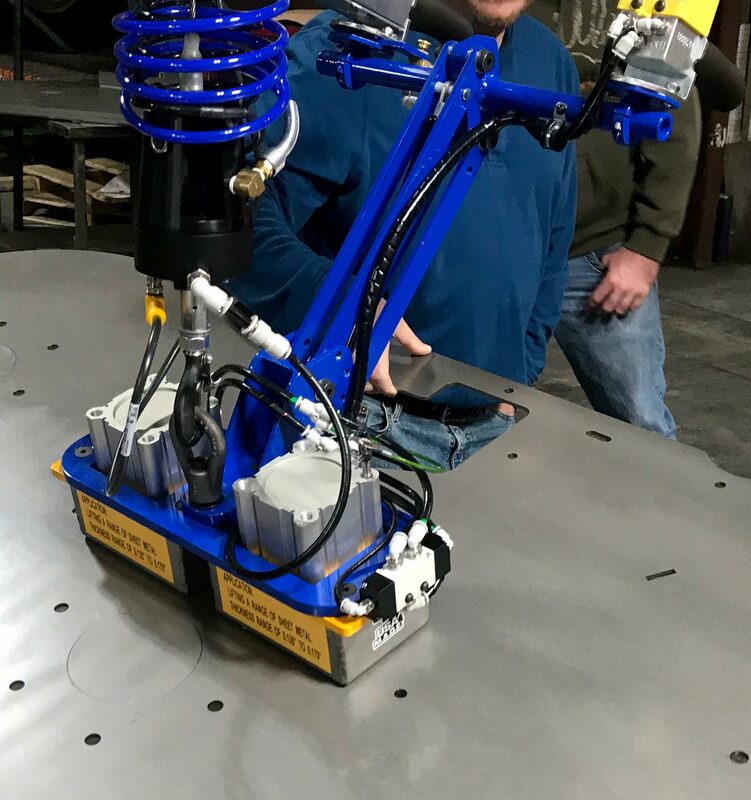 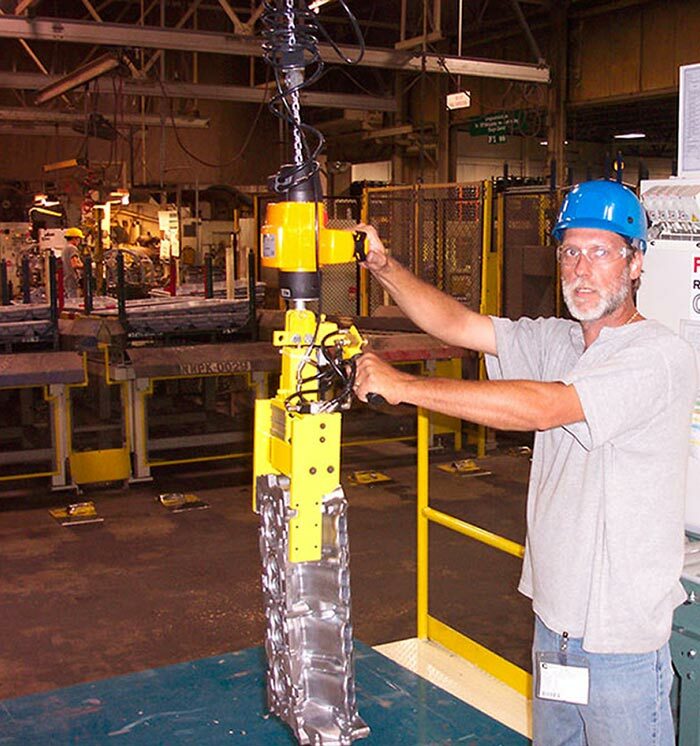 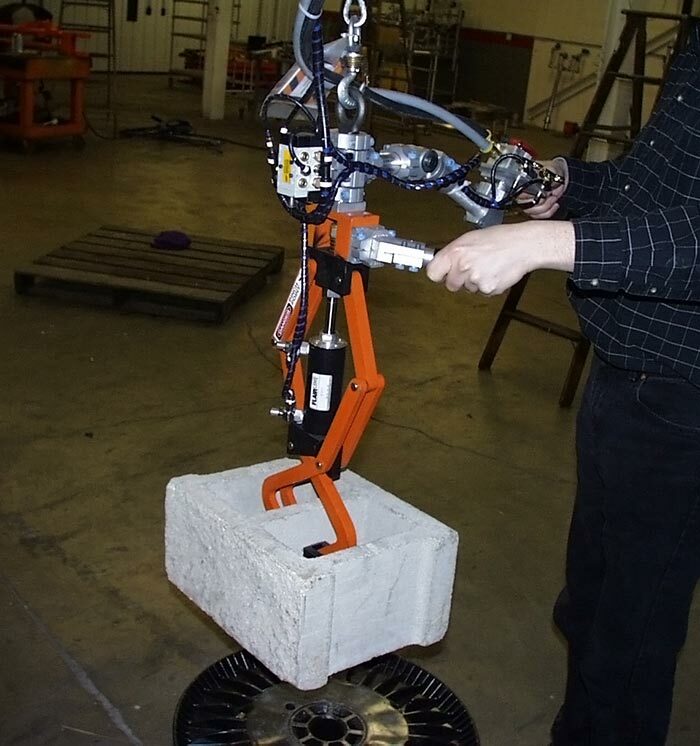 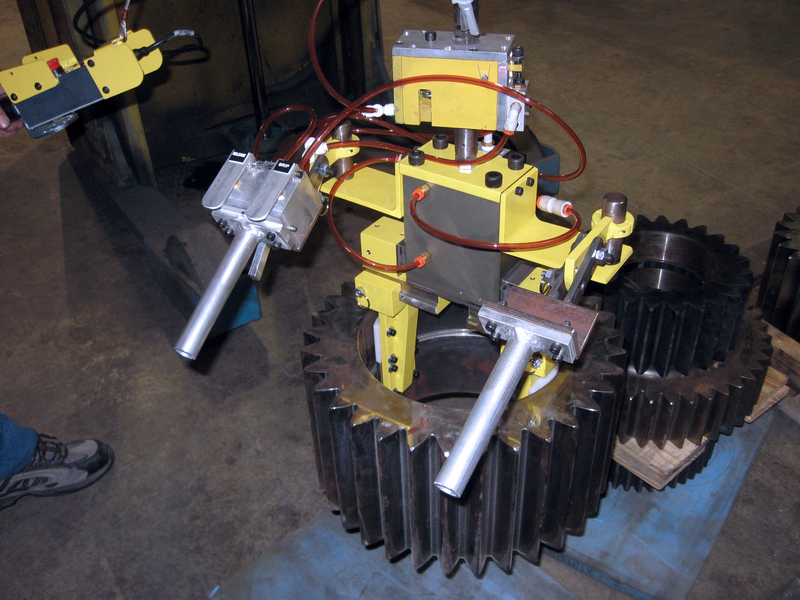 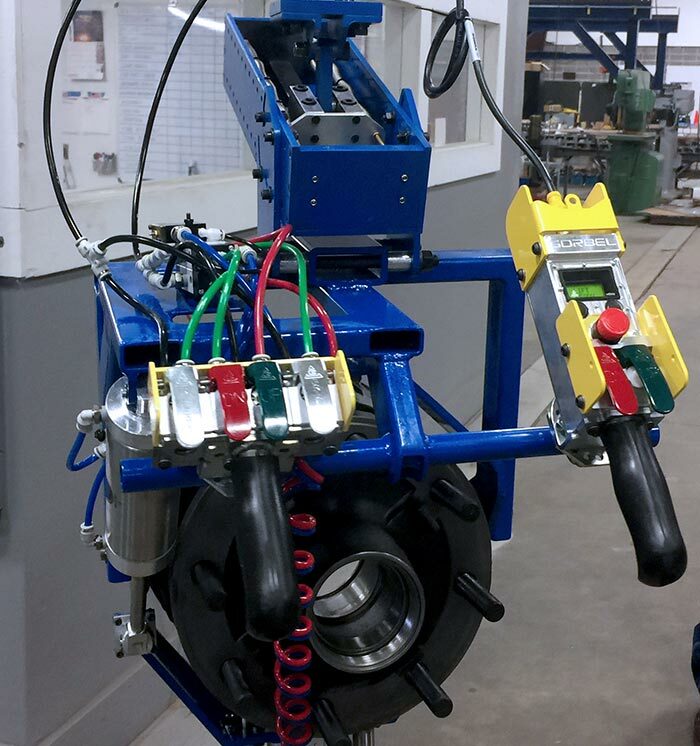 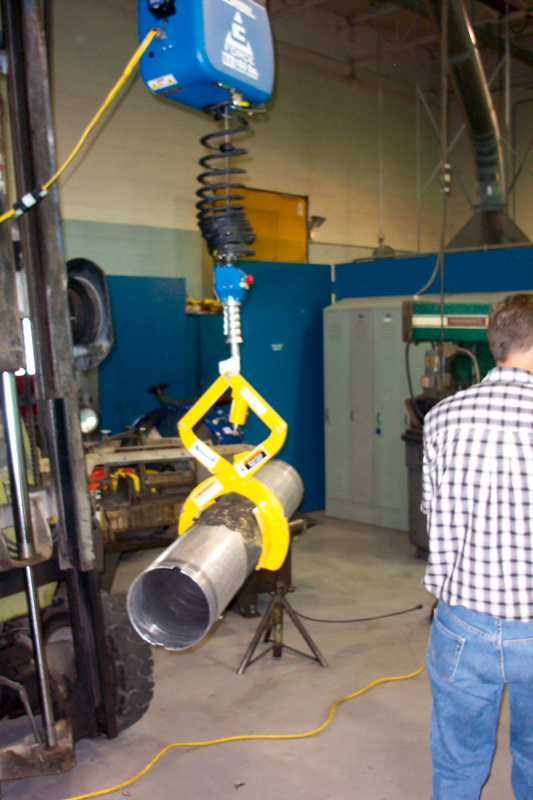 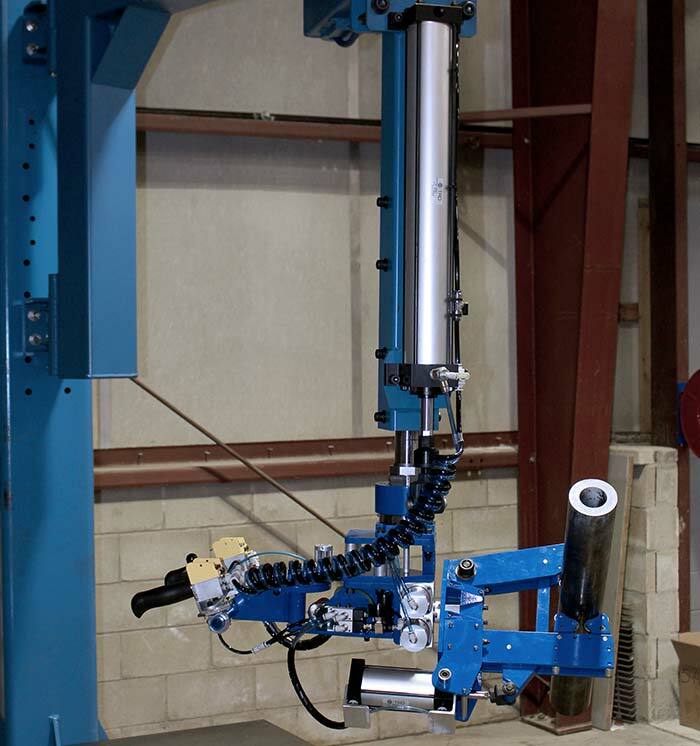 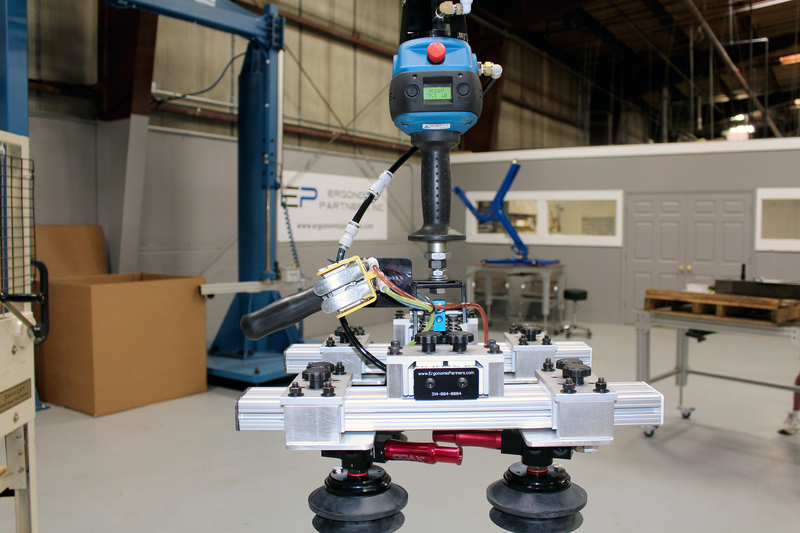 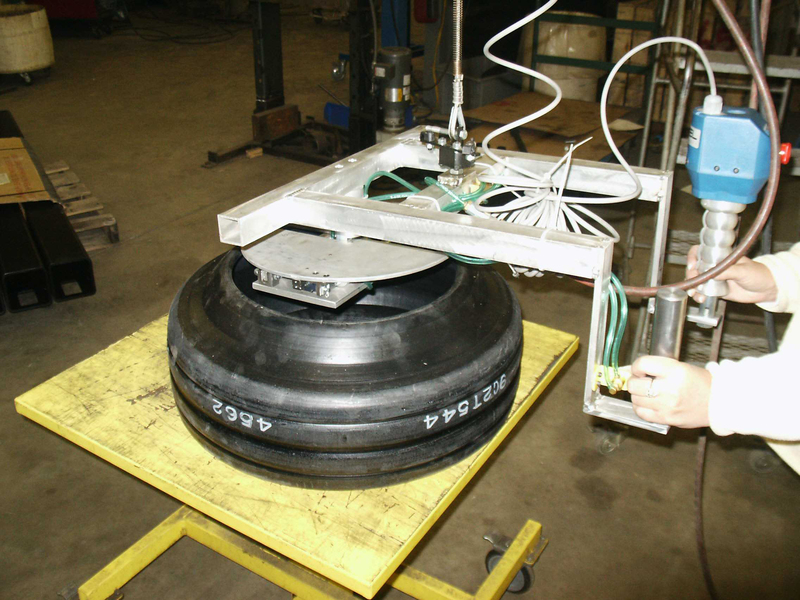 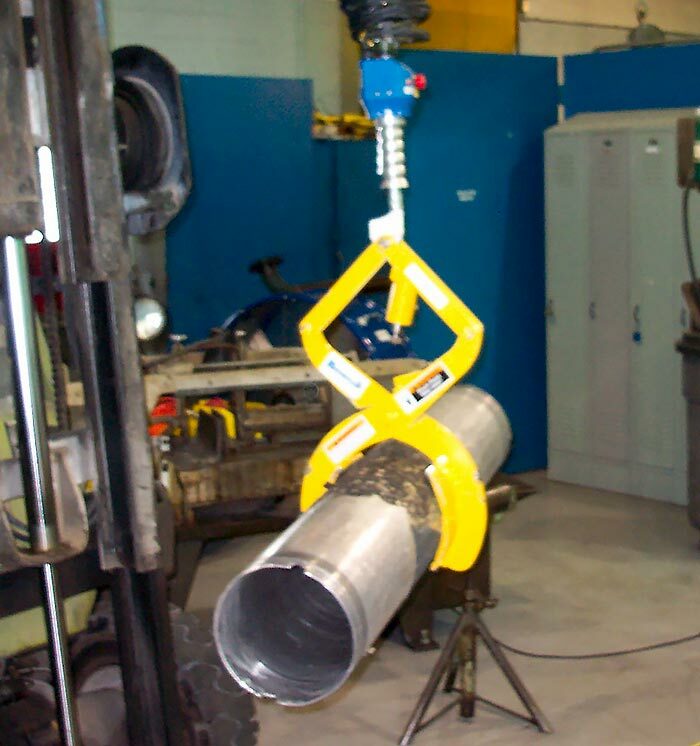 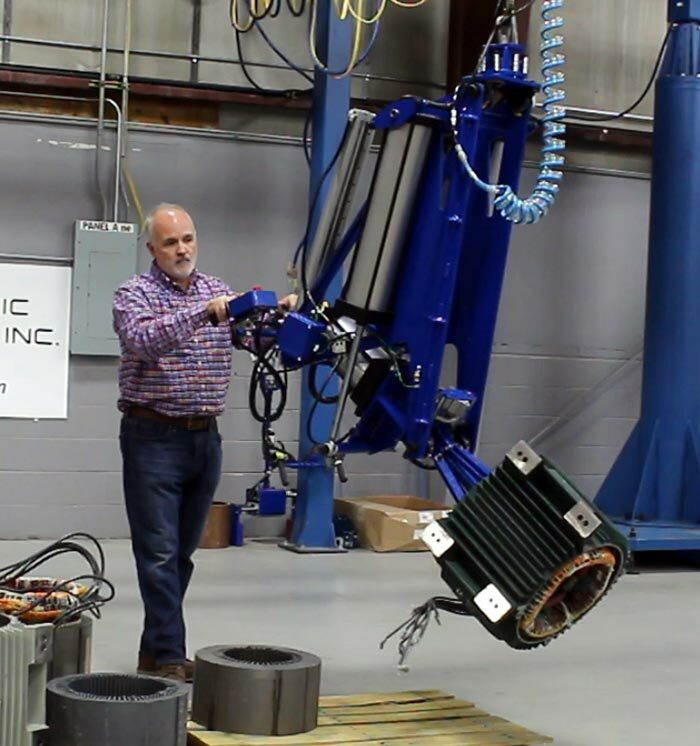 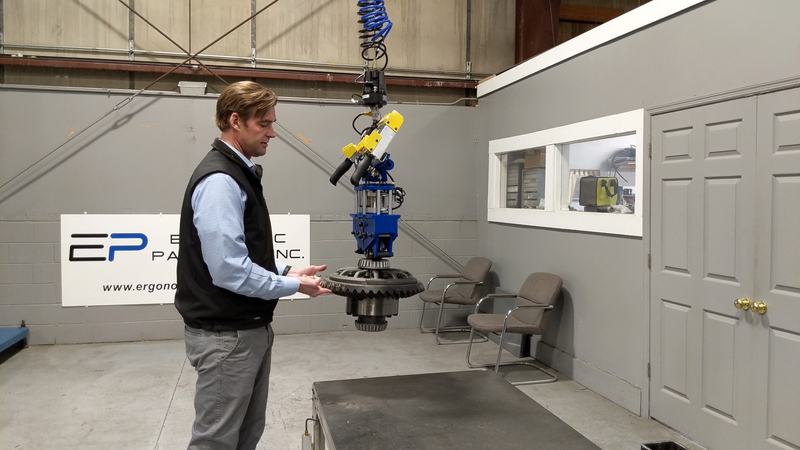 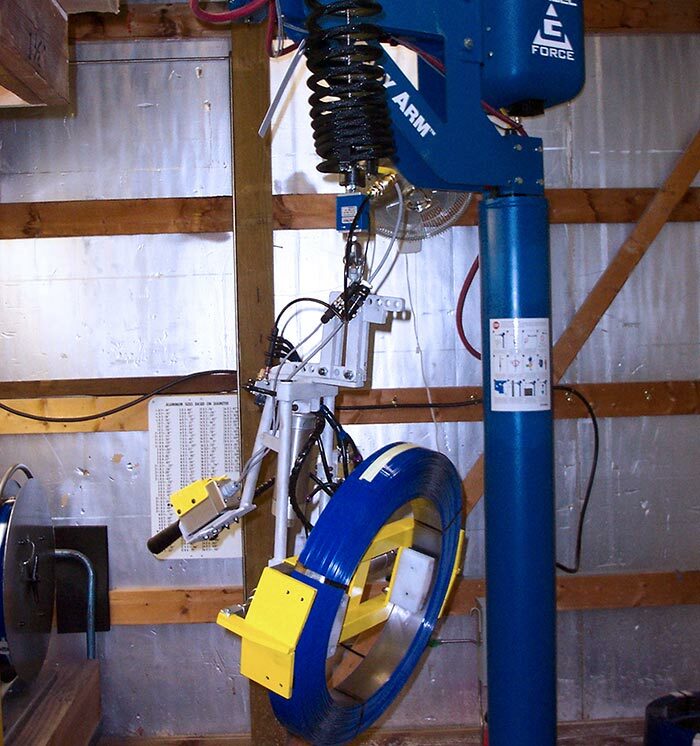 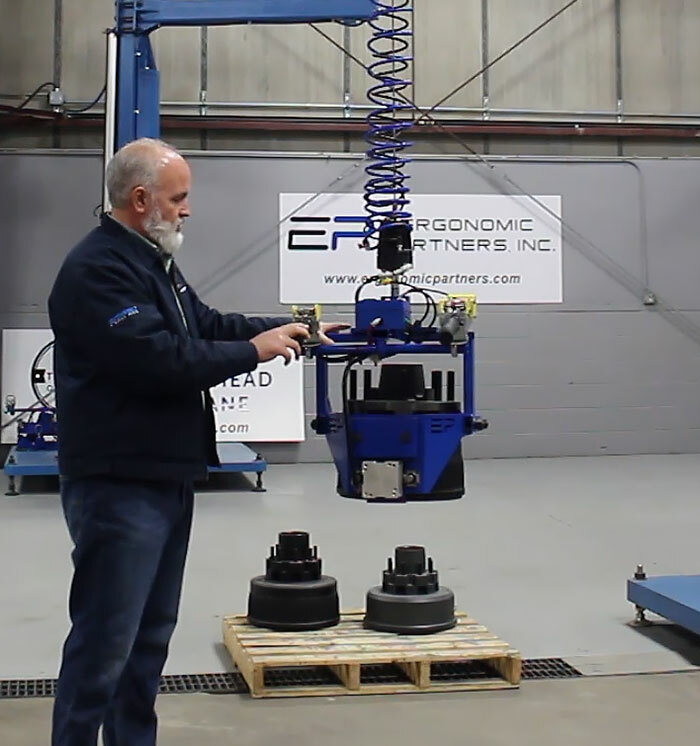 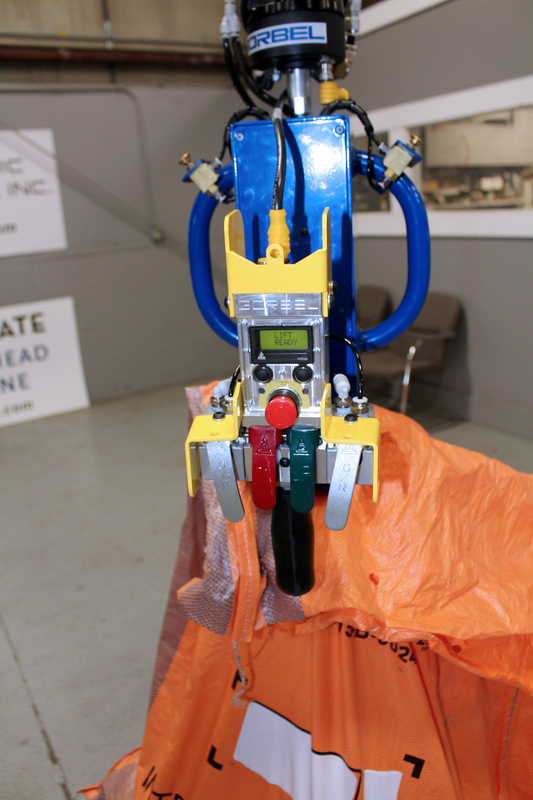 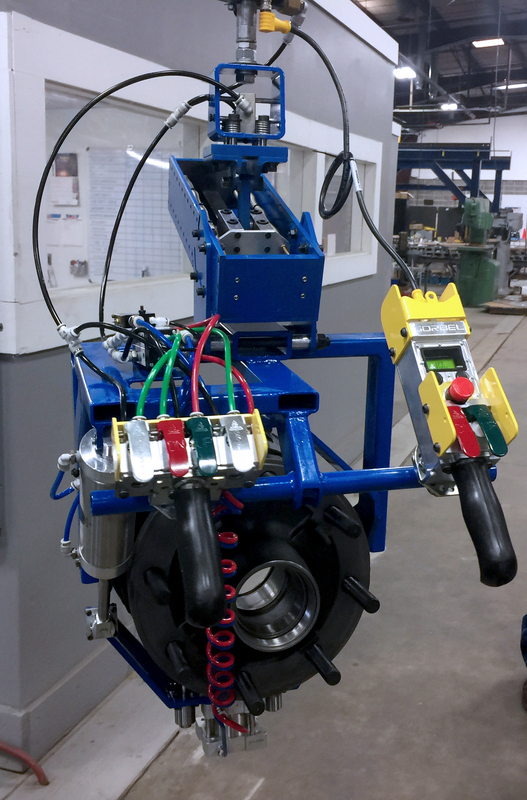 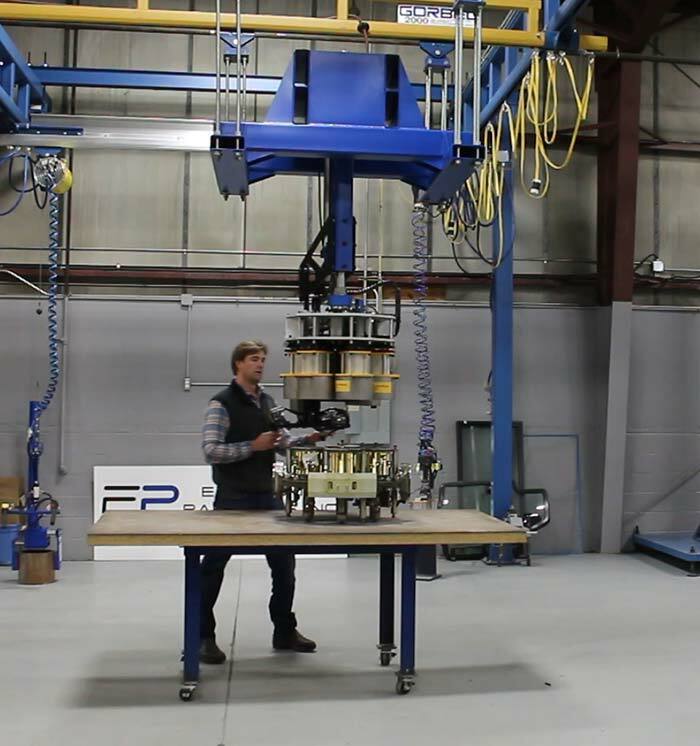 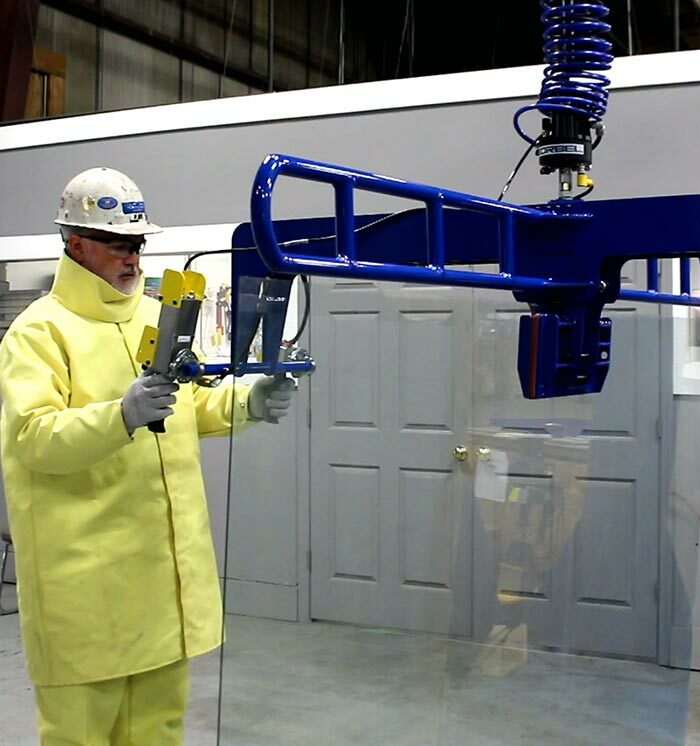 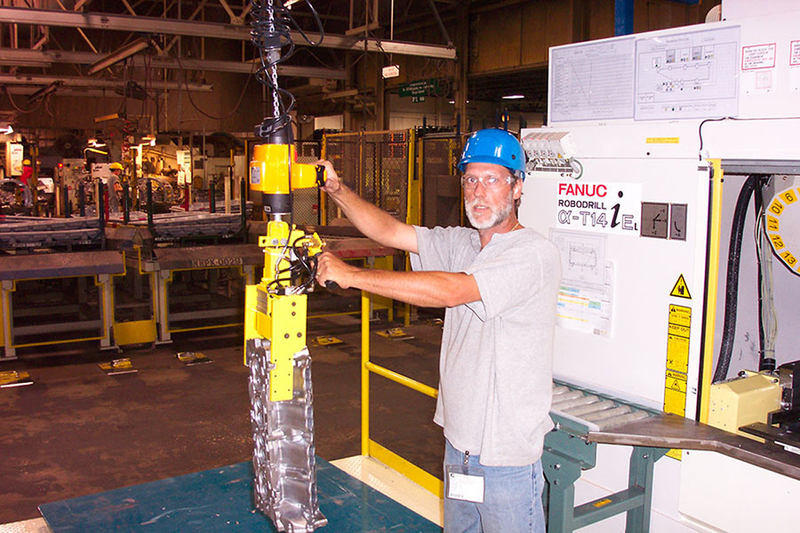 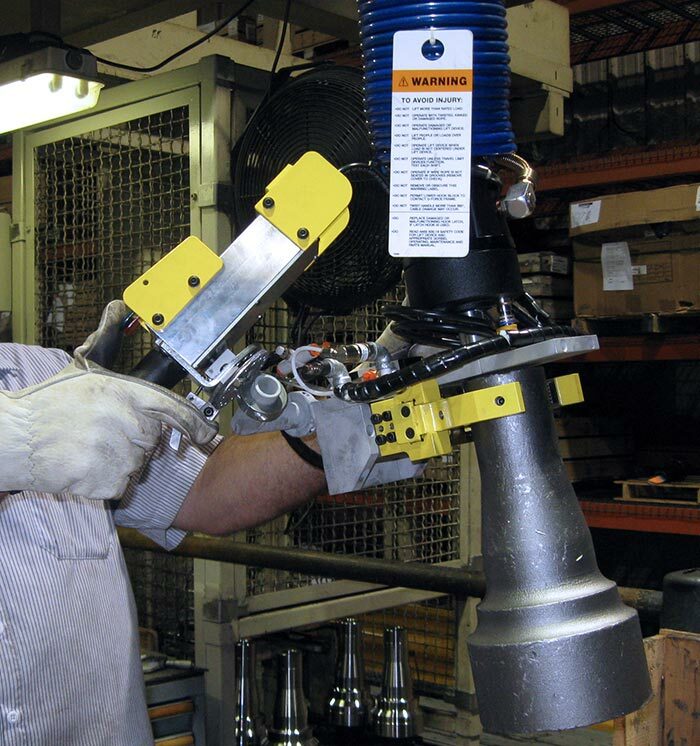 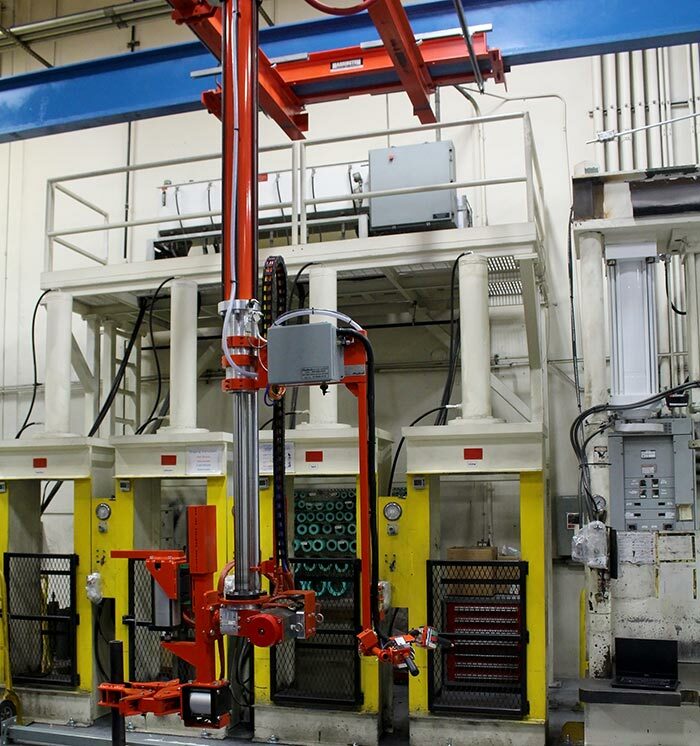 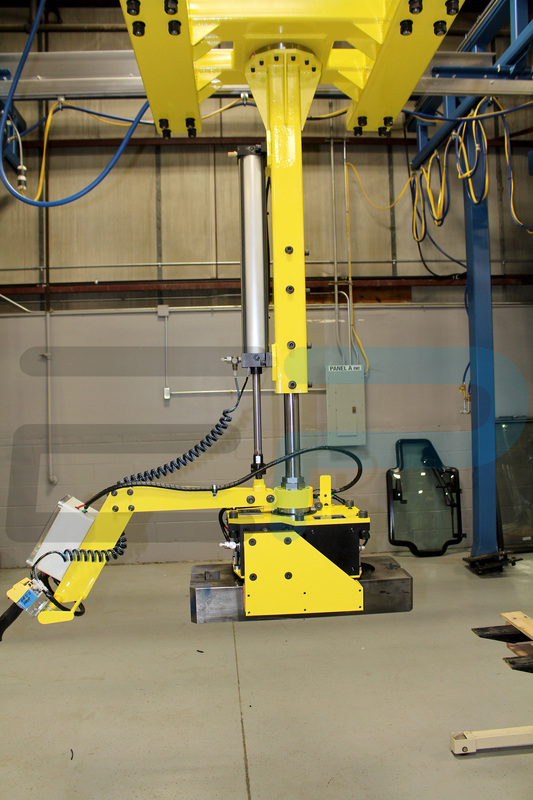 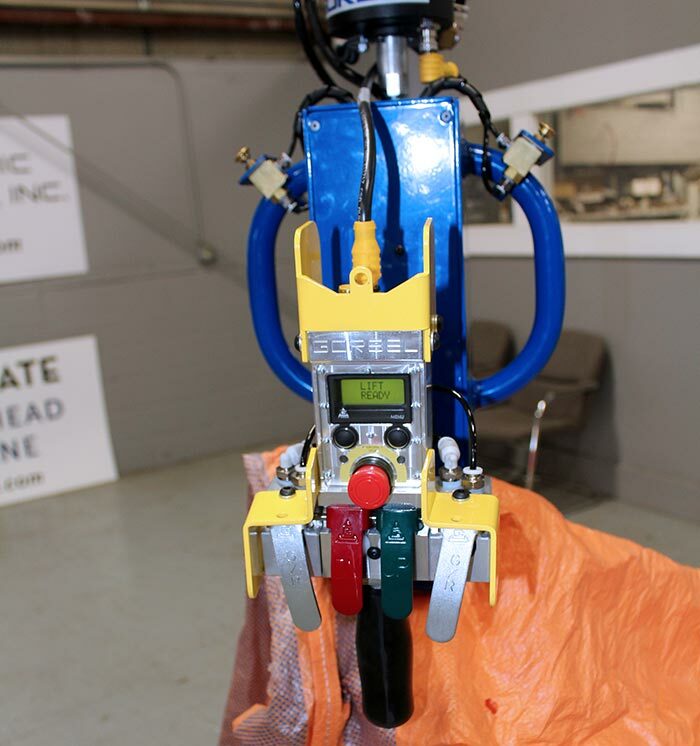 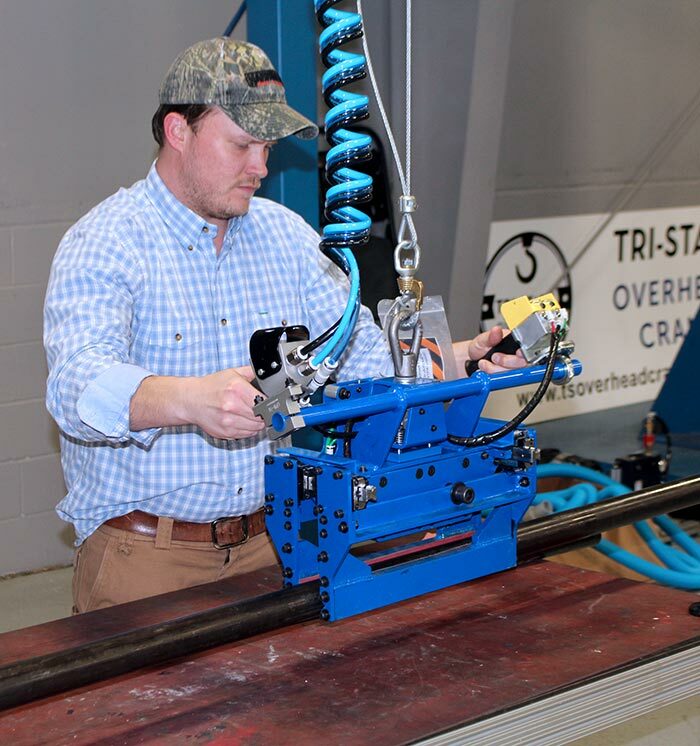 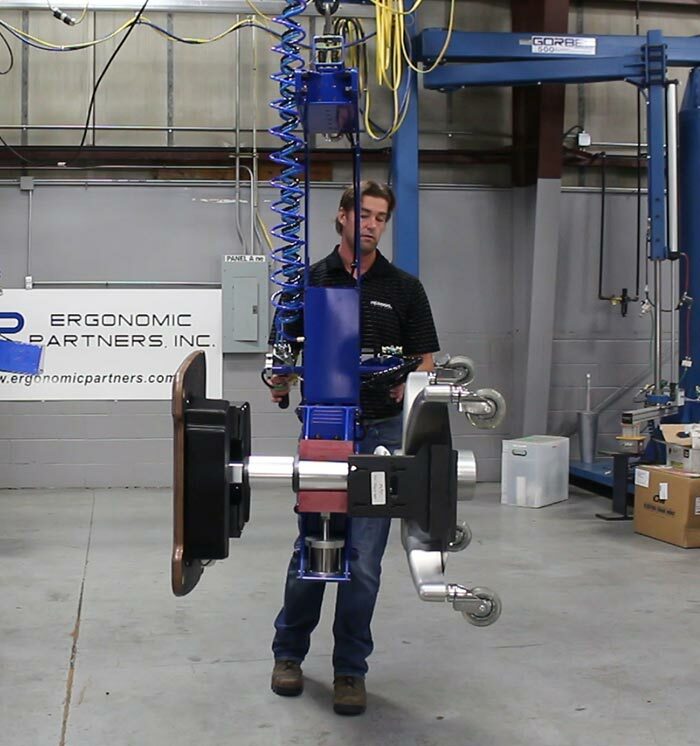 In most cases, custom lift assists are not built until the engineer, line worker, and your Ergonomic Partners representative collaborate and refine the lifting devices' design and use. 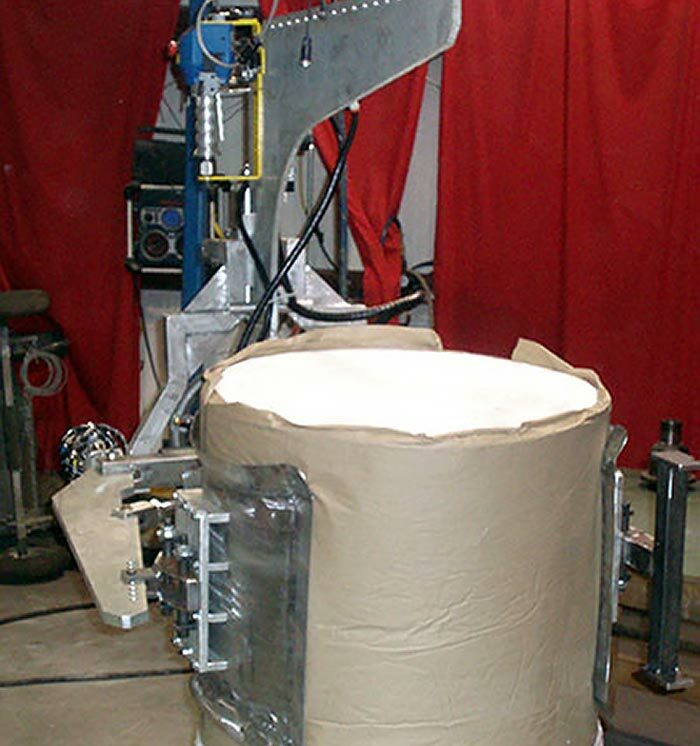 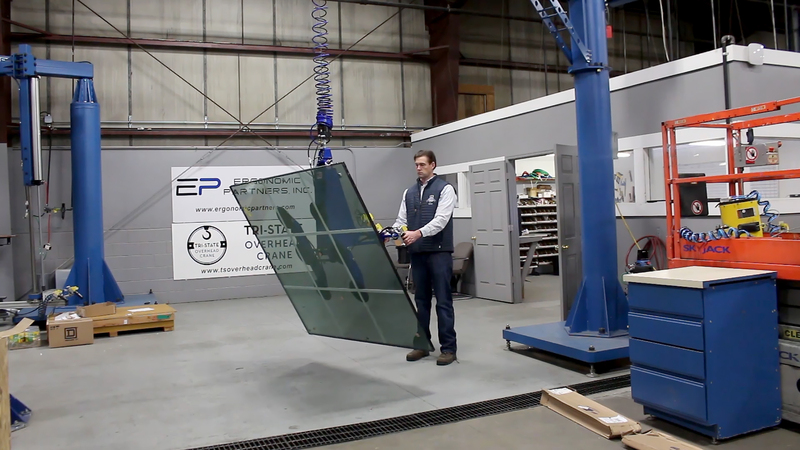 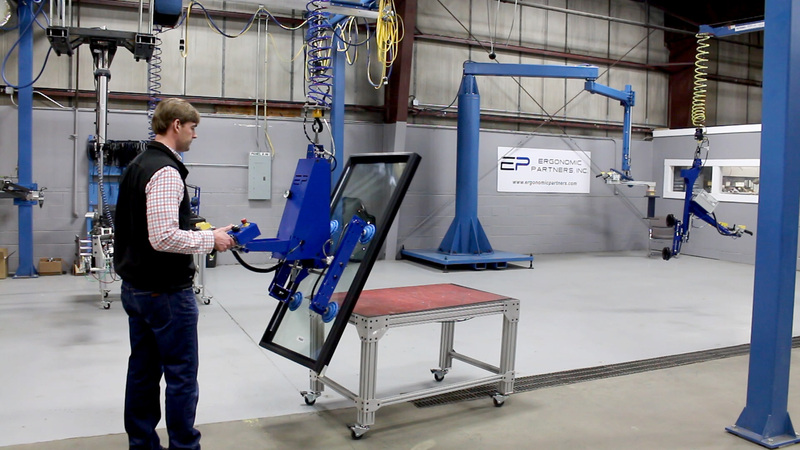 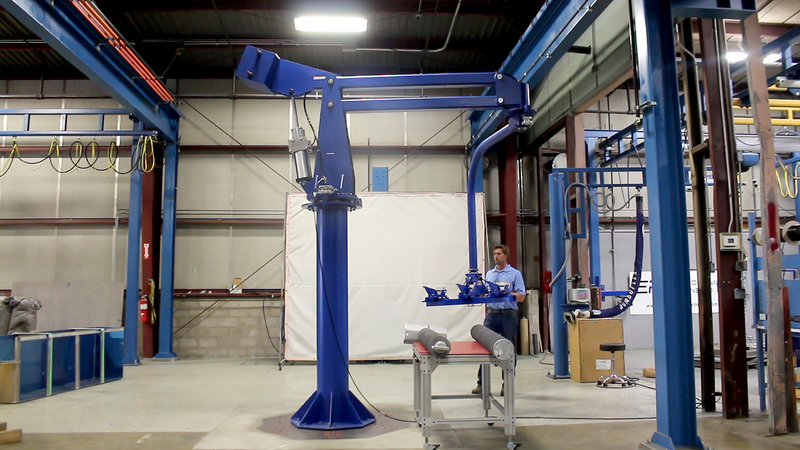 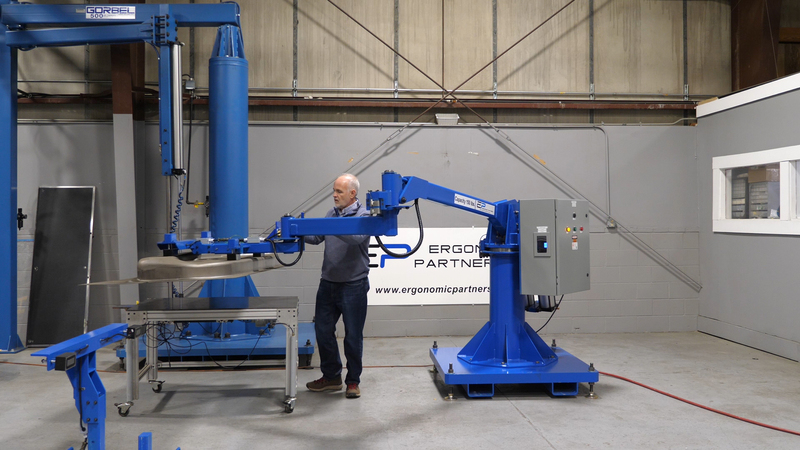 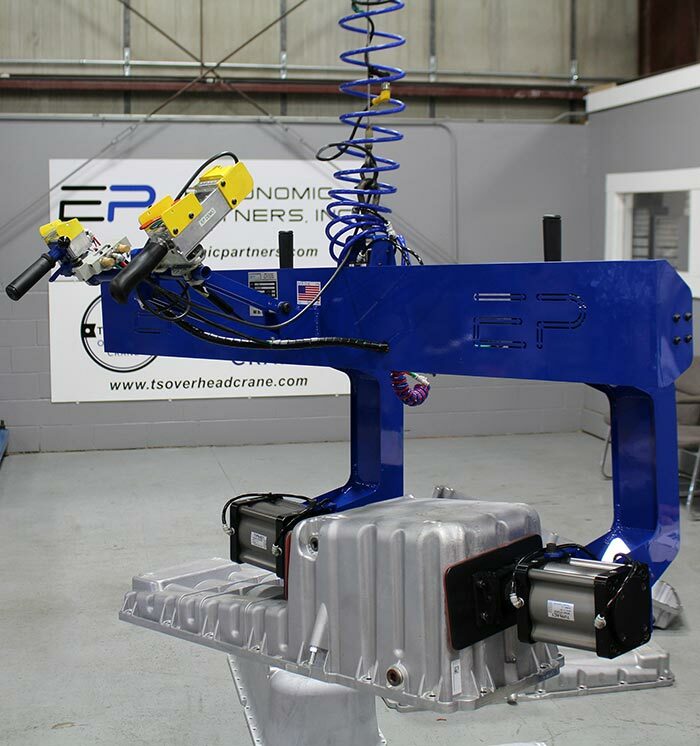 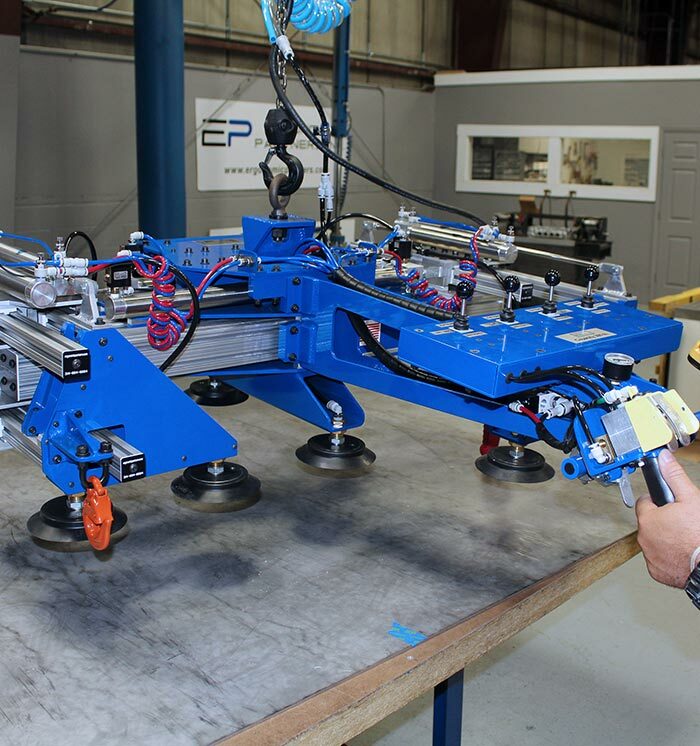 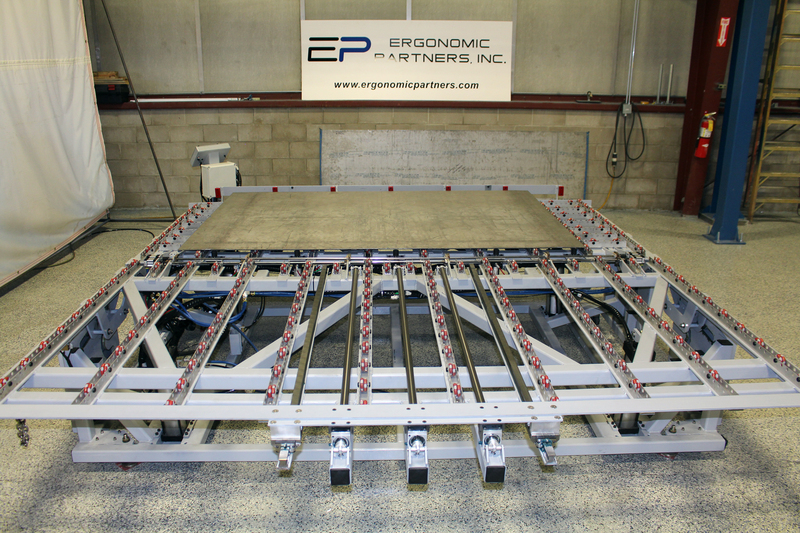 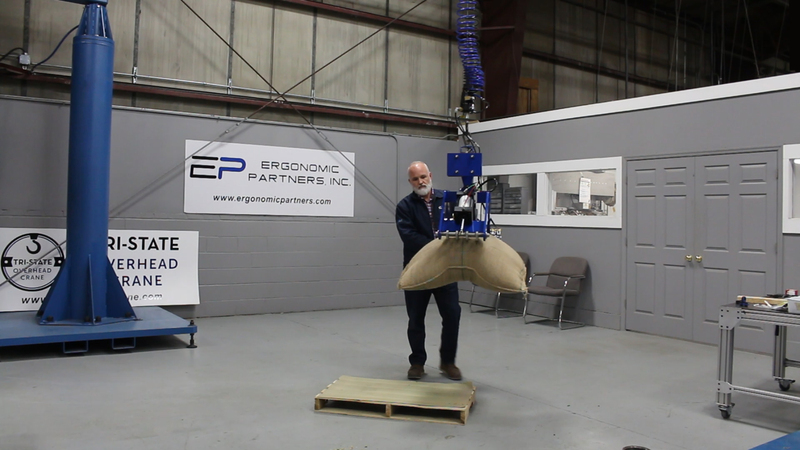 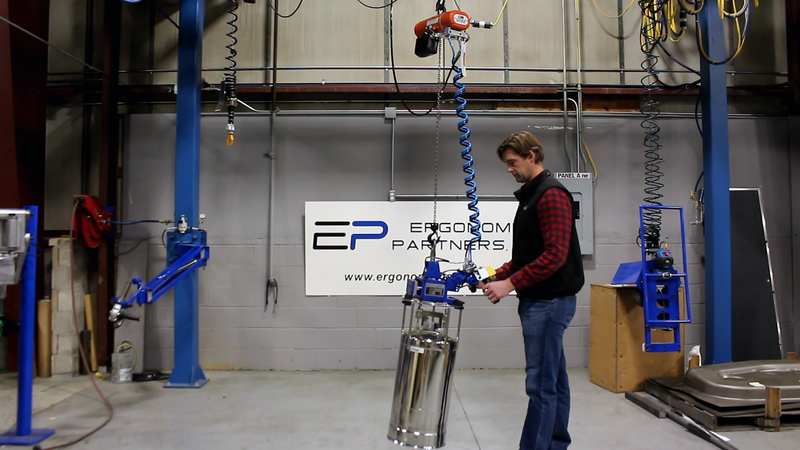 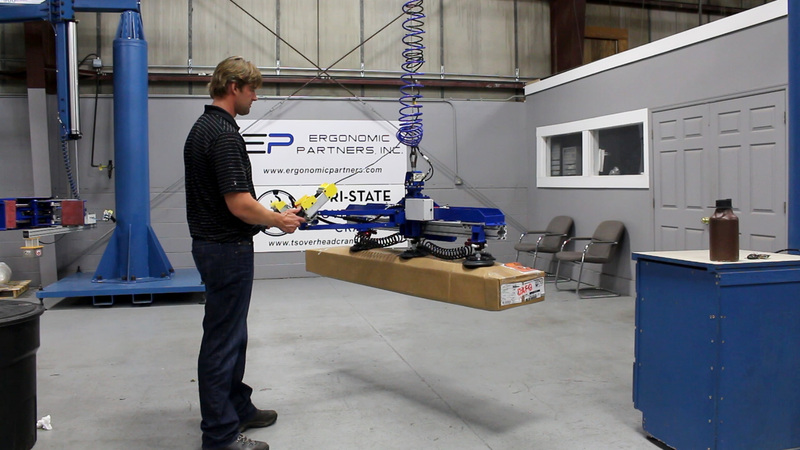 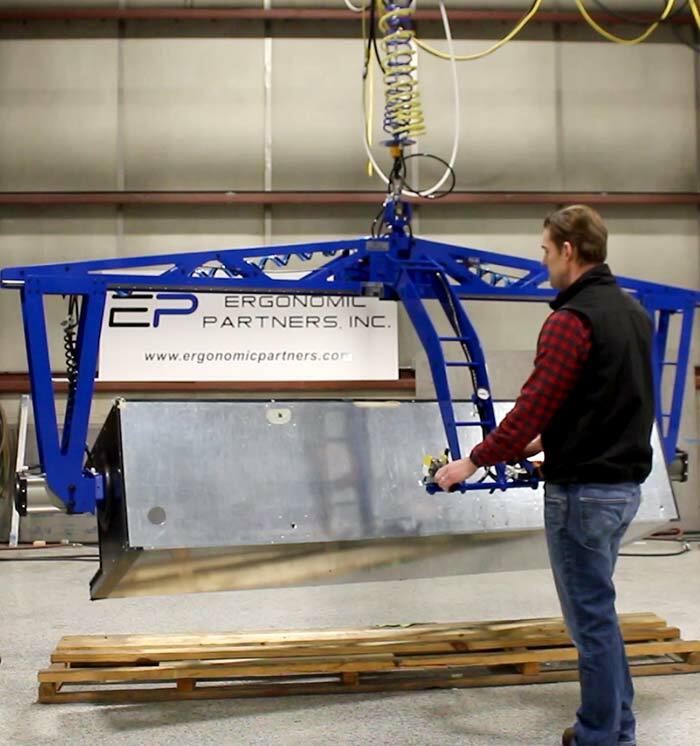 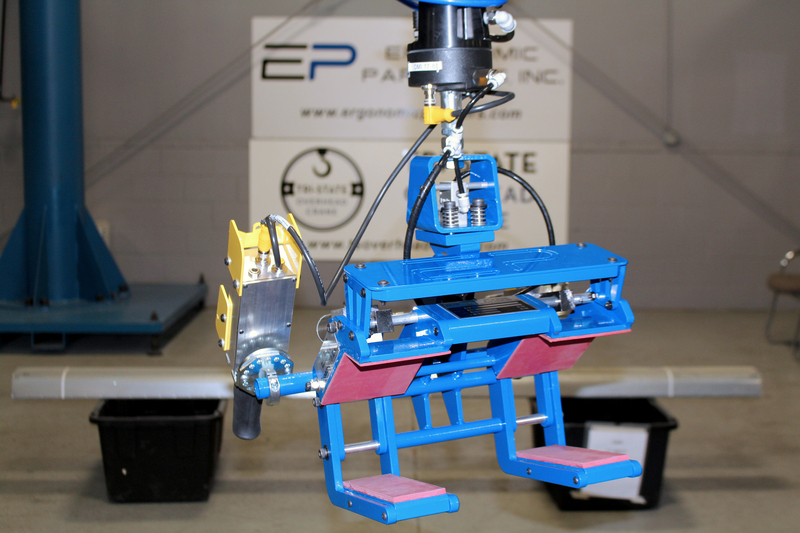 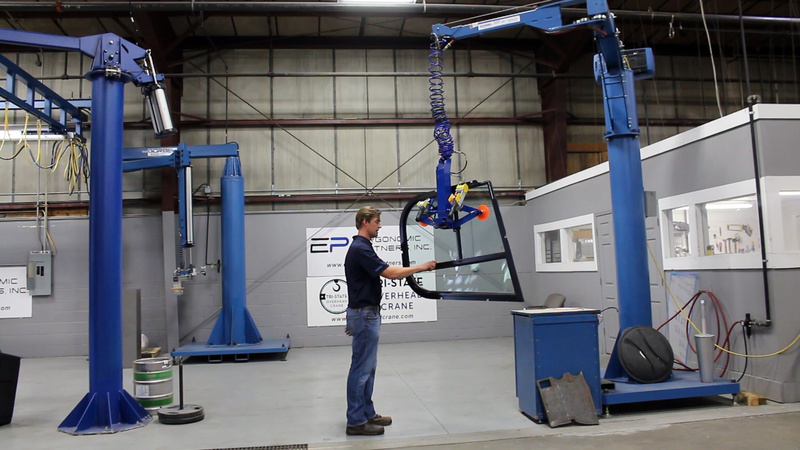 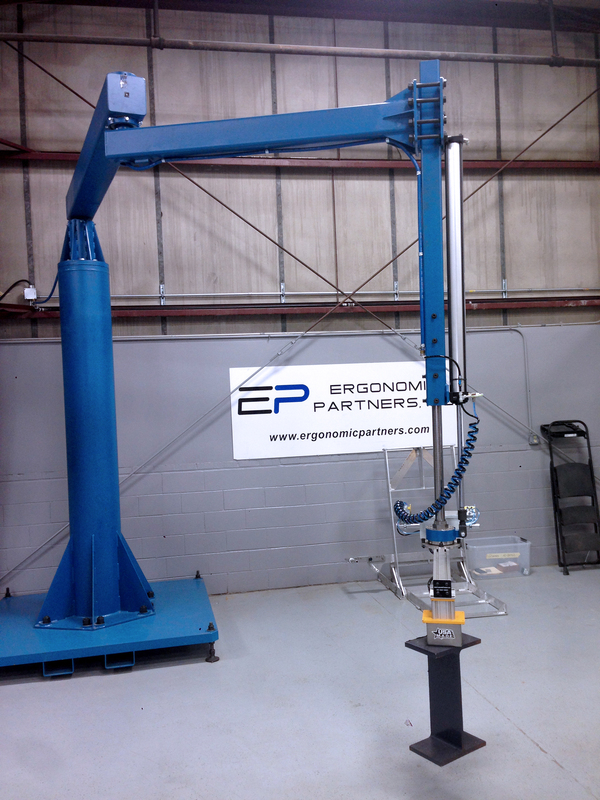 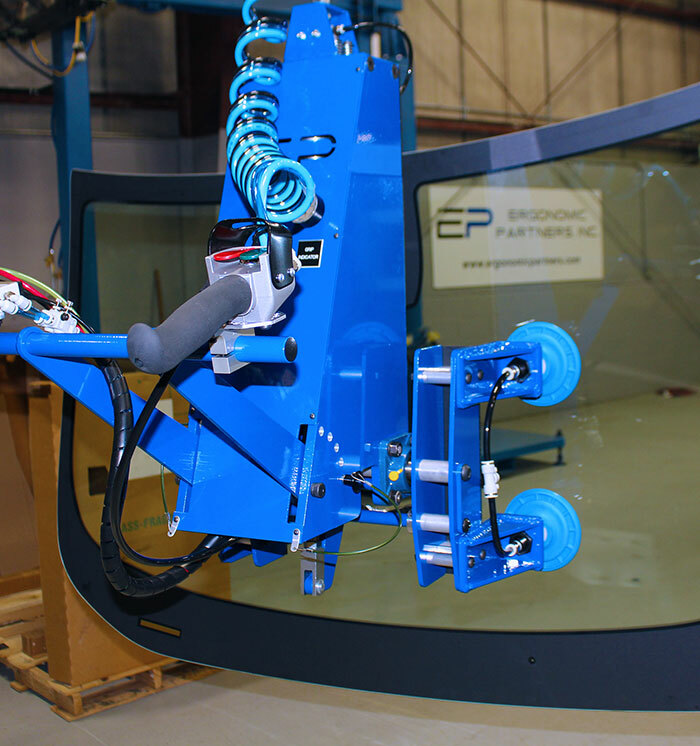 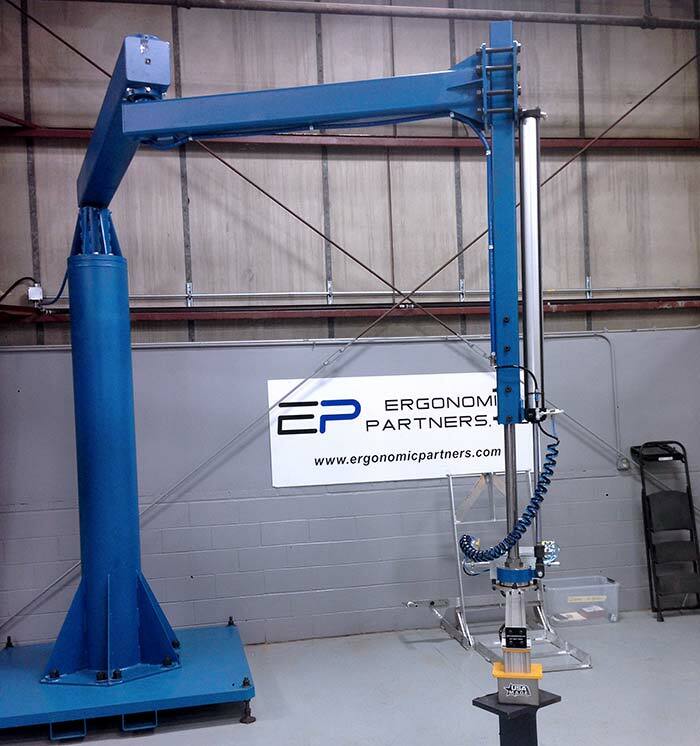 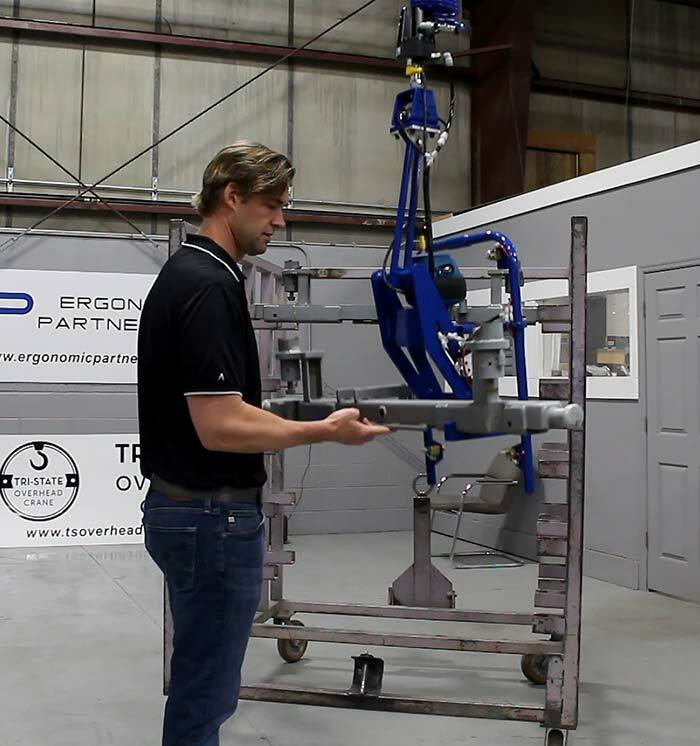 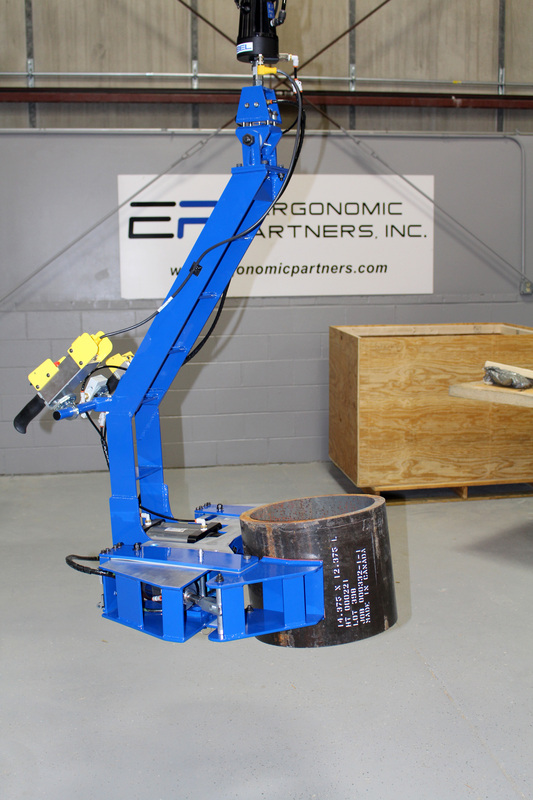 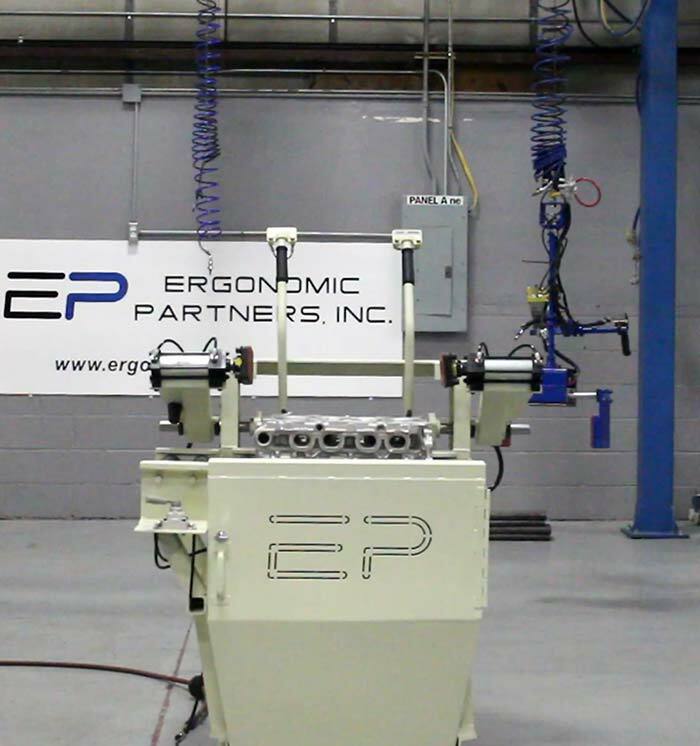 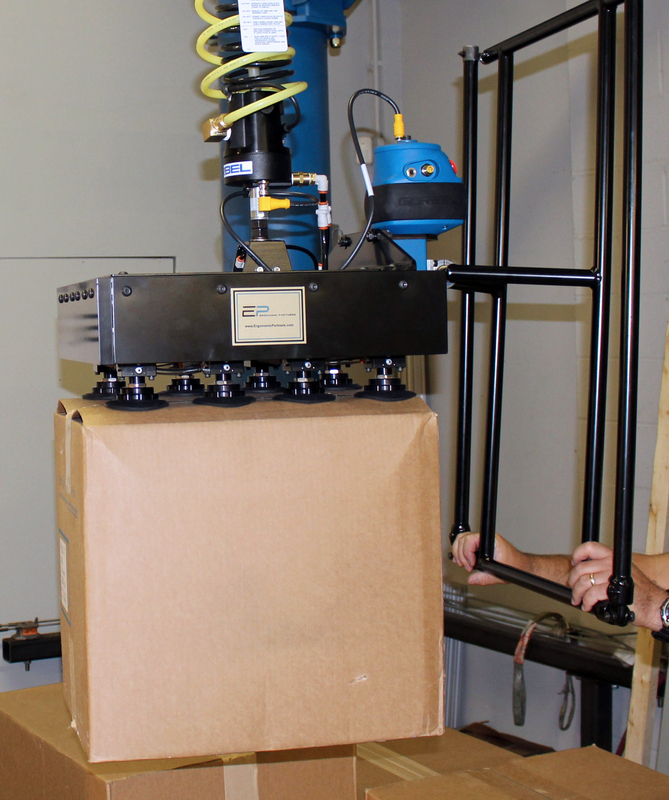 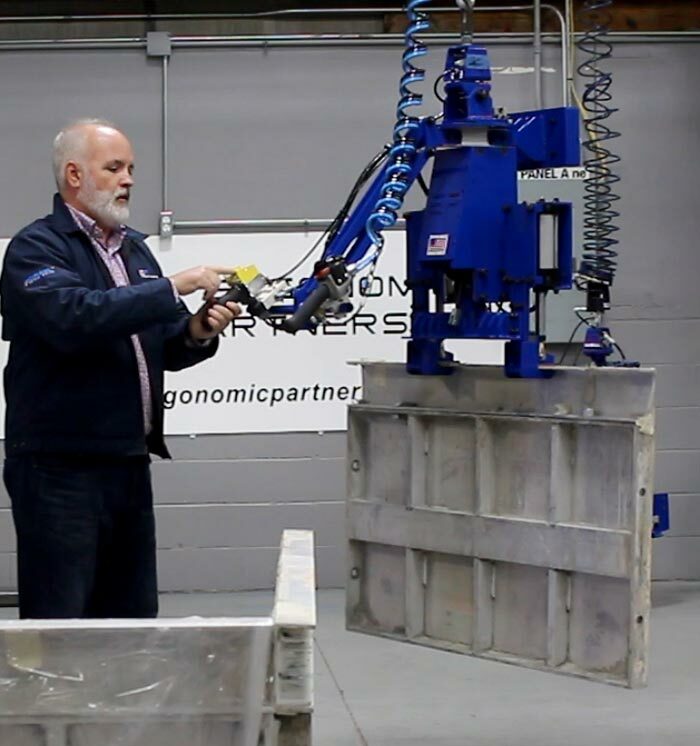 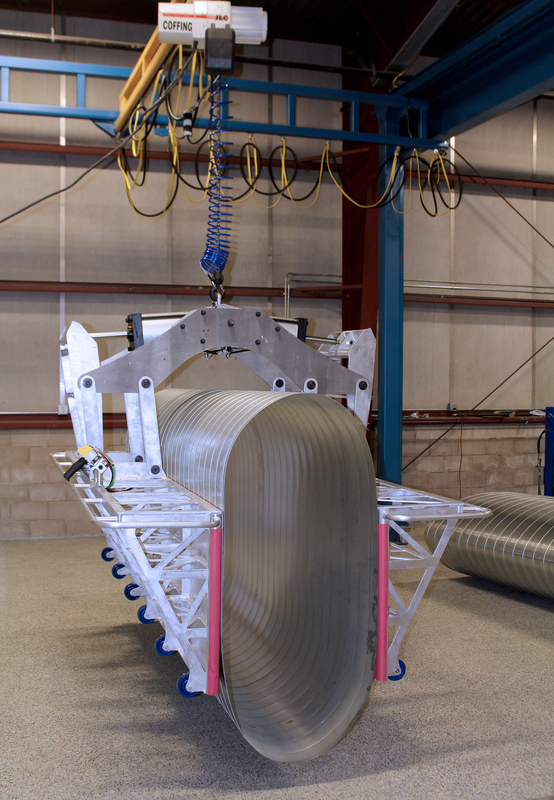 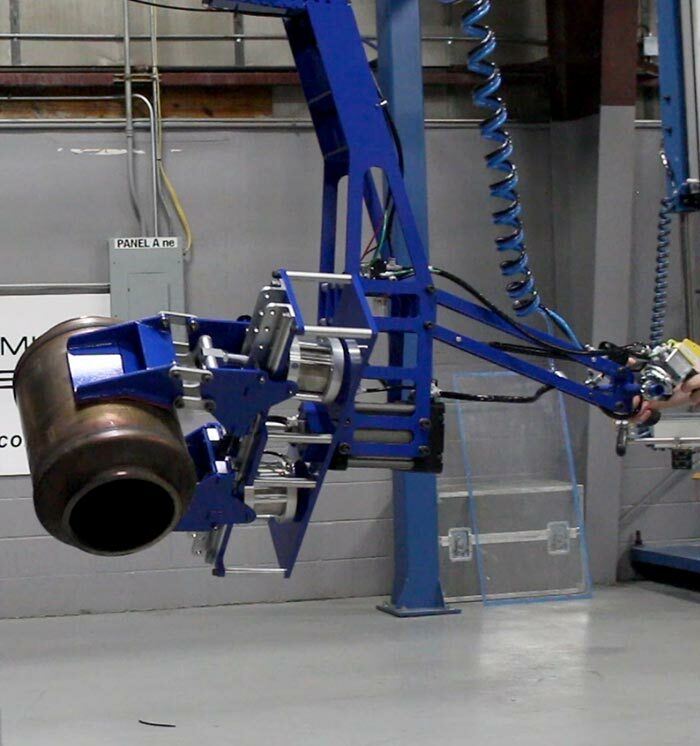 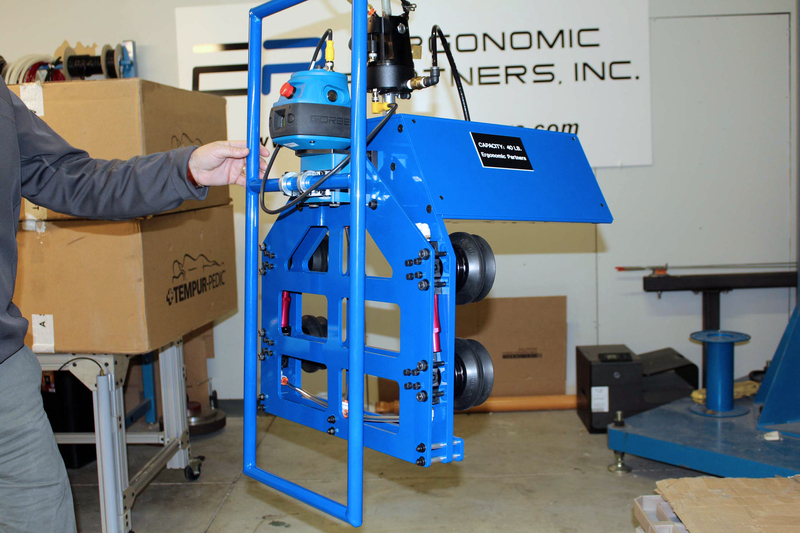 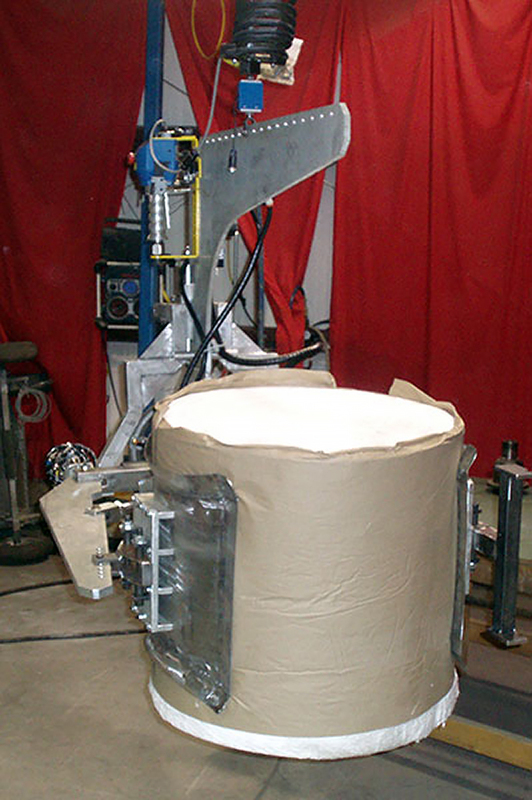 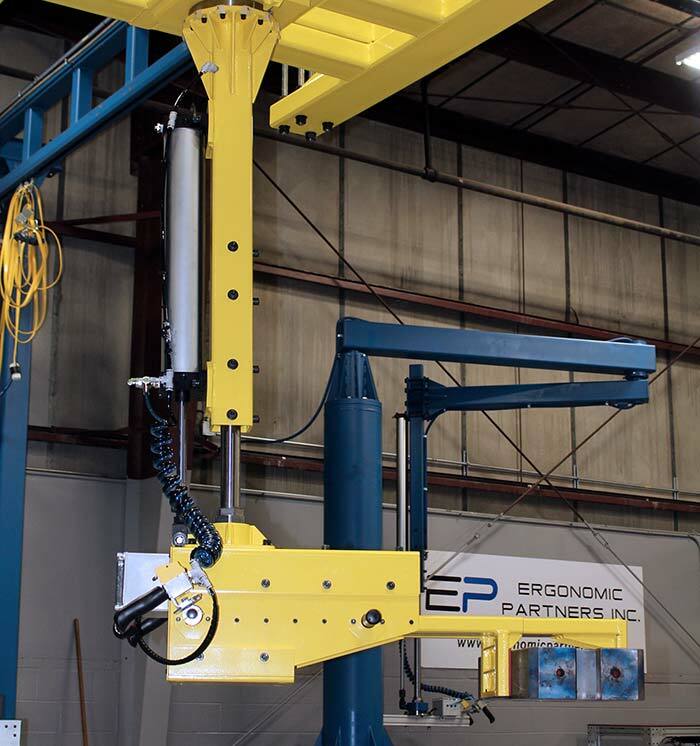 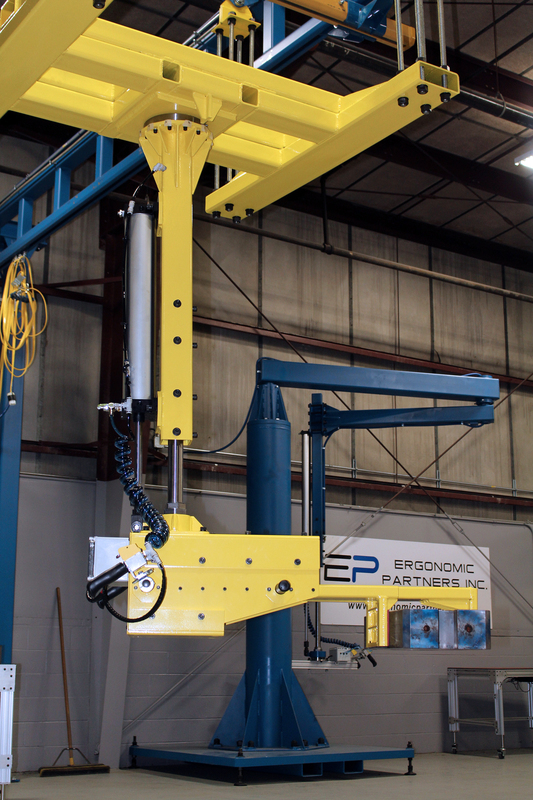 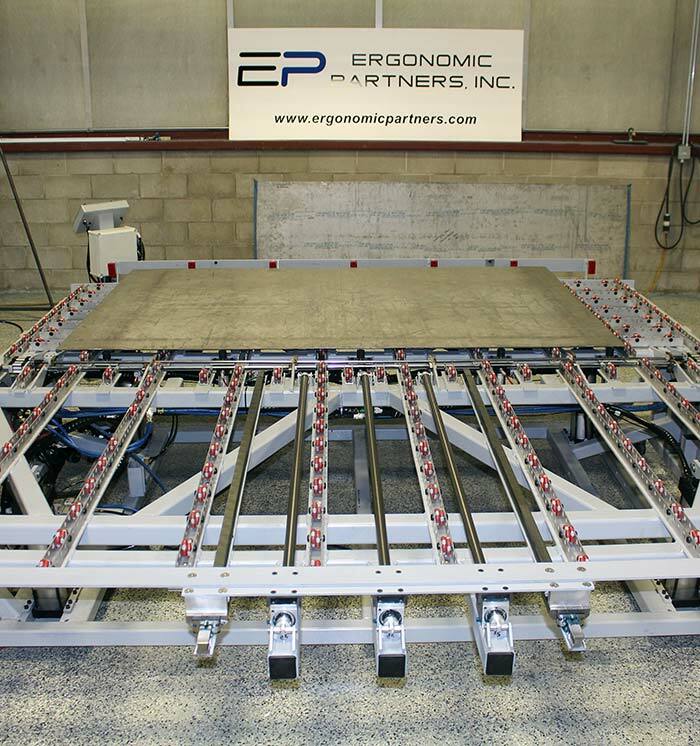 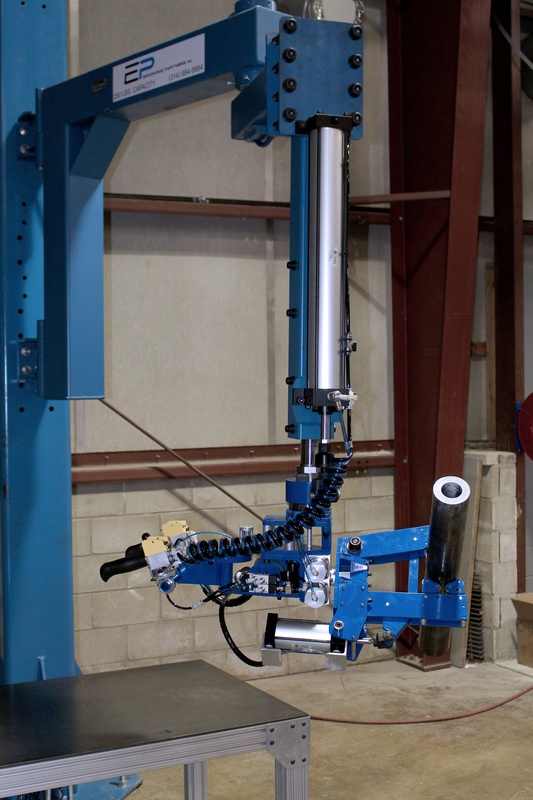 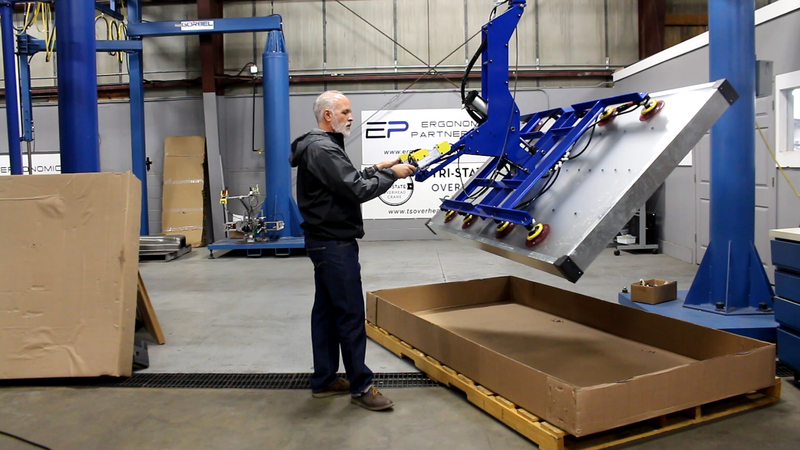 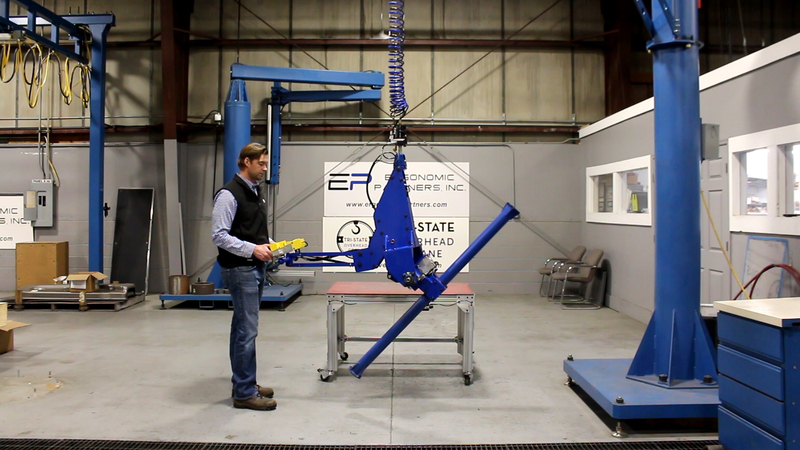 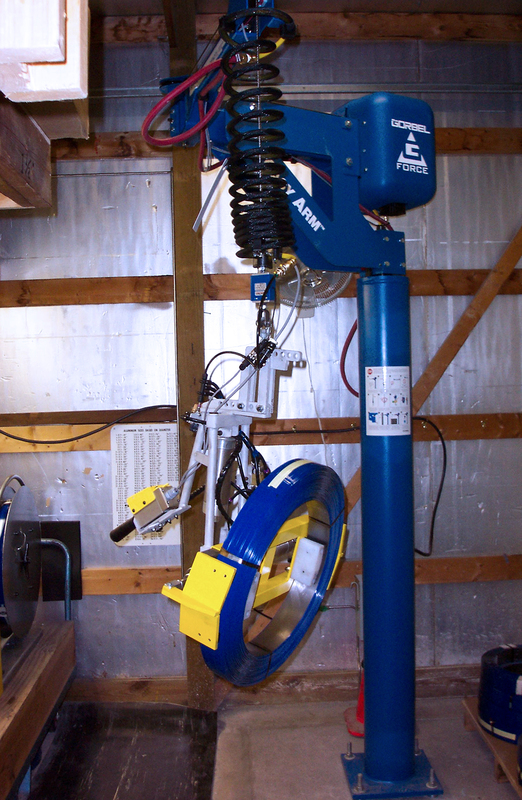 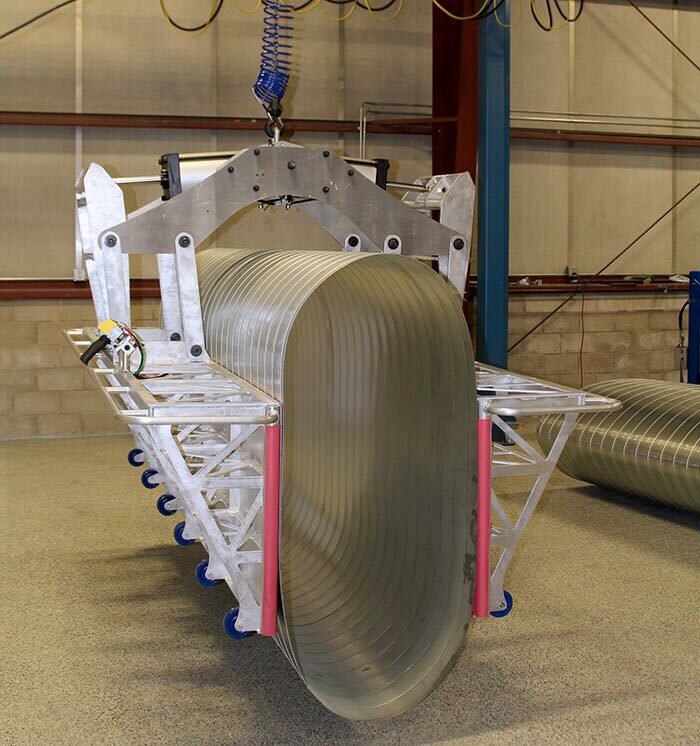 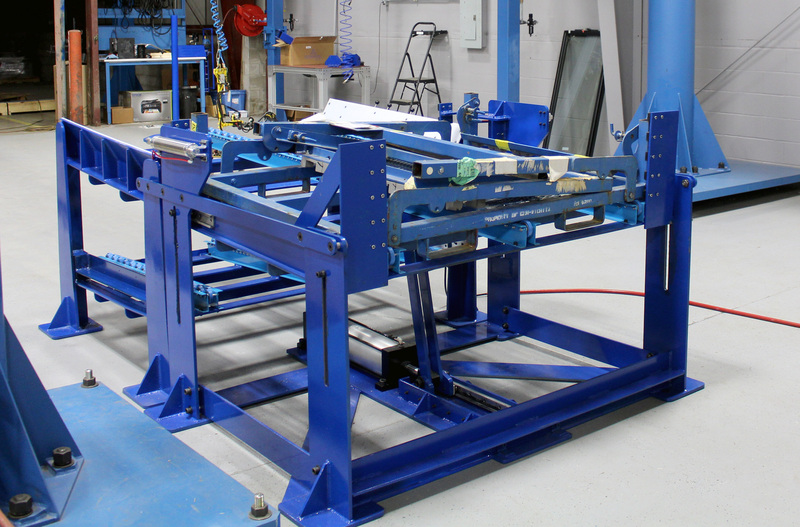 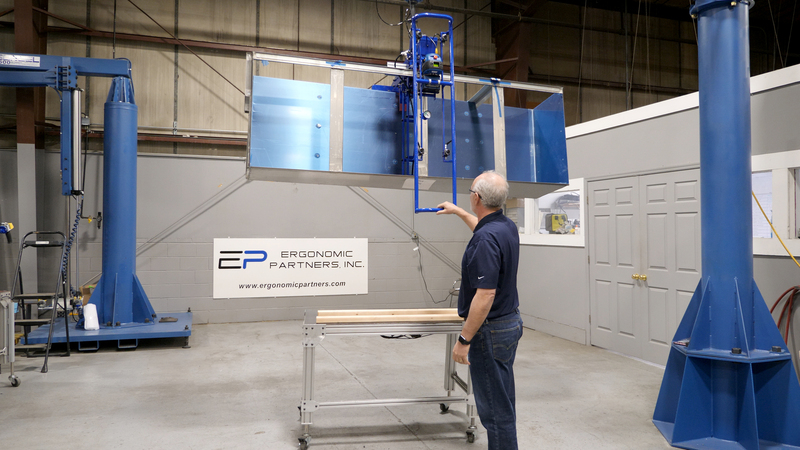 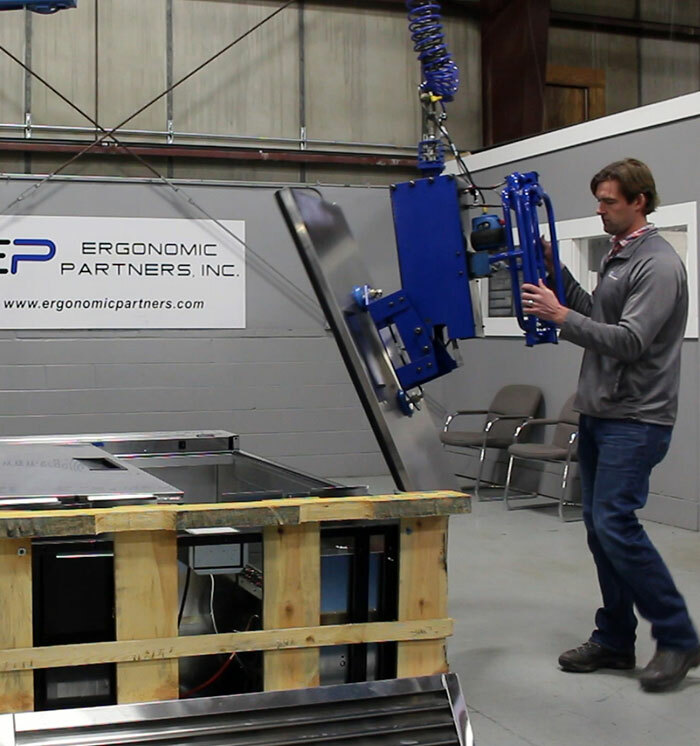 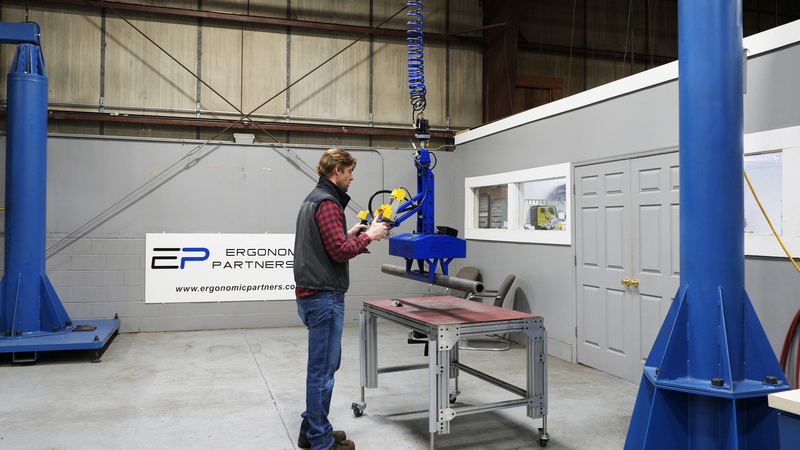 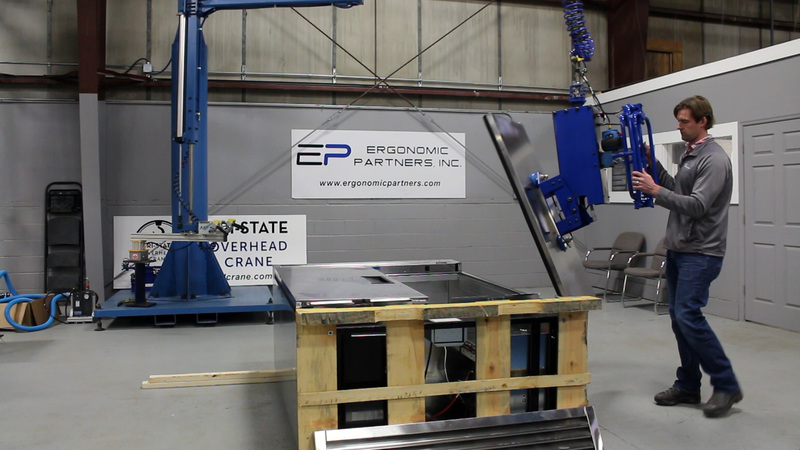 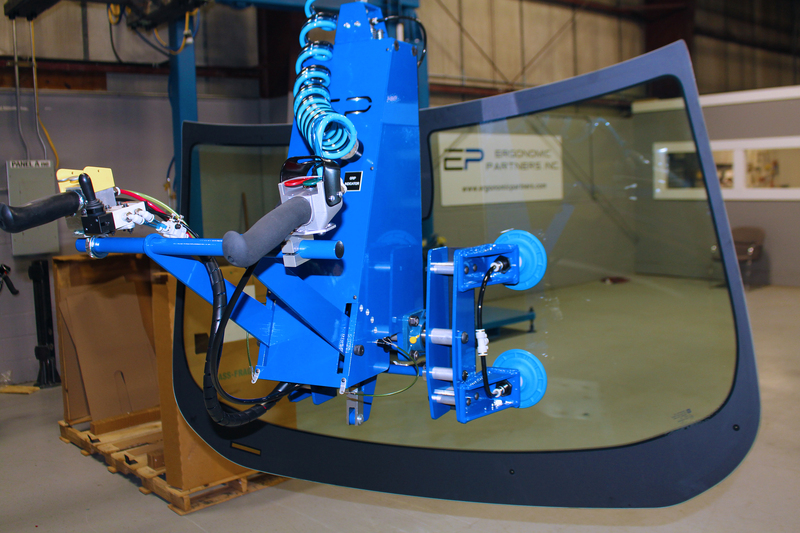 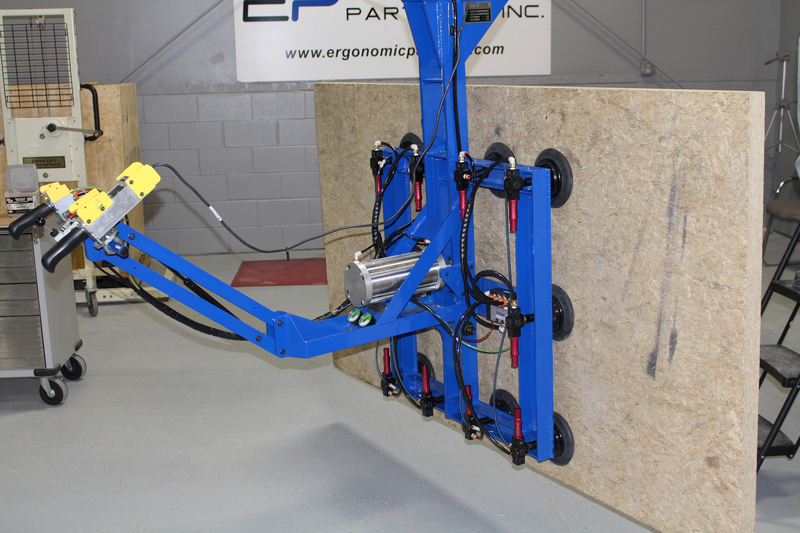 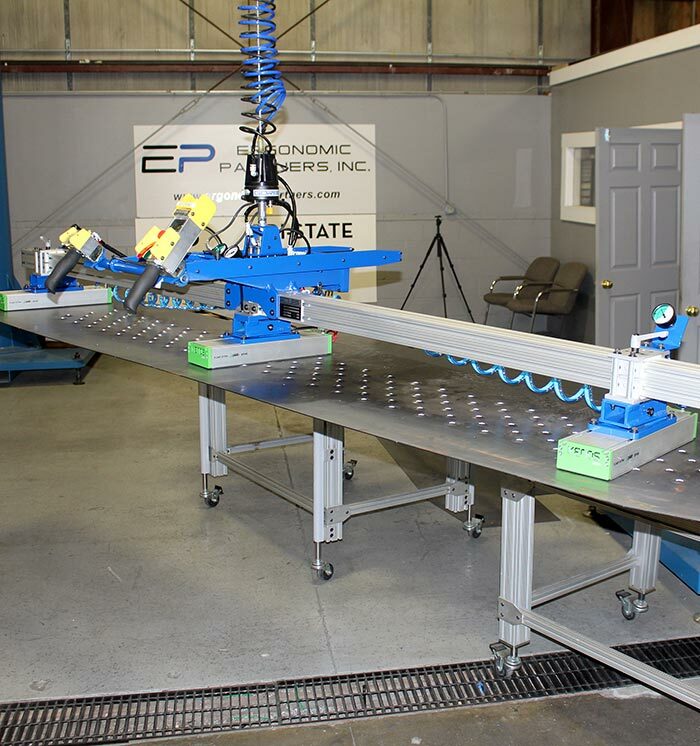 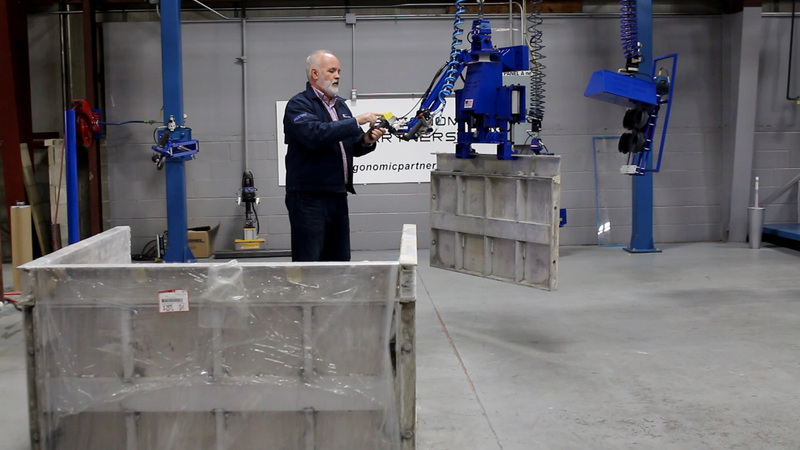 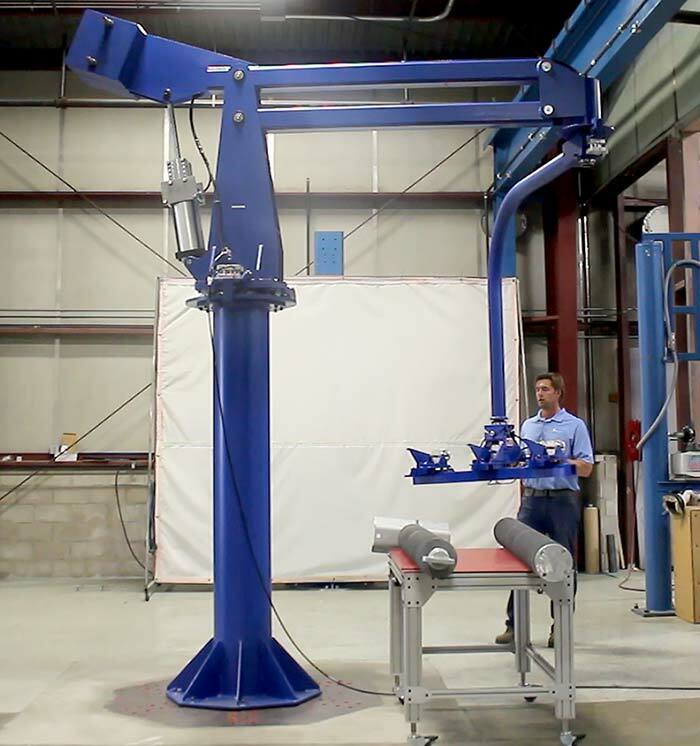 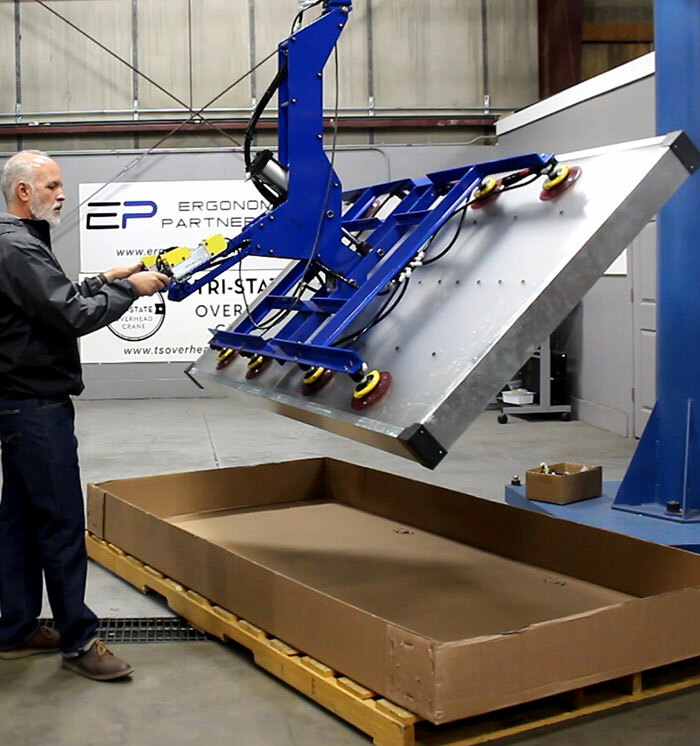 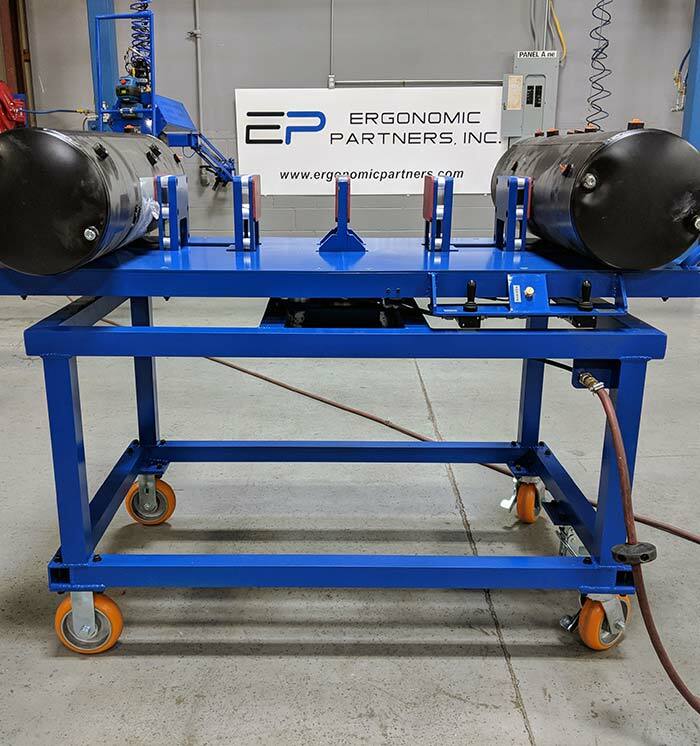 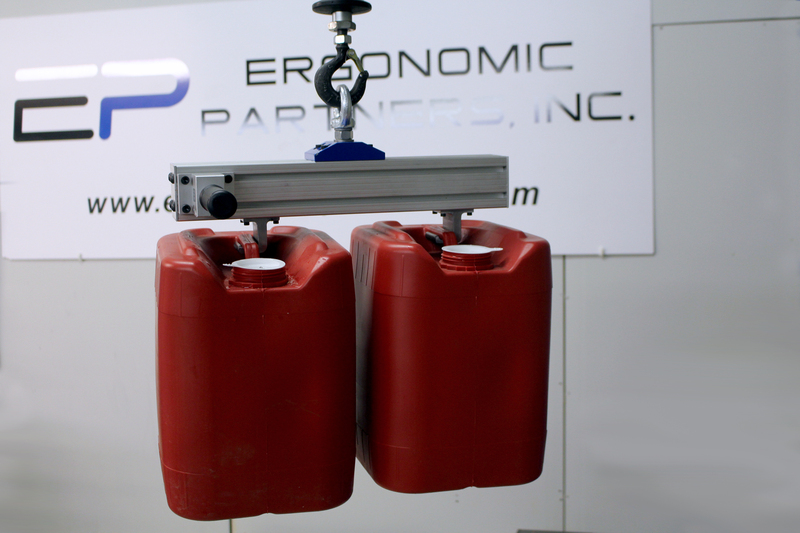 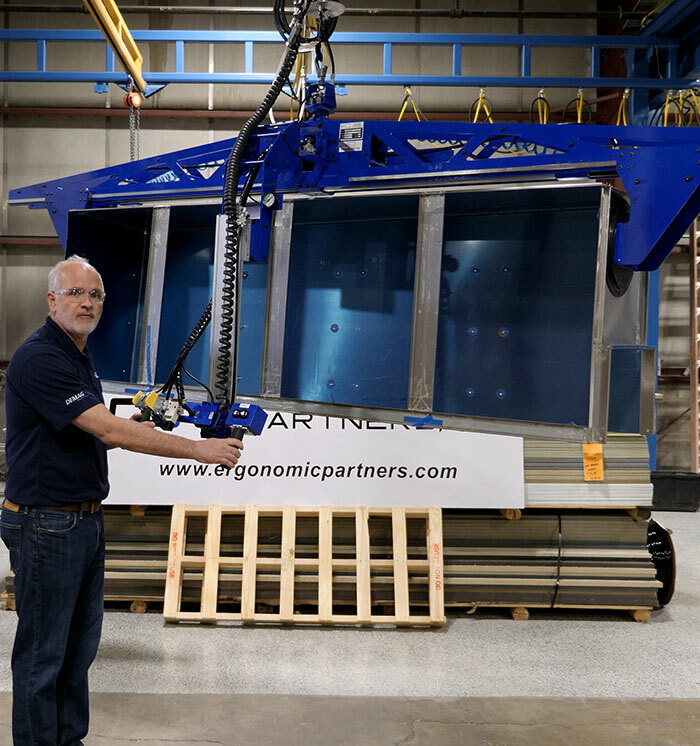 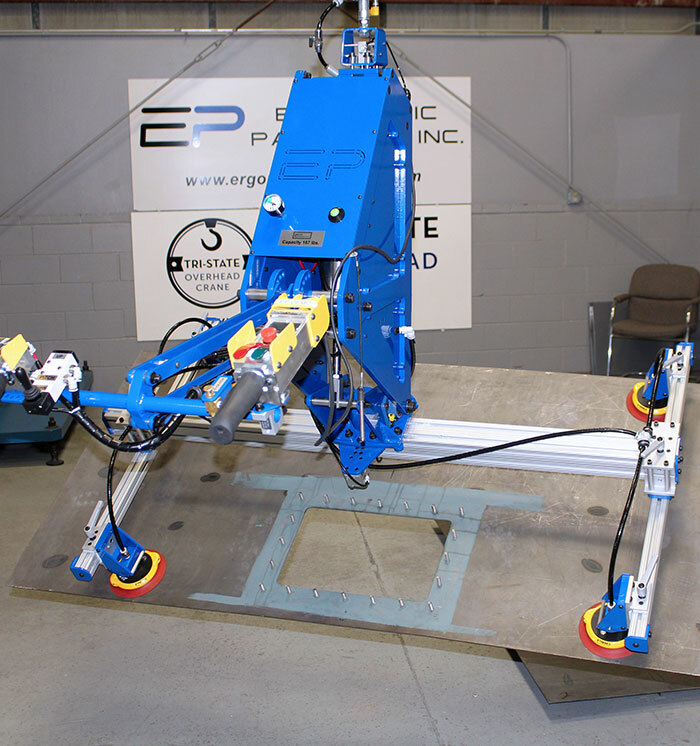 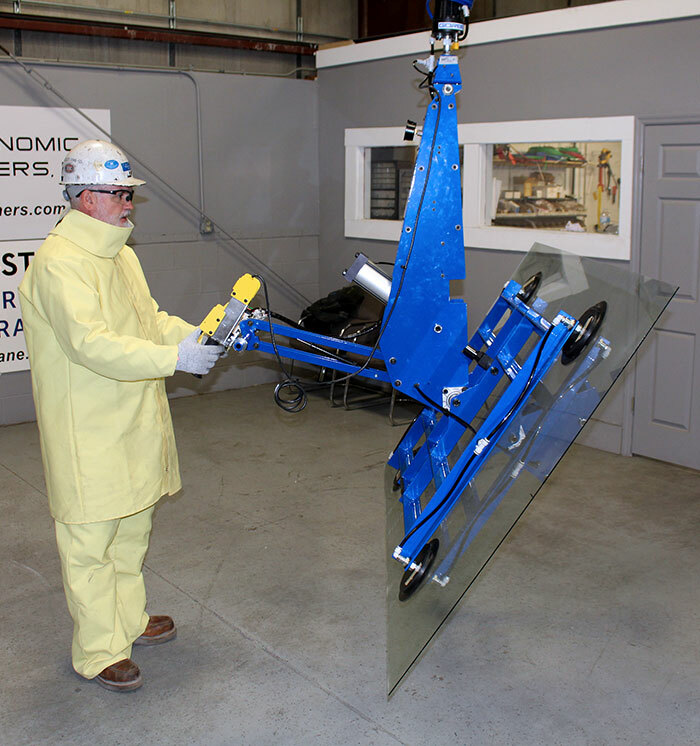 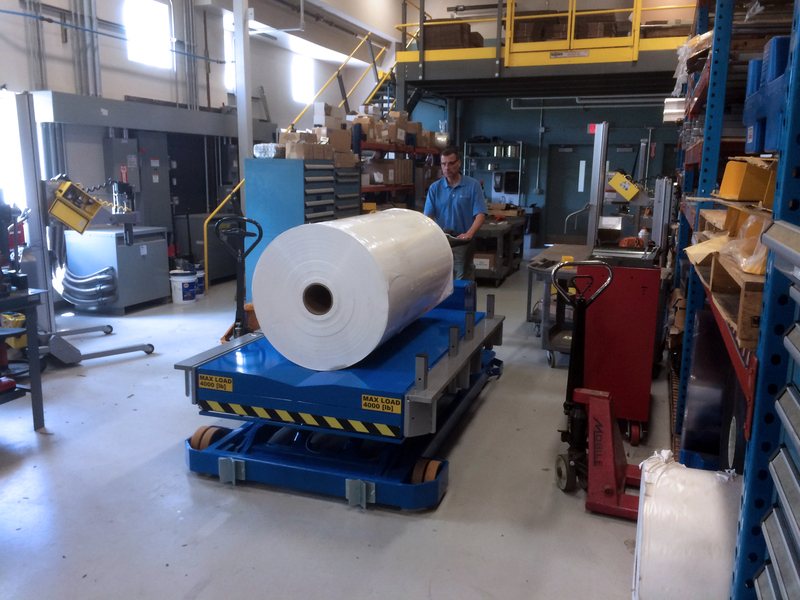 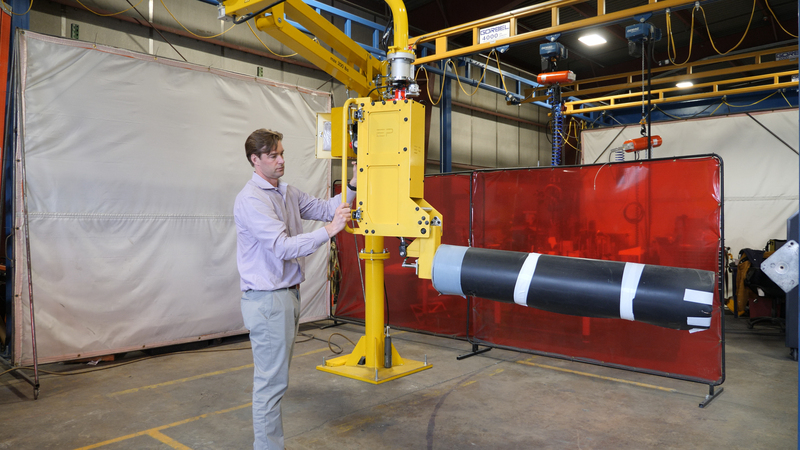 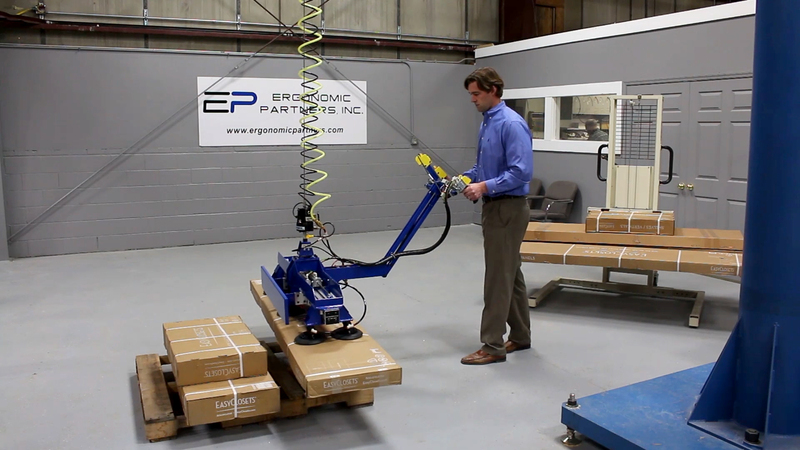 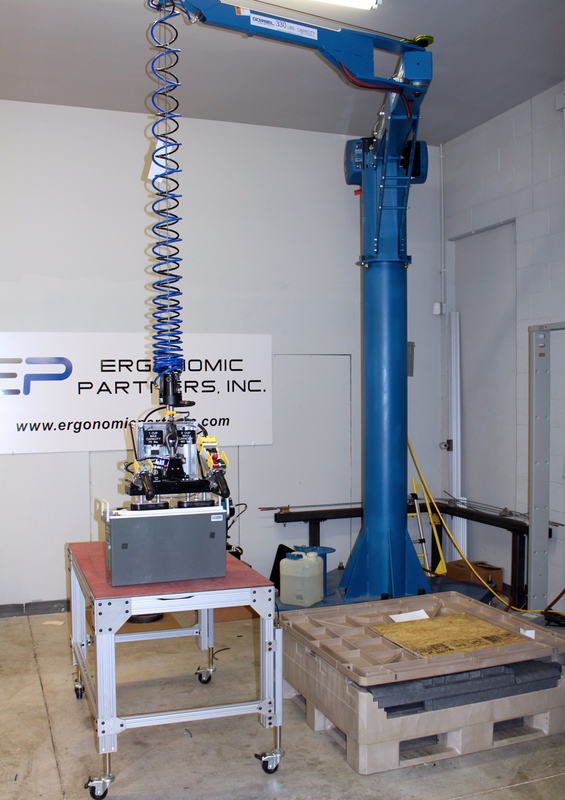 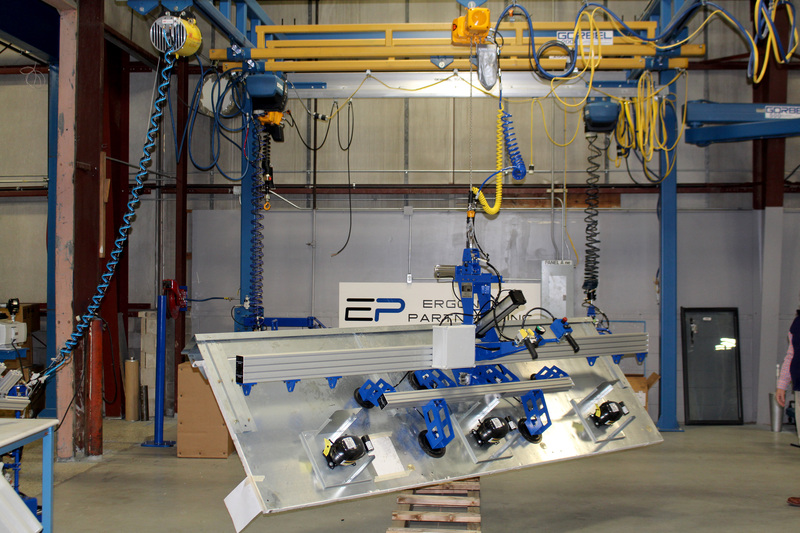 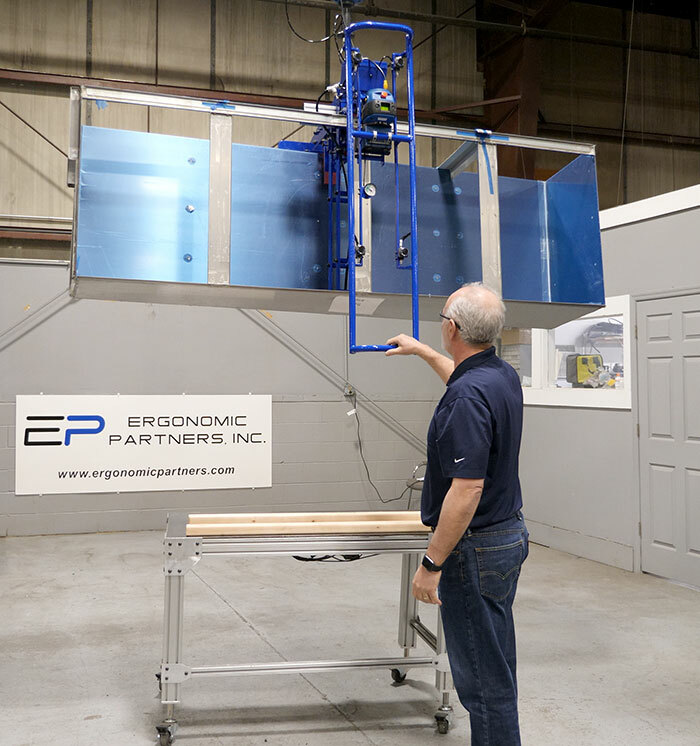 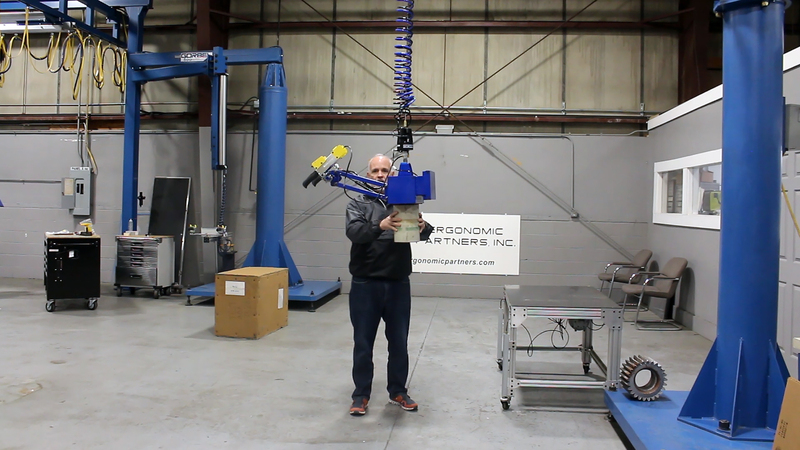 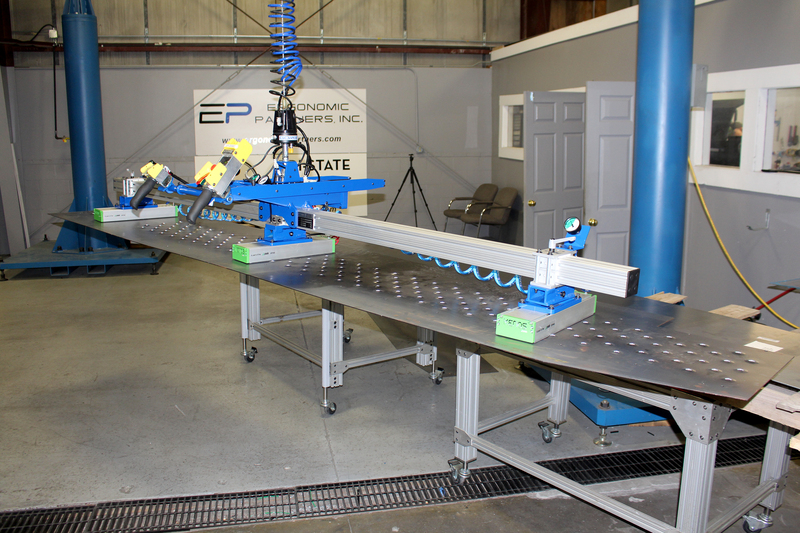 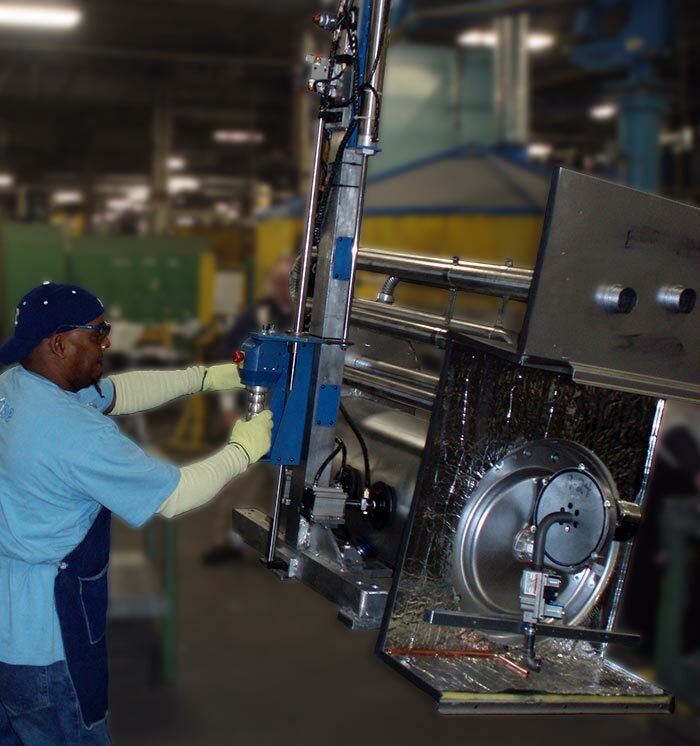 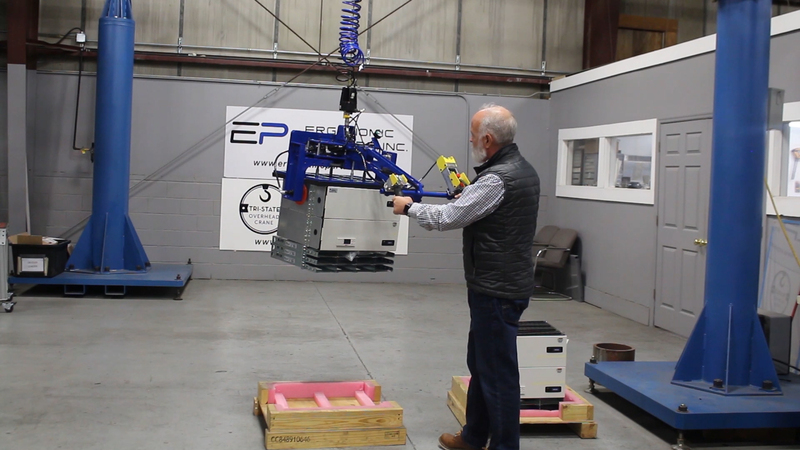 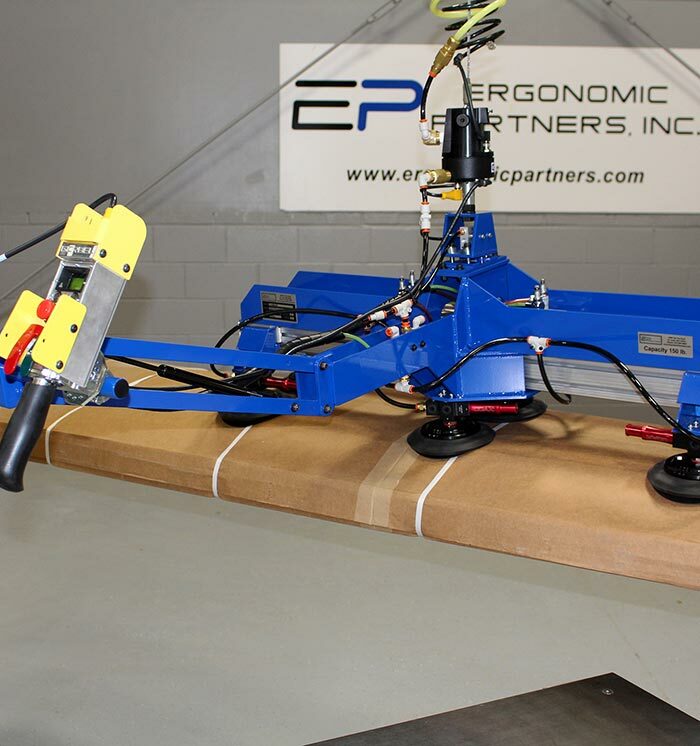 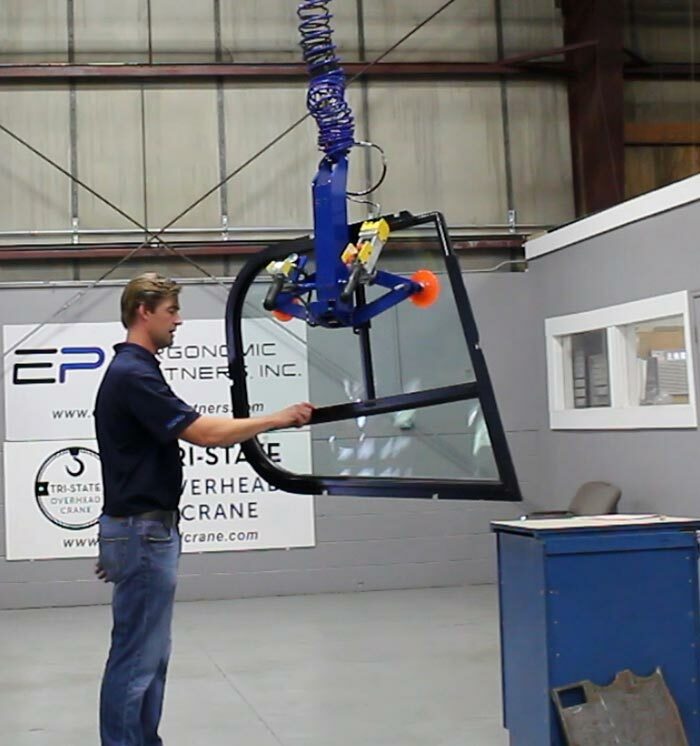 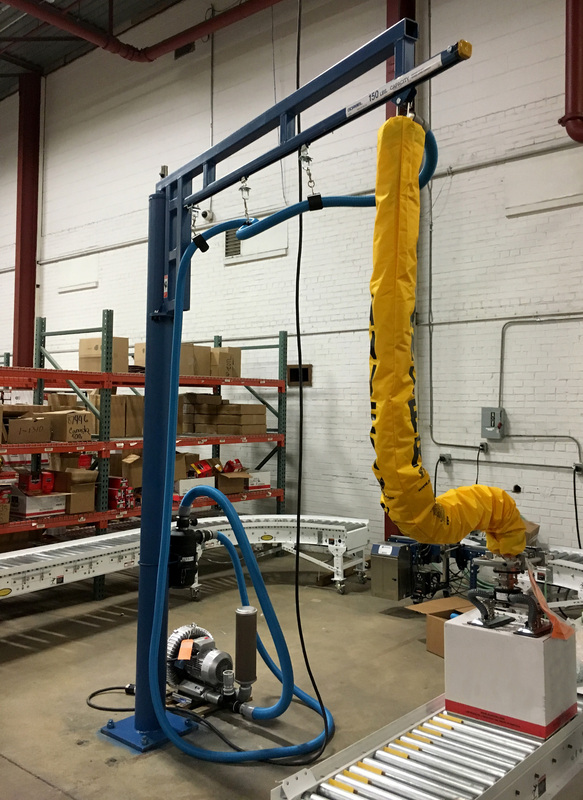 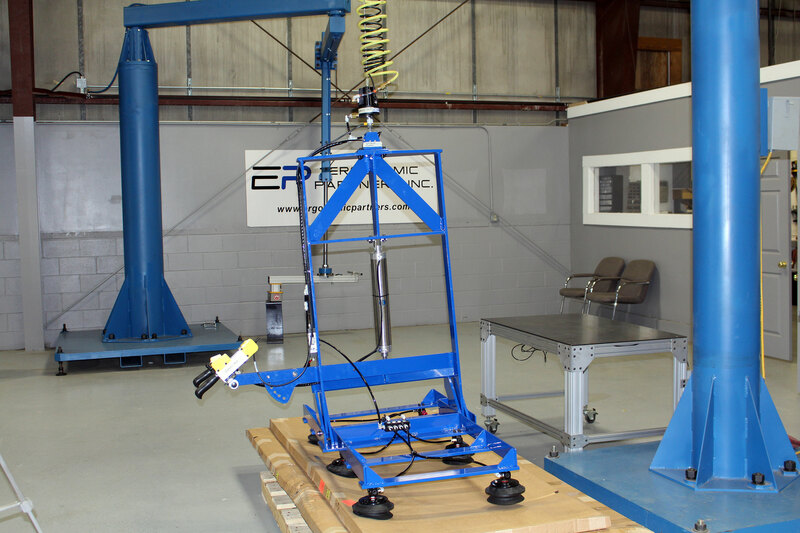 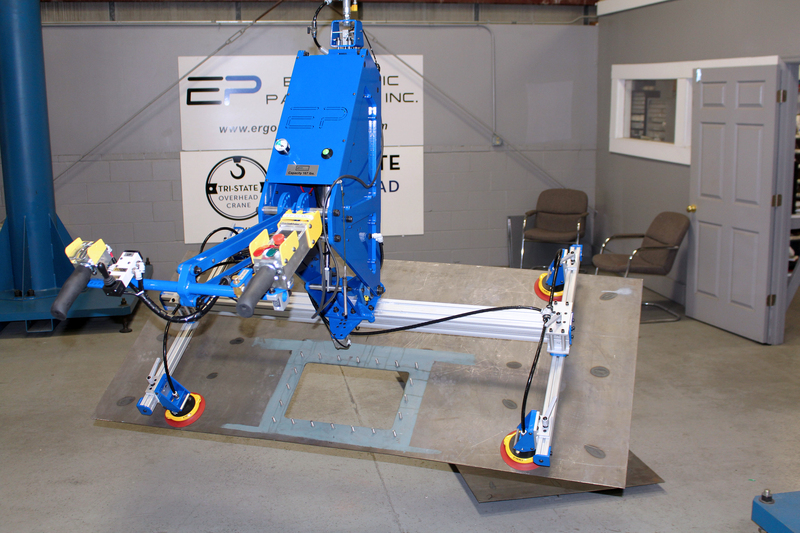 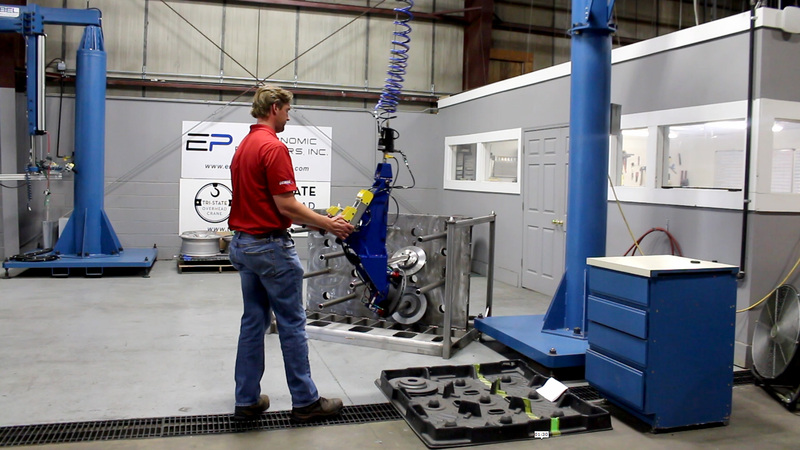 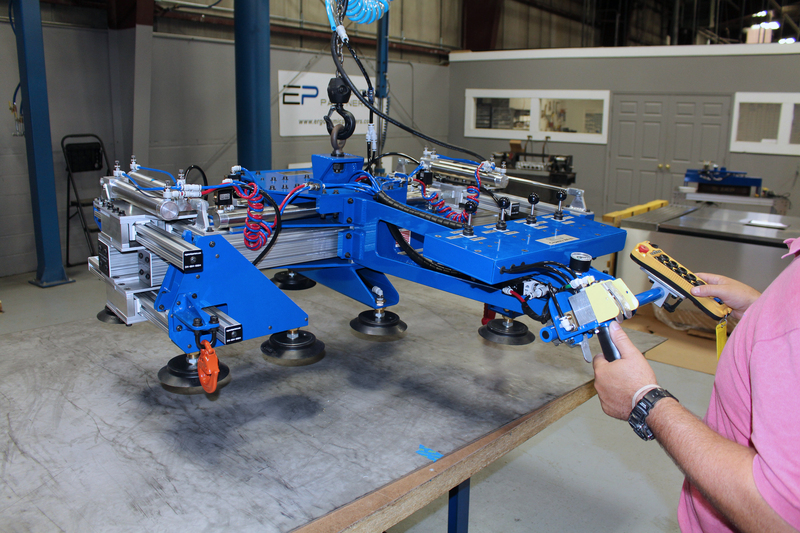 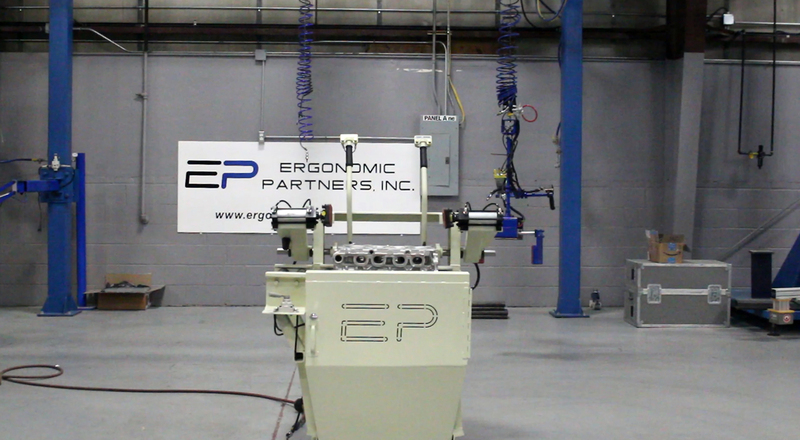 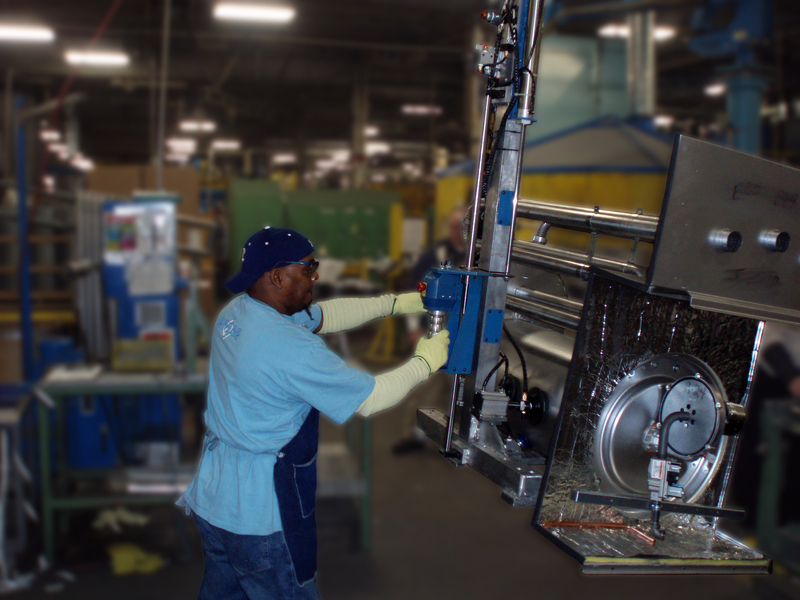 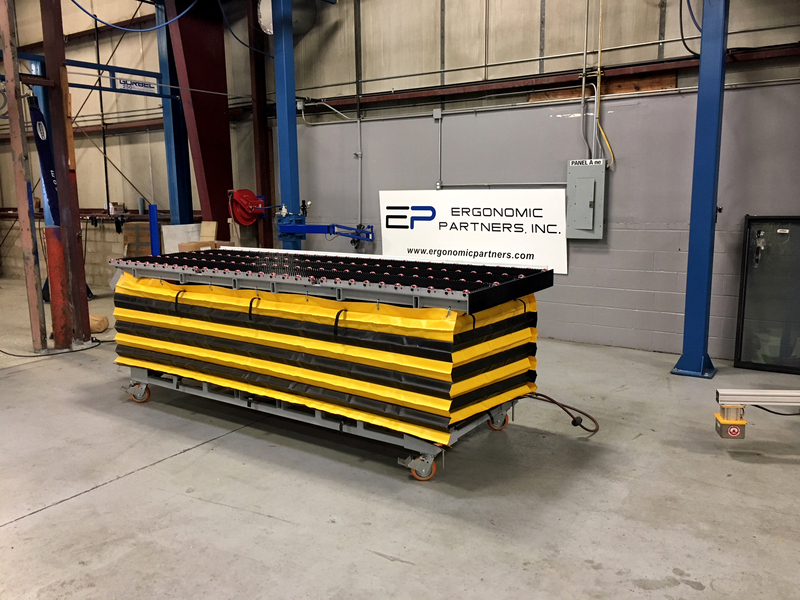 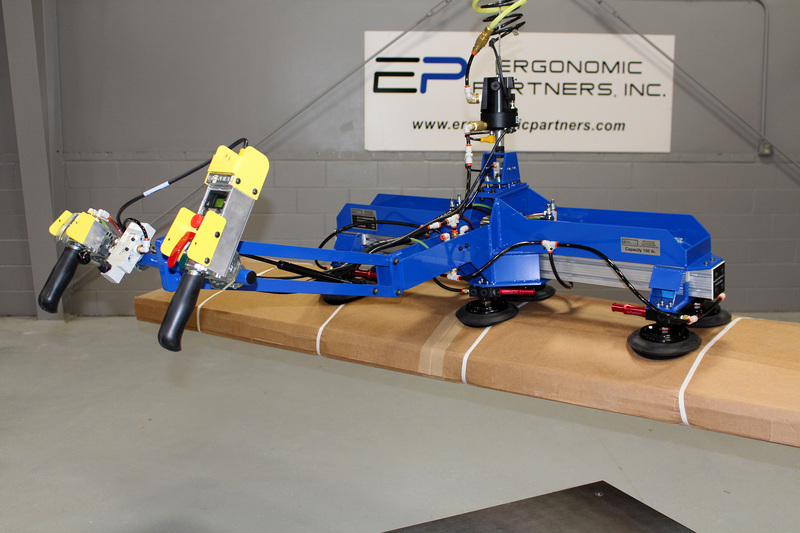 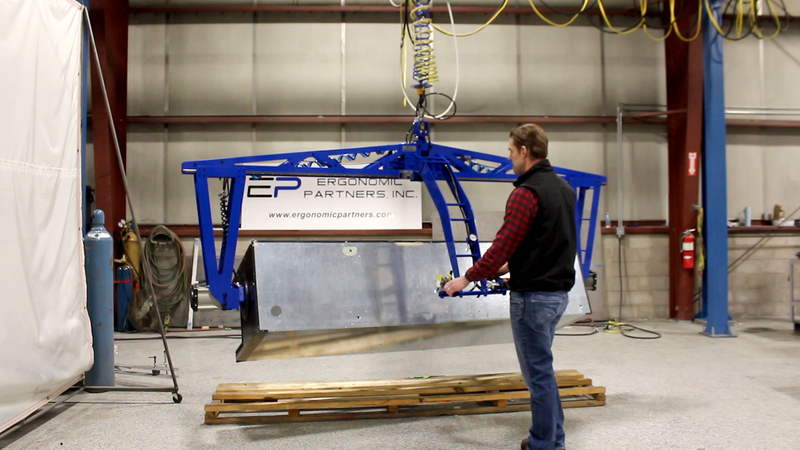 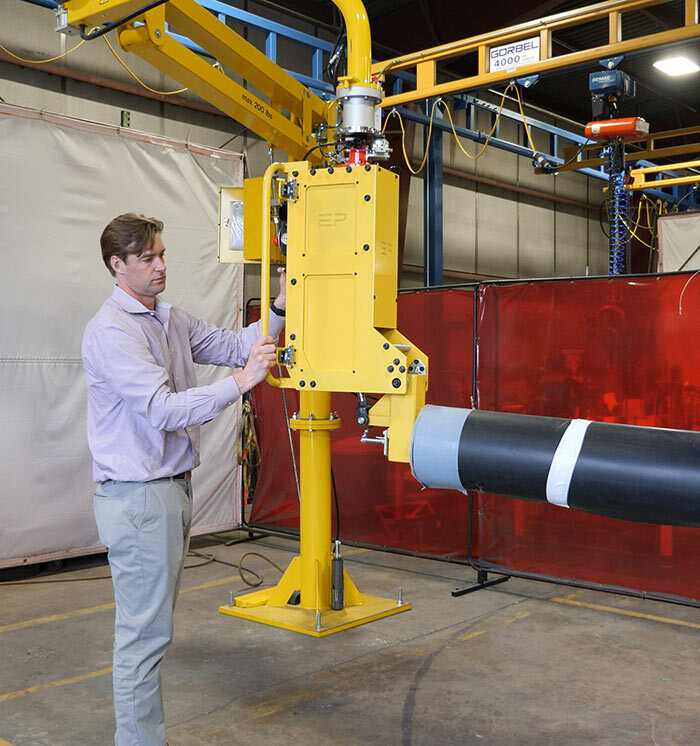 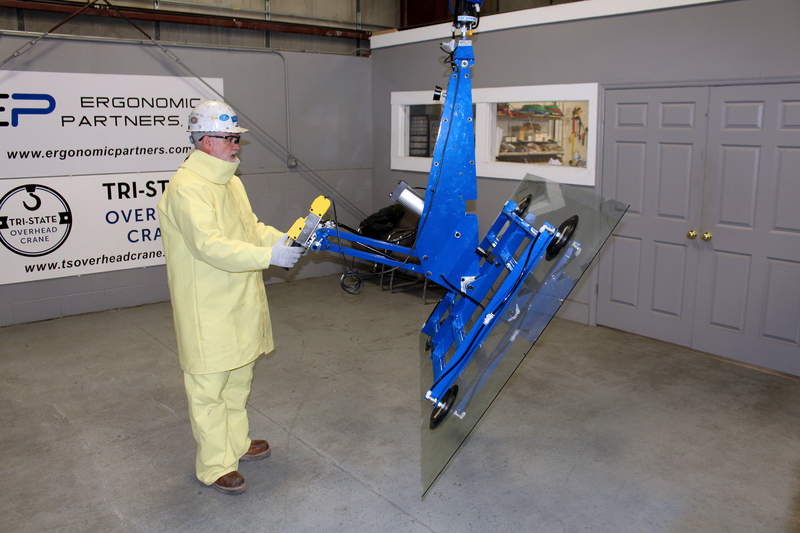 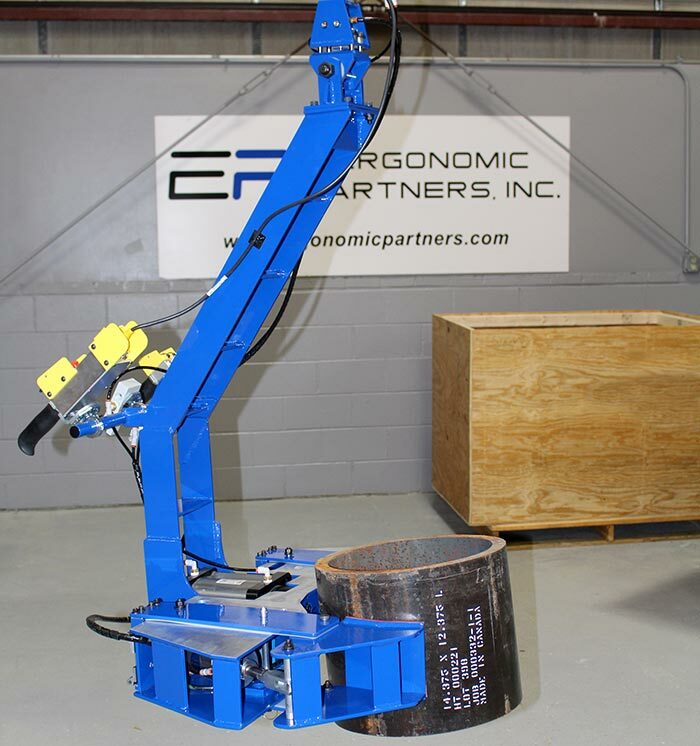 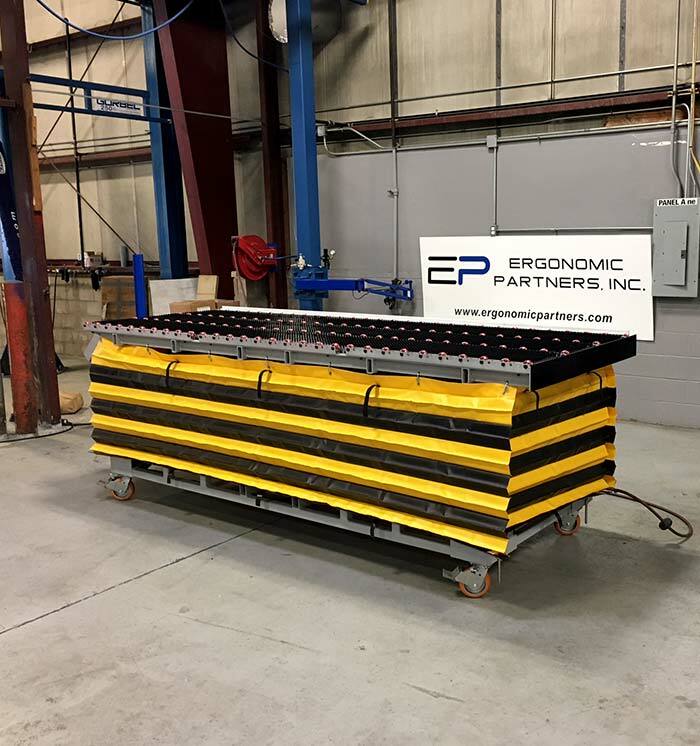 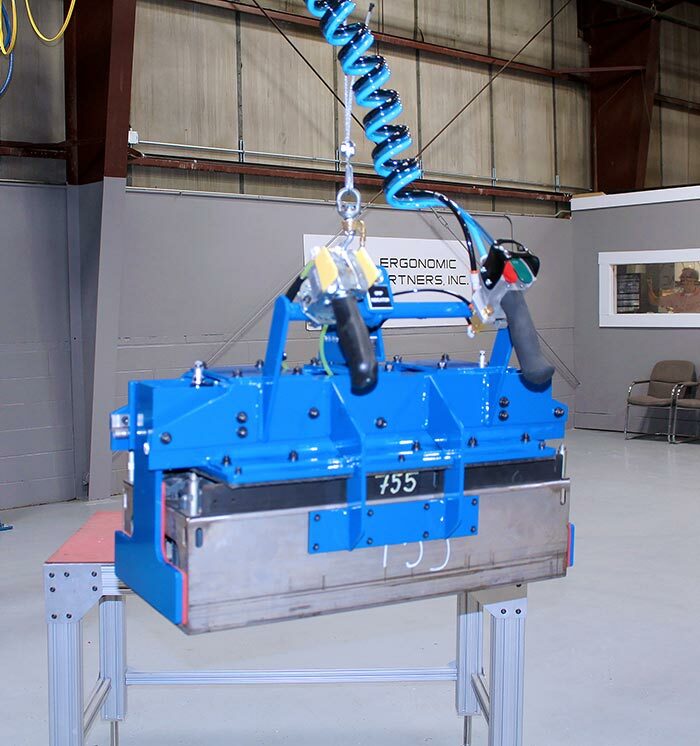 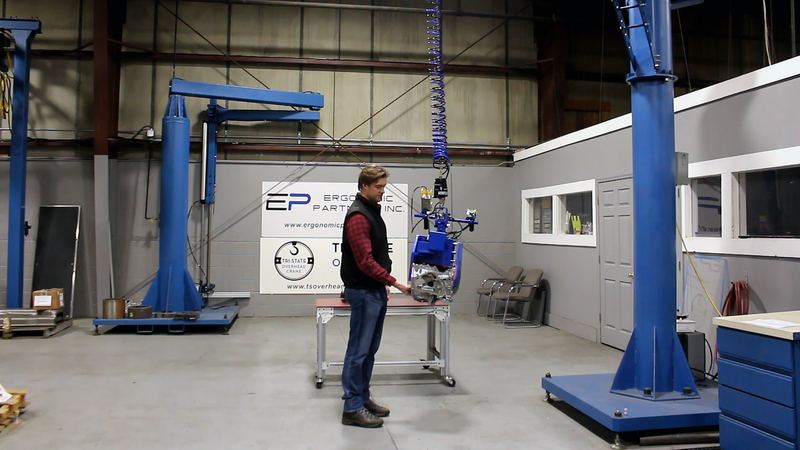 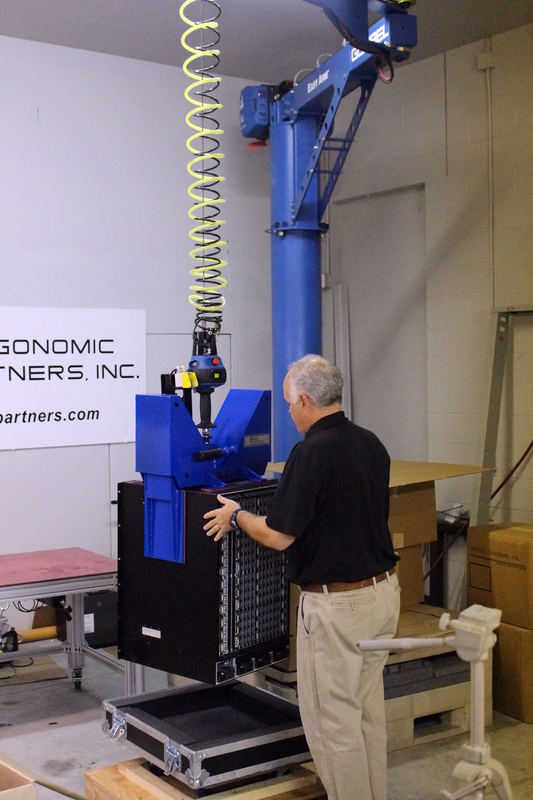 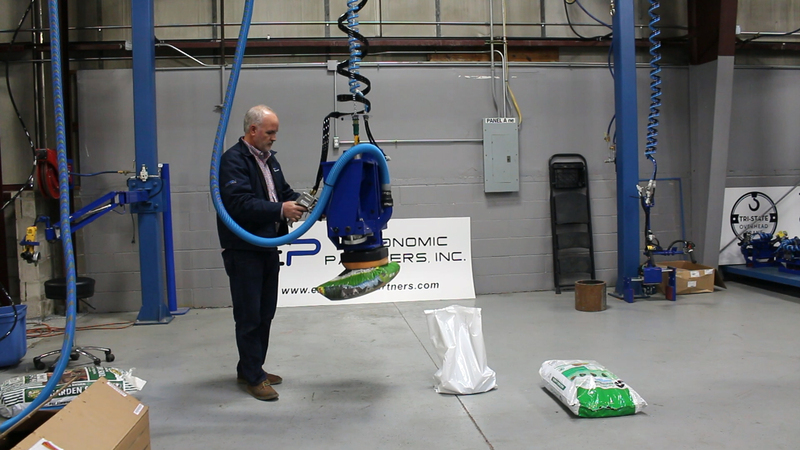 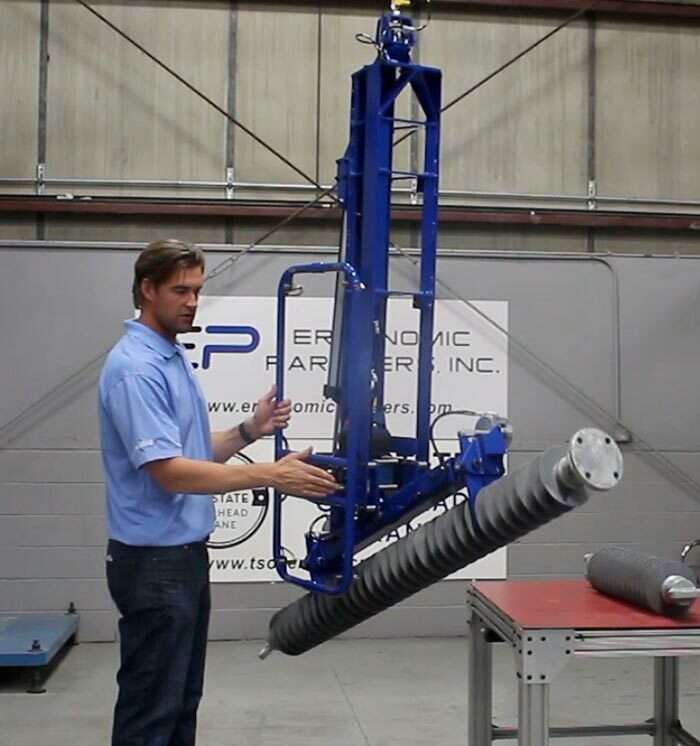 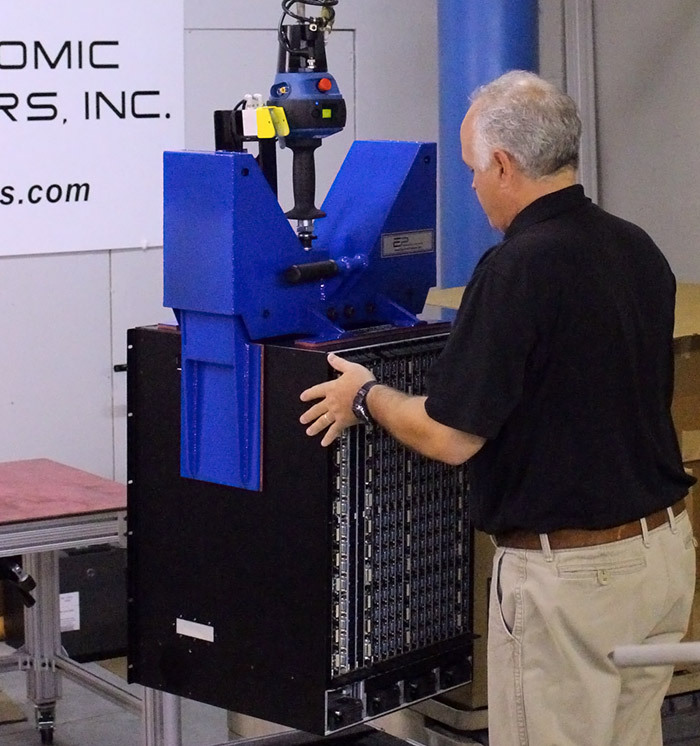 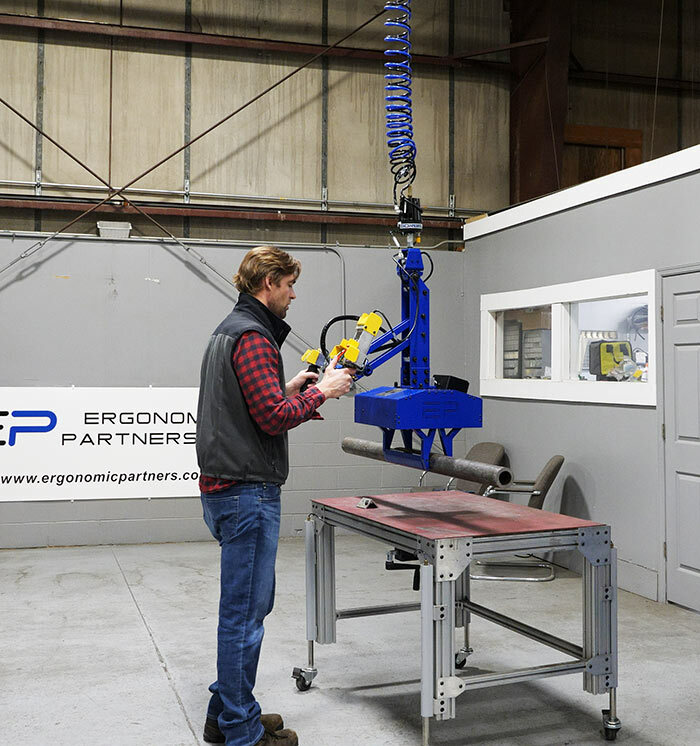 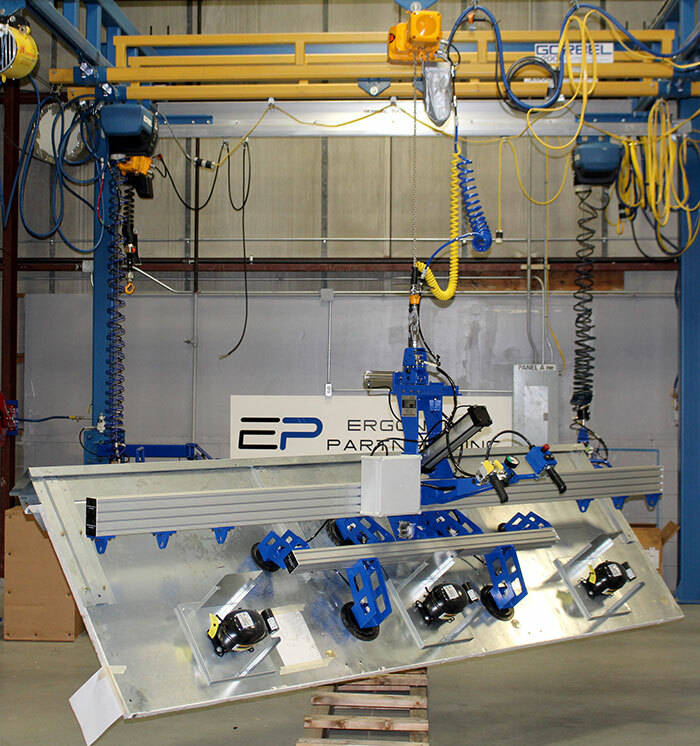 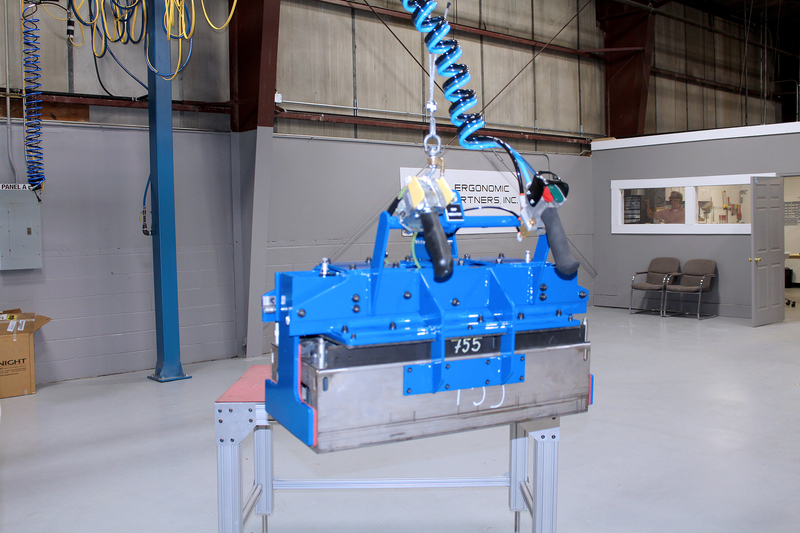 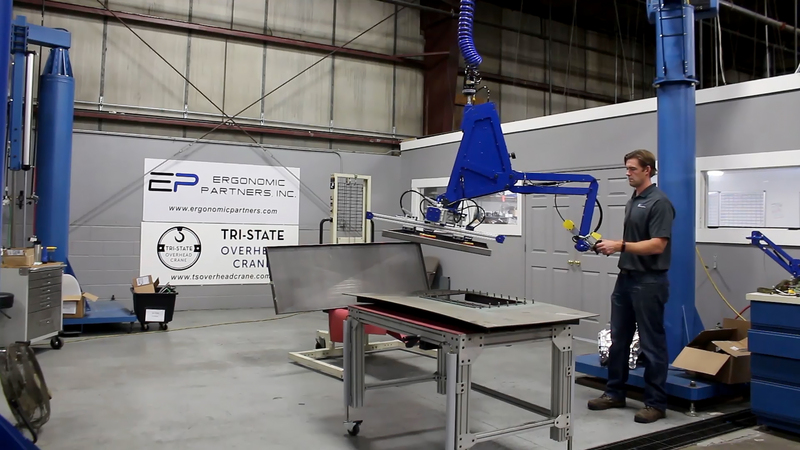 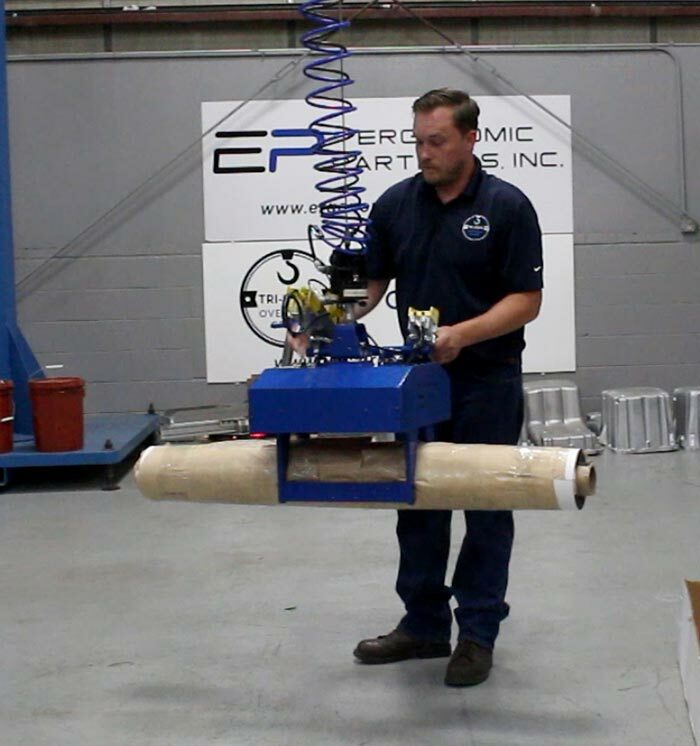 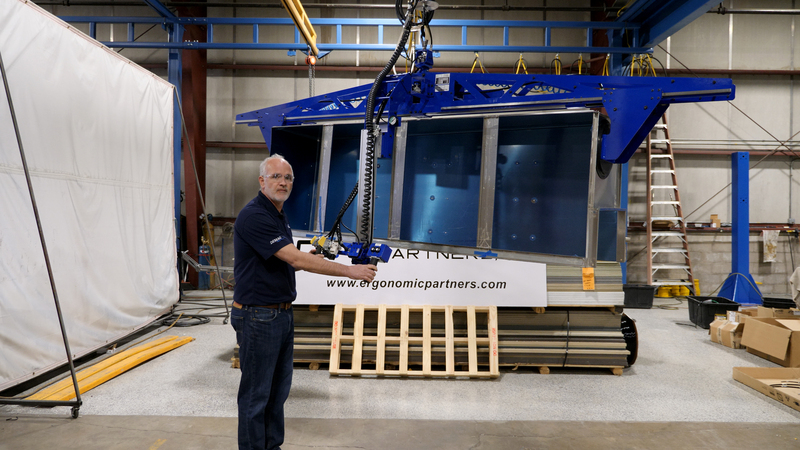 Ergonomic Partners, recommends that we perform a pre-installation run-off of lifting your material at our tooling fabrication center. 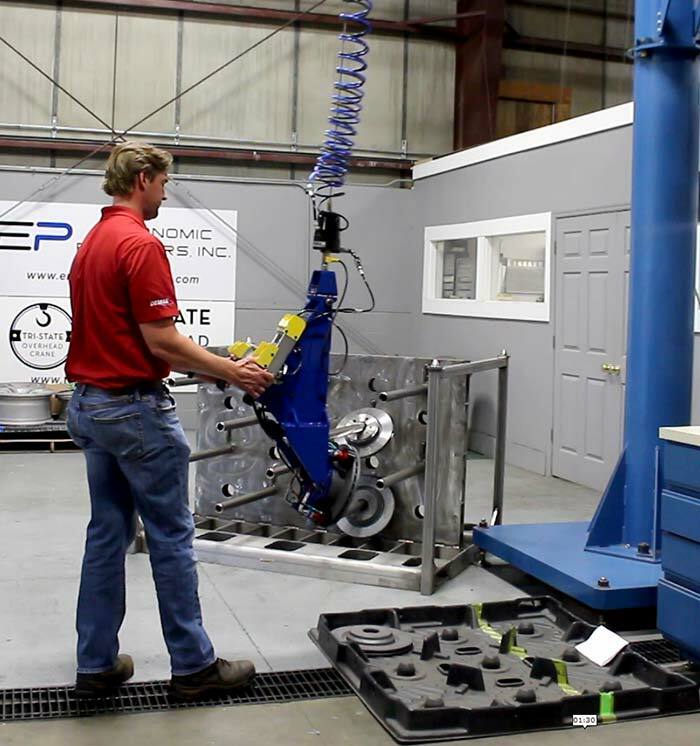 This allows our engineers to get a more hands on feel for the refinement of the custom tool before installing in your facility. 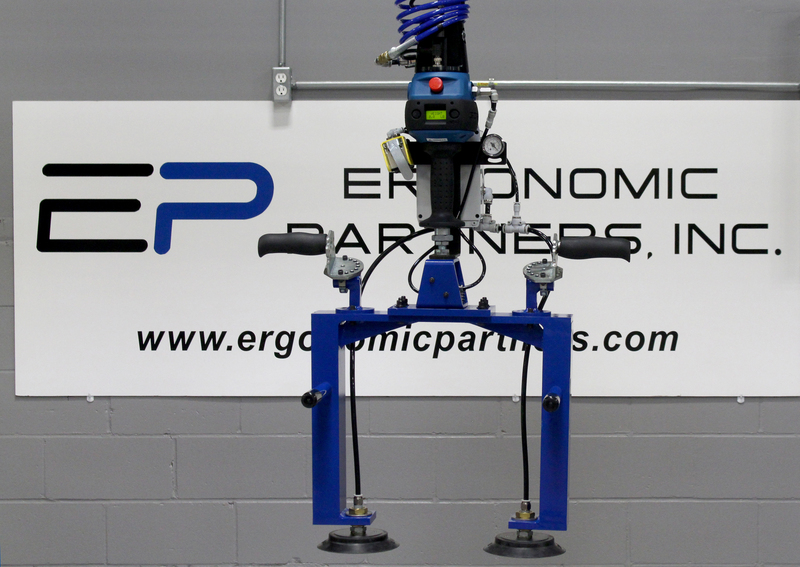 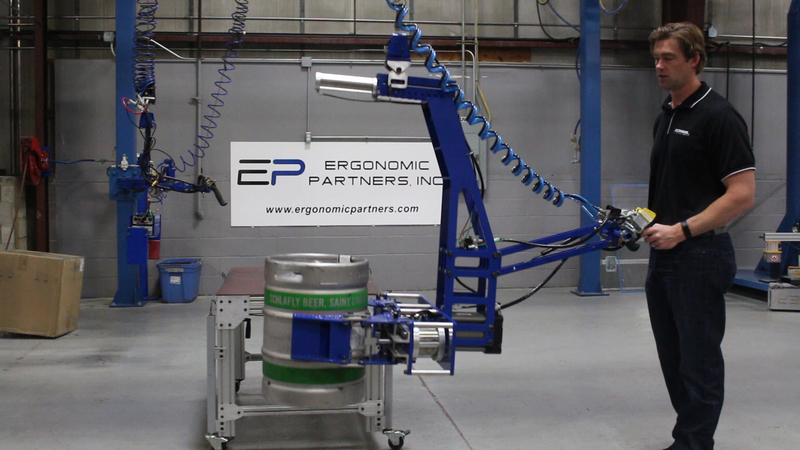 Ergonomic Partners focuses on safety first and simplicity second. 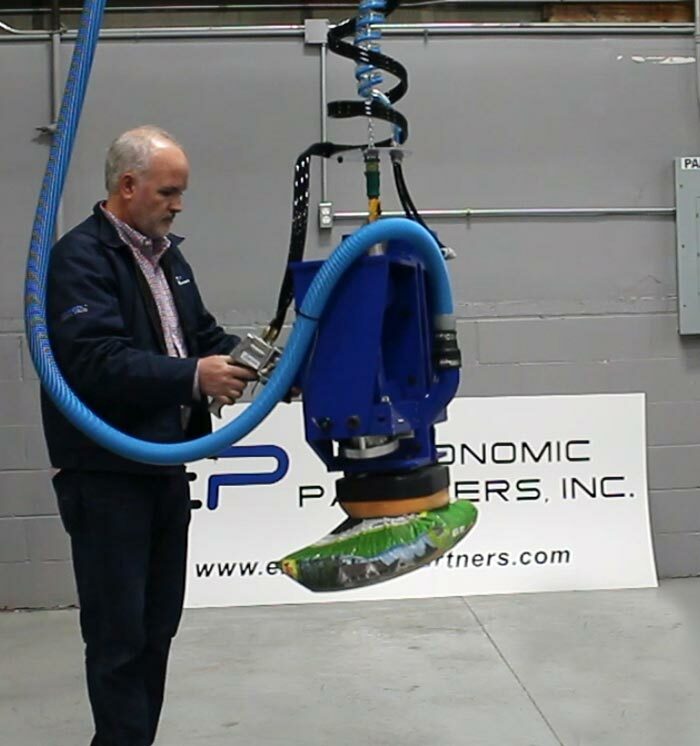 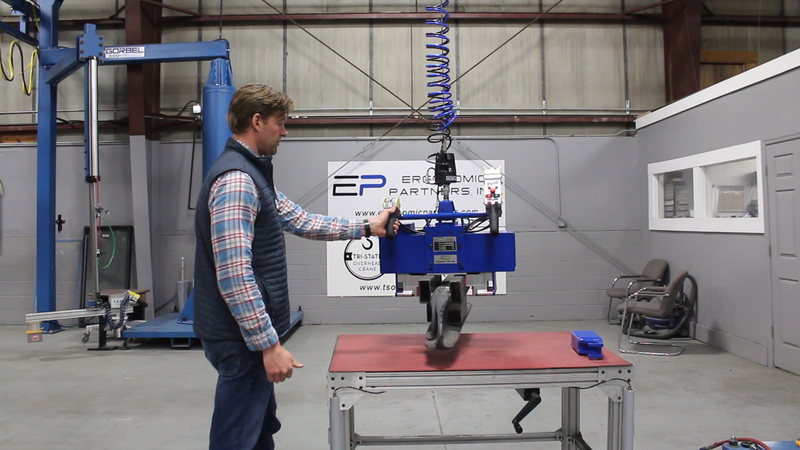 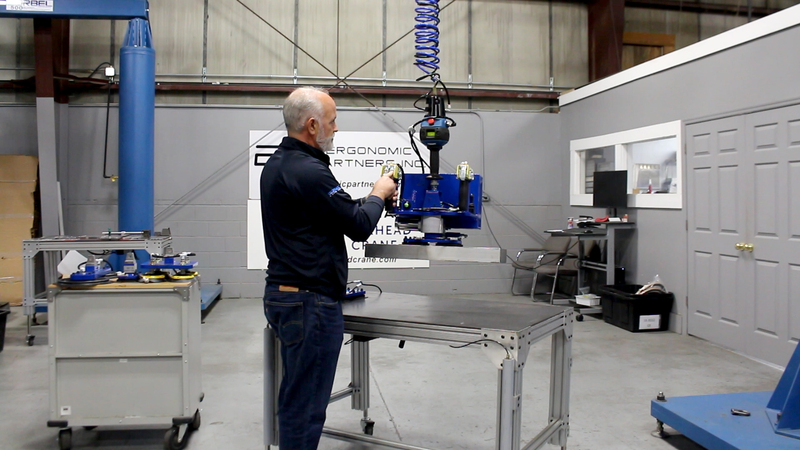 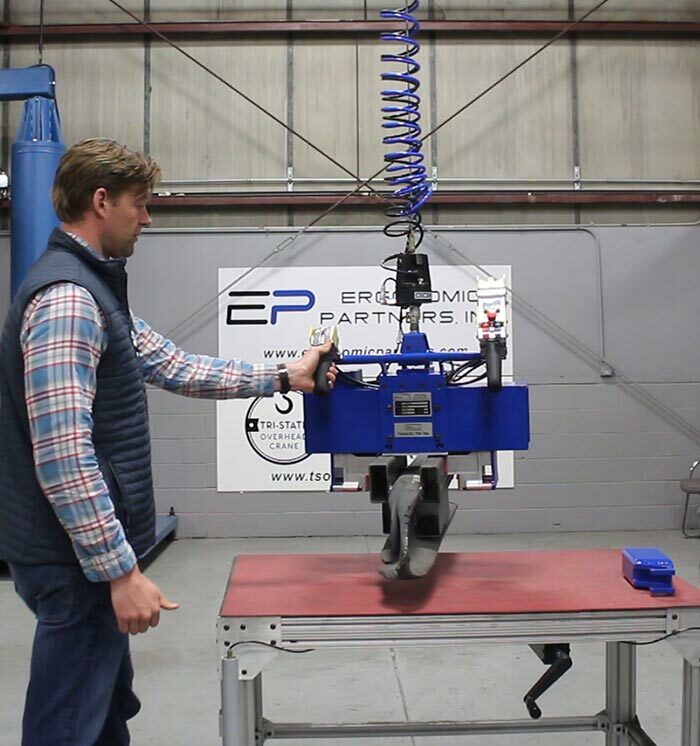 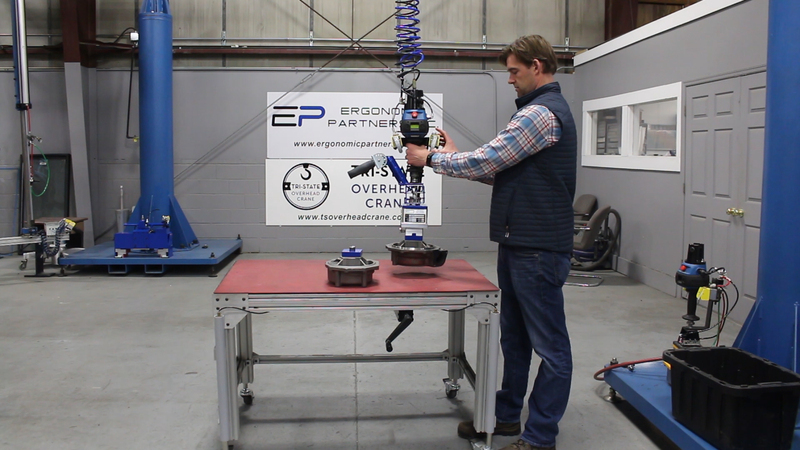 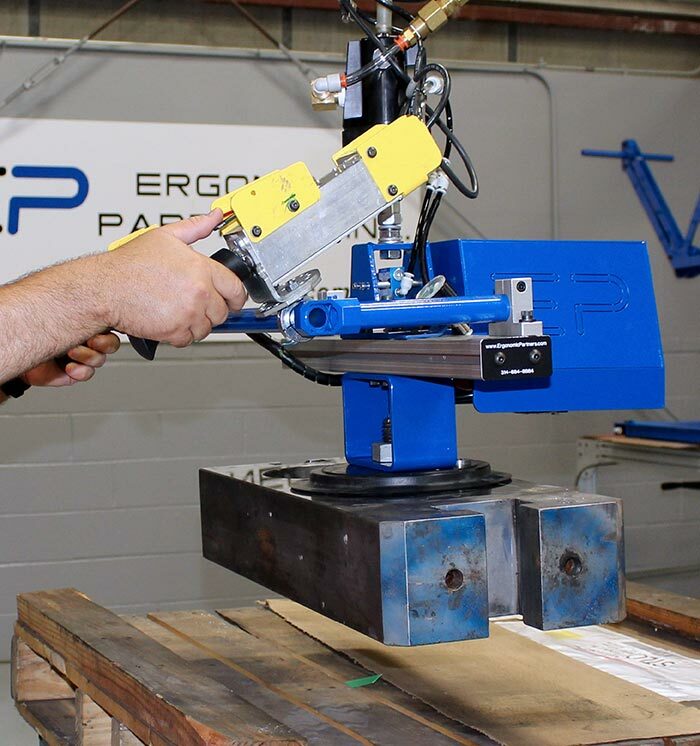 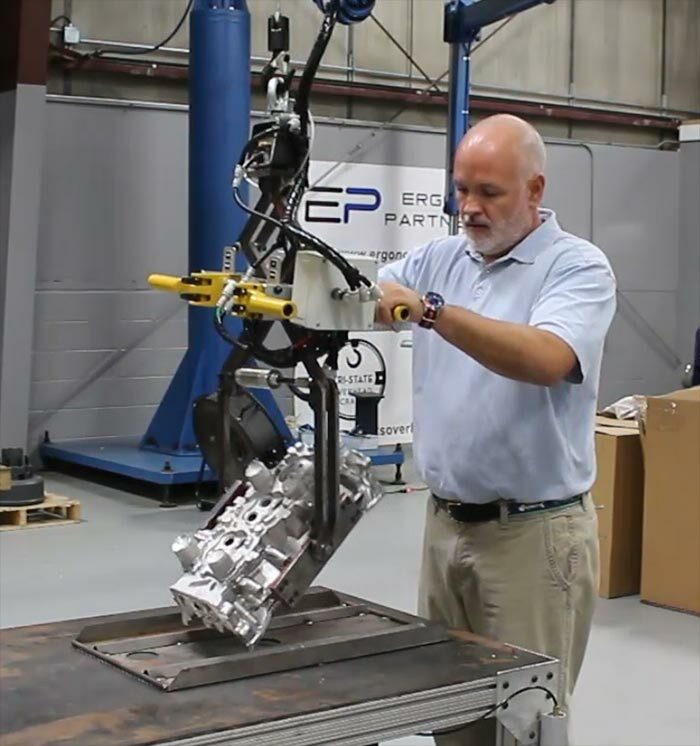 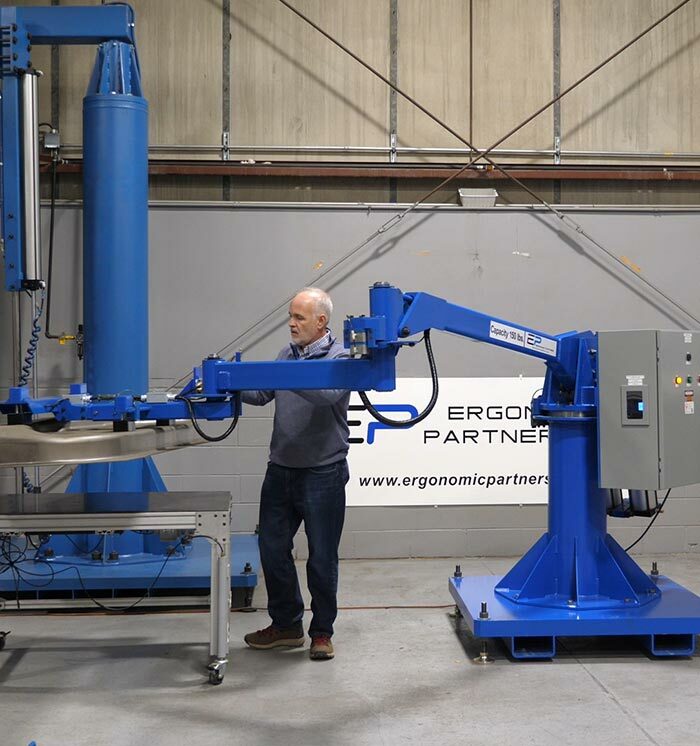 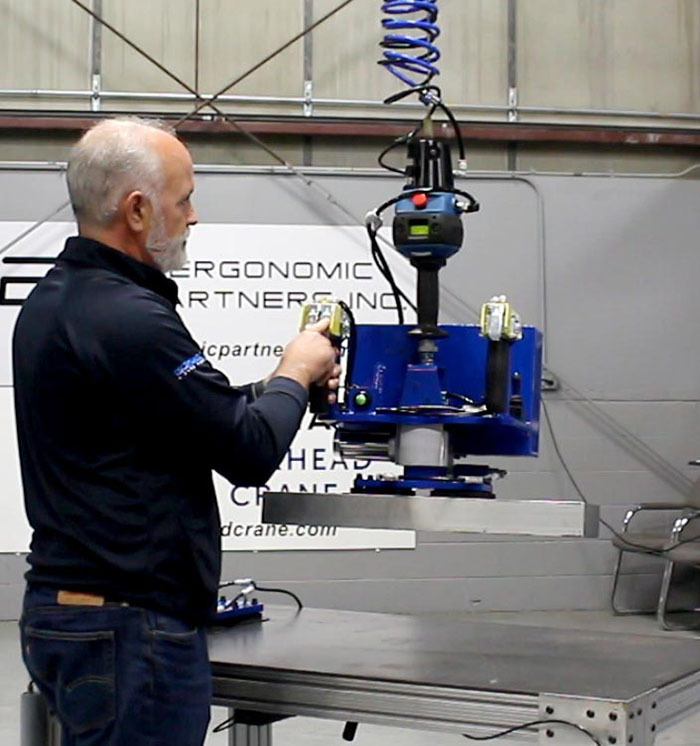 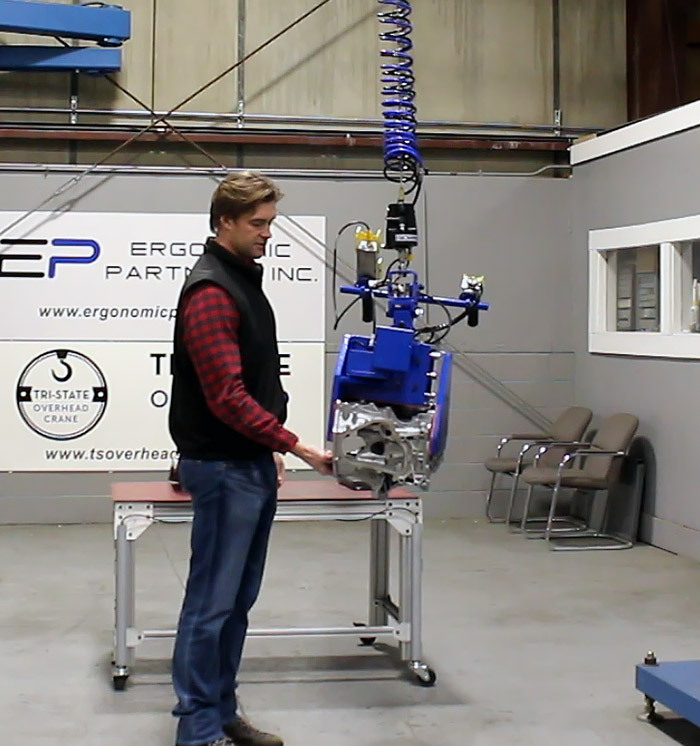 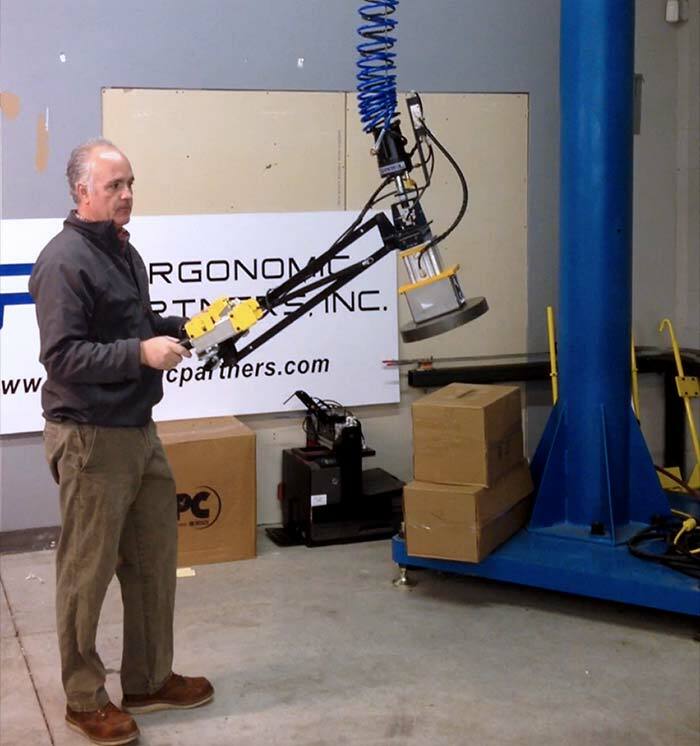 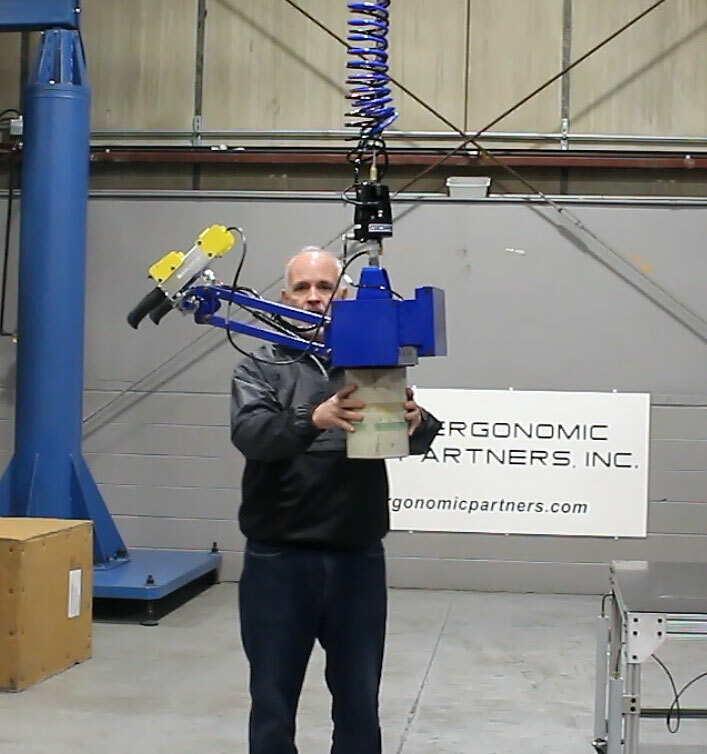 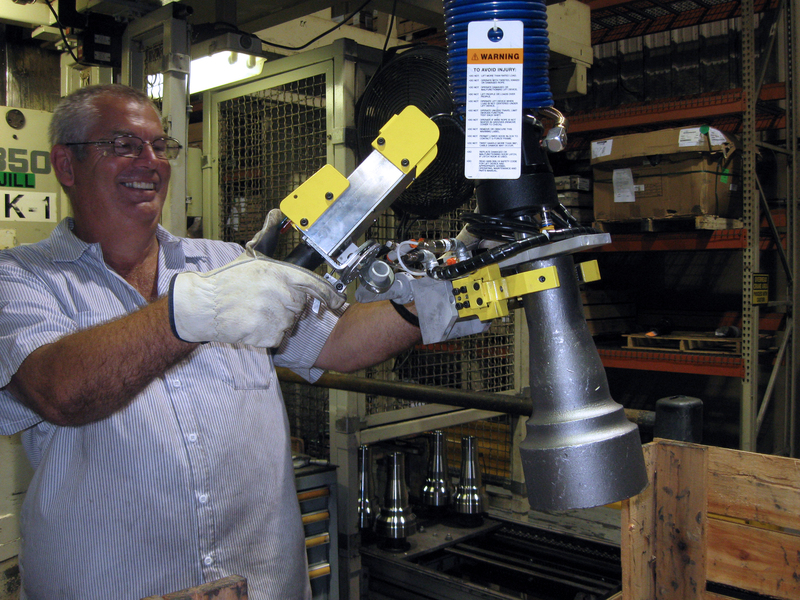 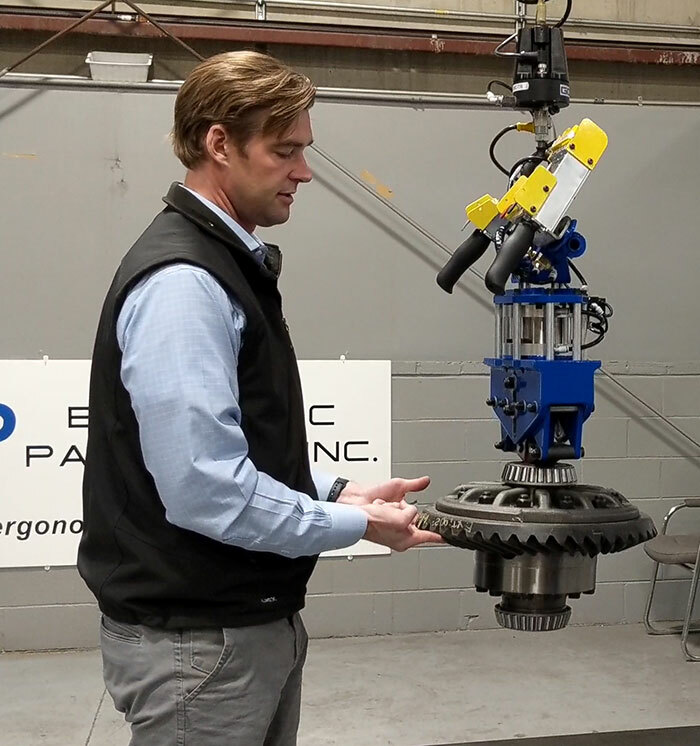 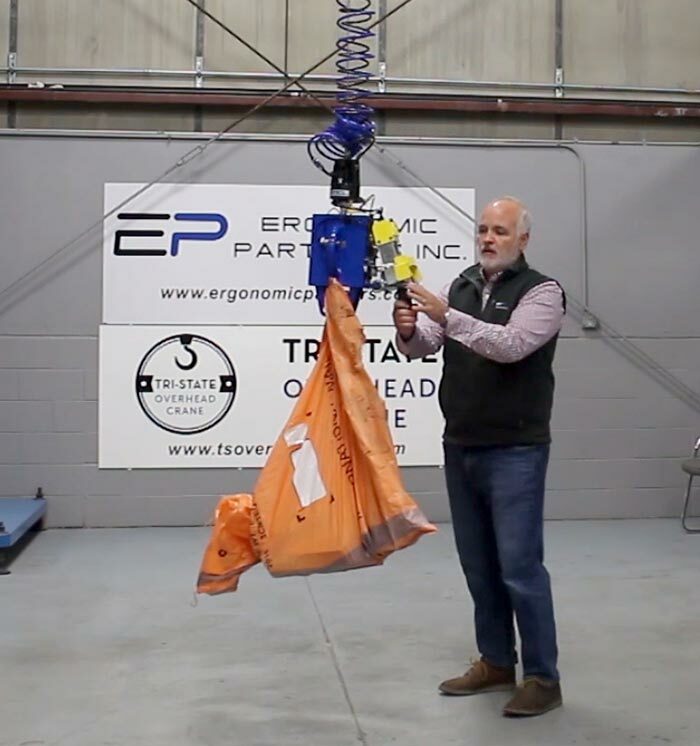 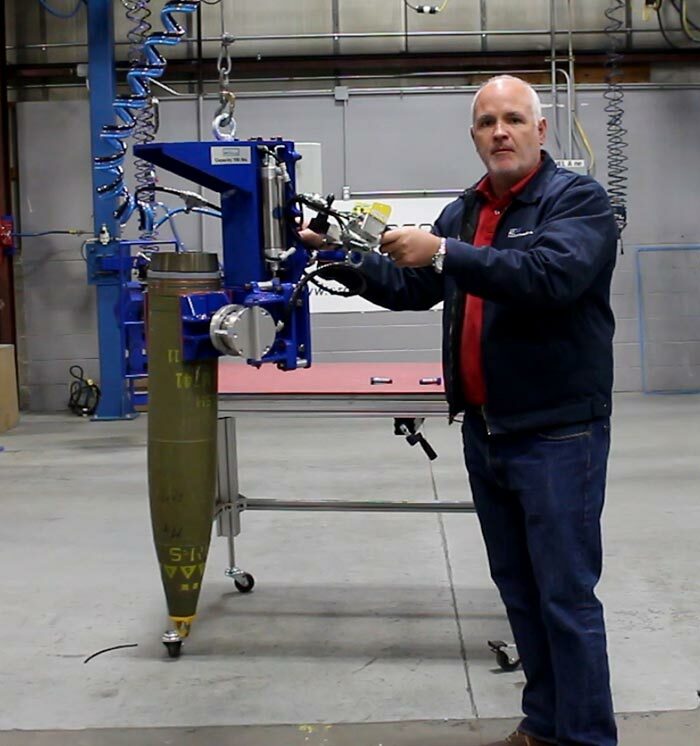 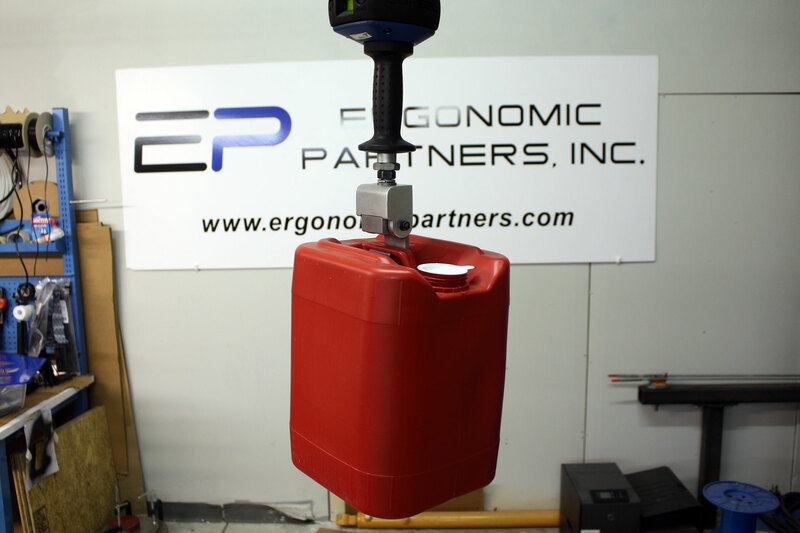 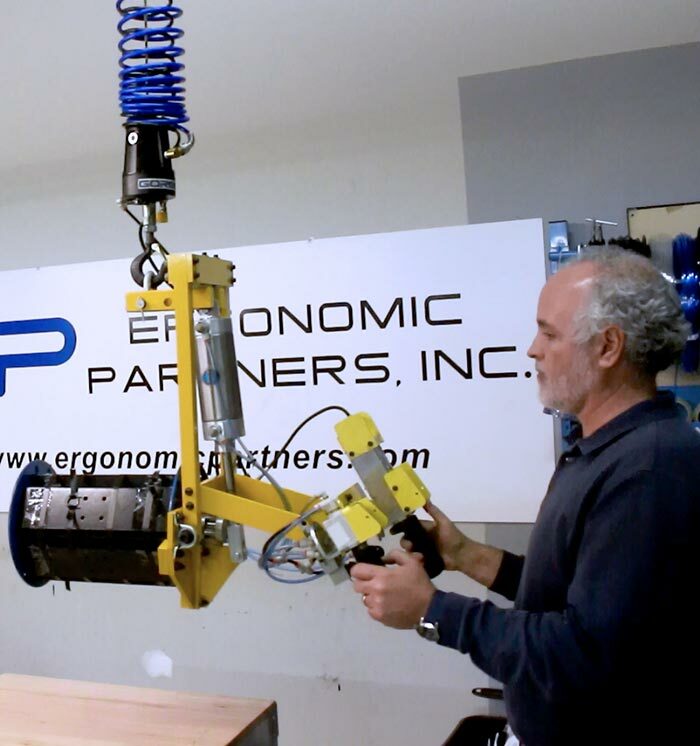 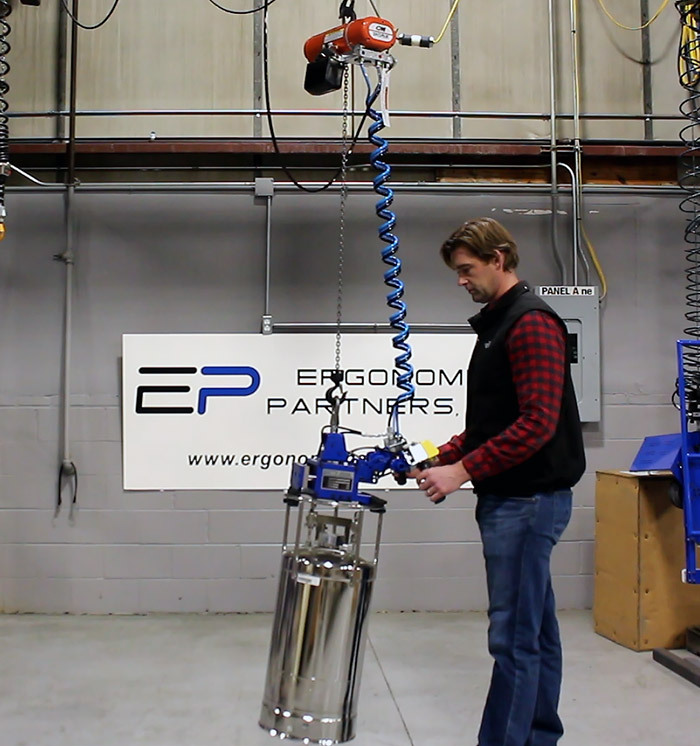 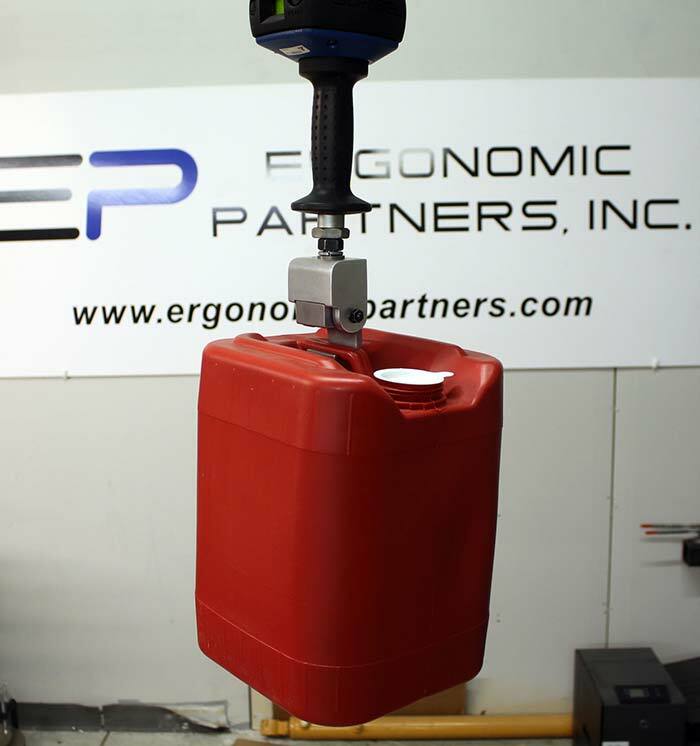 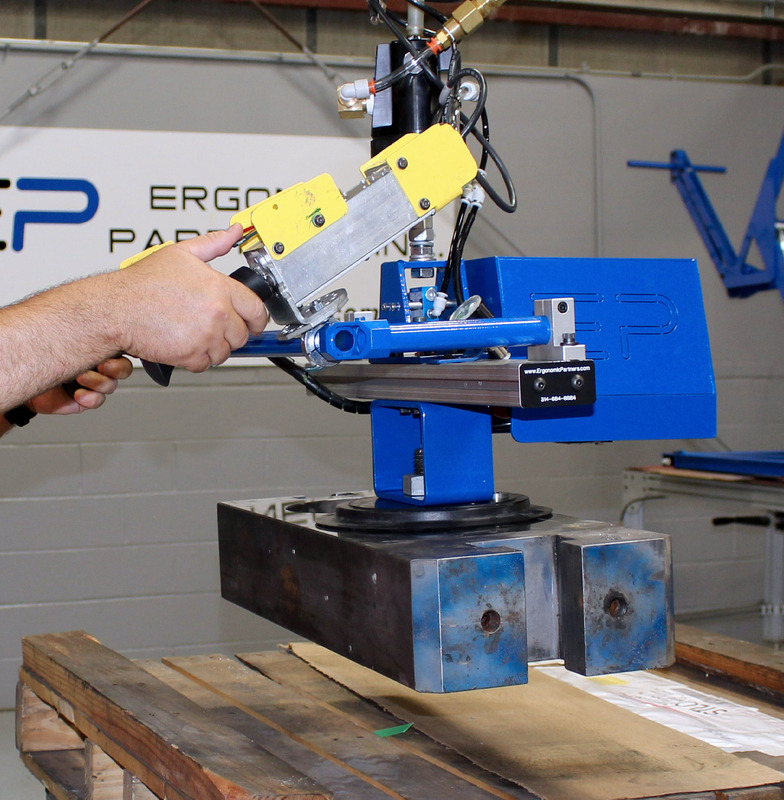 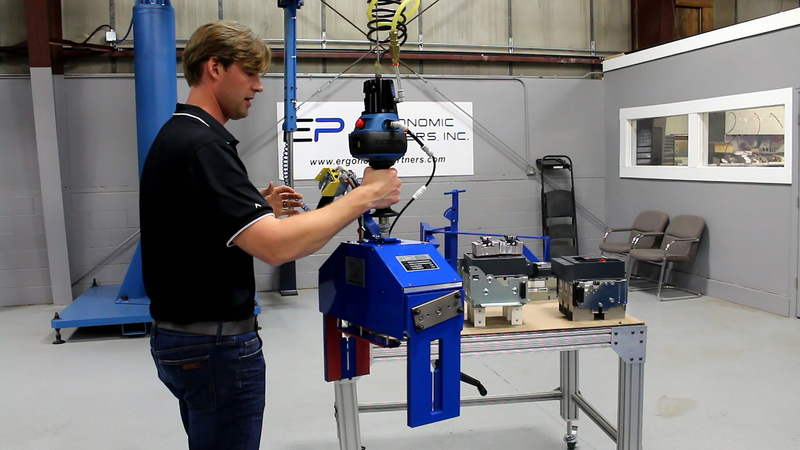 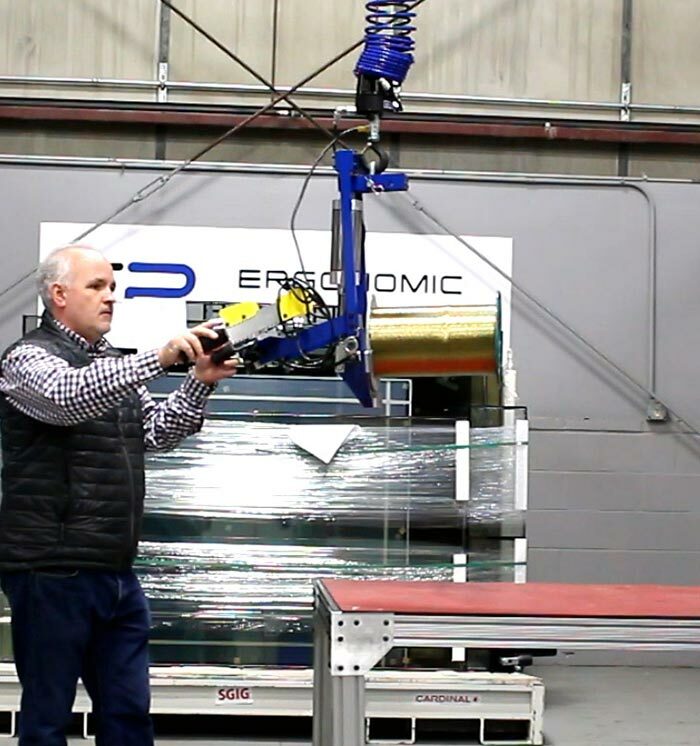 At Ergonomic Partners, we believe that safety of the tooling comes first with the simplicity of the lifting device a close second. 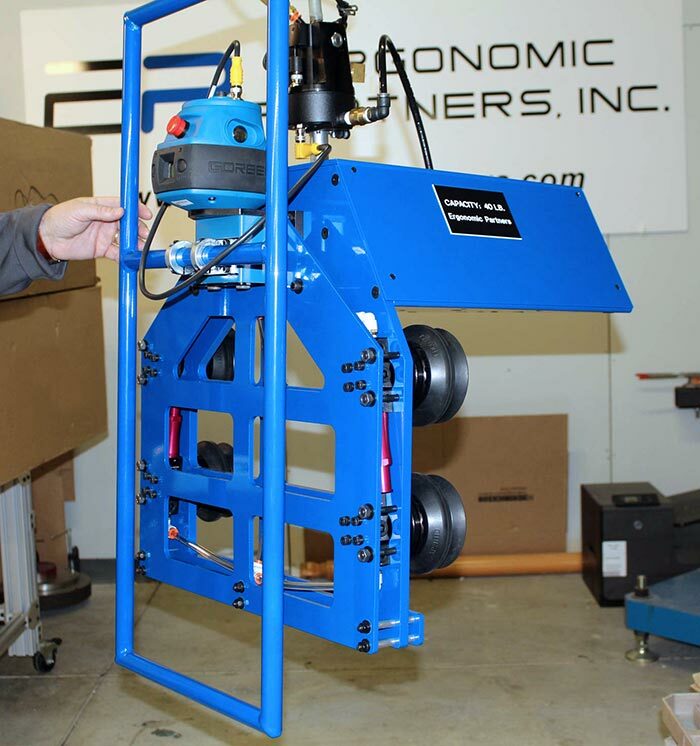 Give us a call at (314) 884-8884 to let us help with your material handling needs. 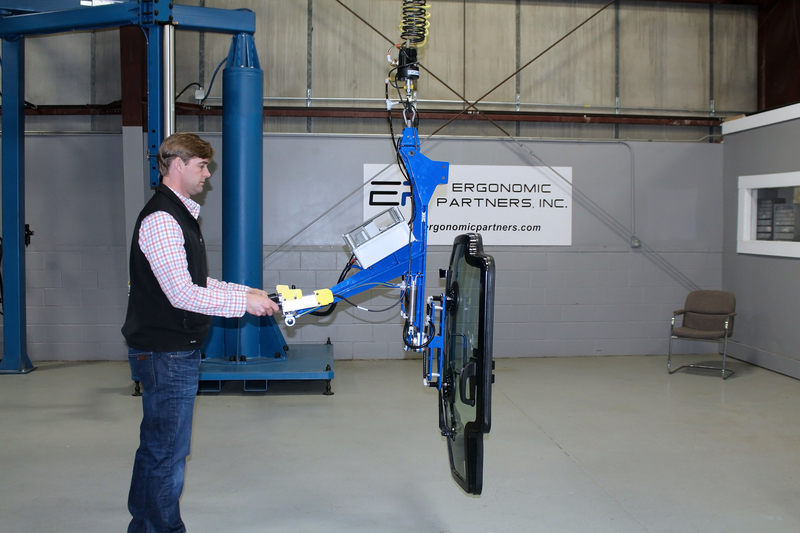 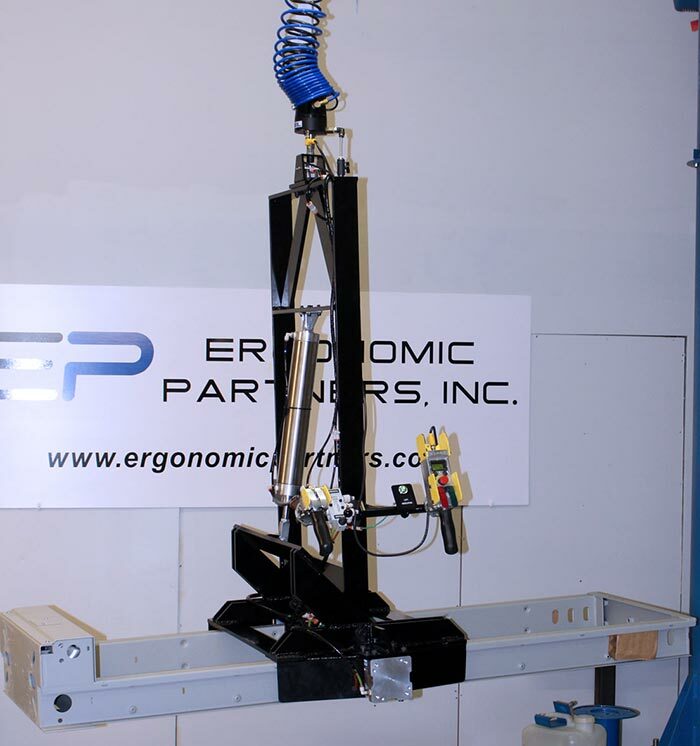 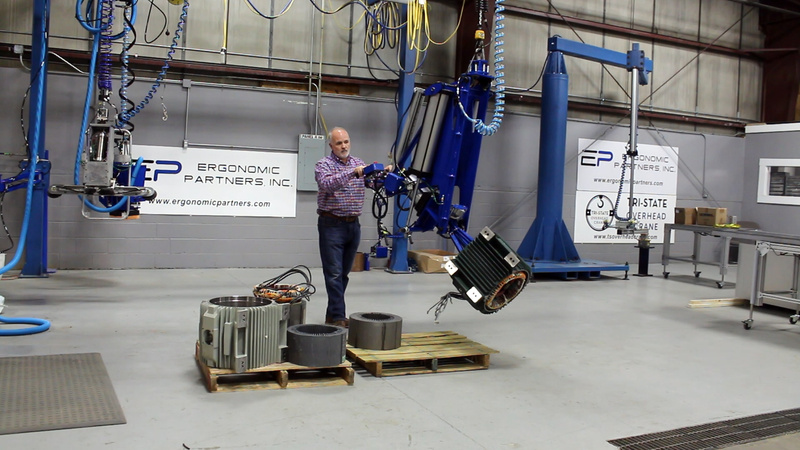 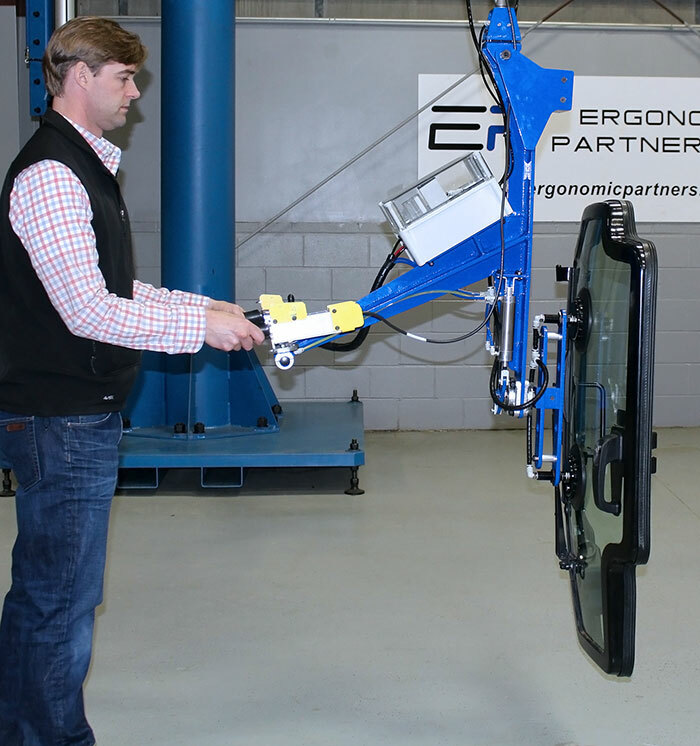 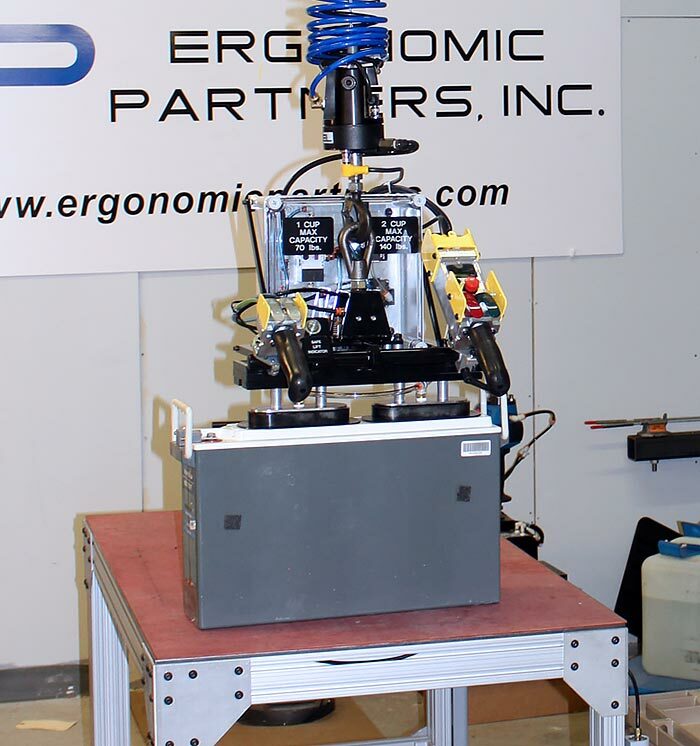 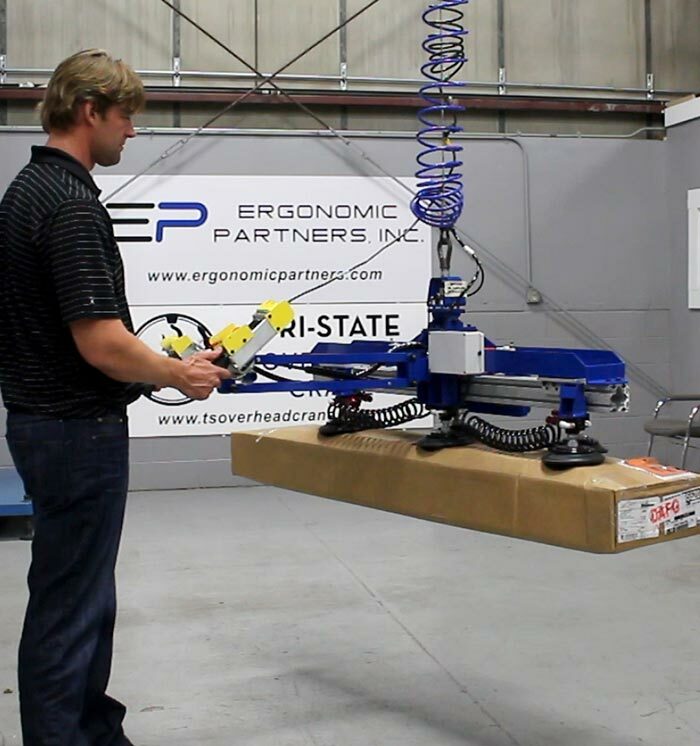 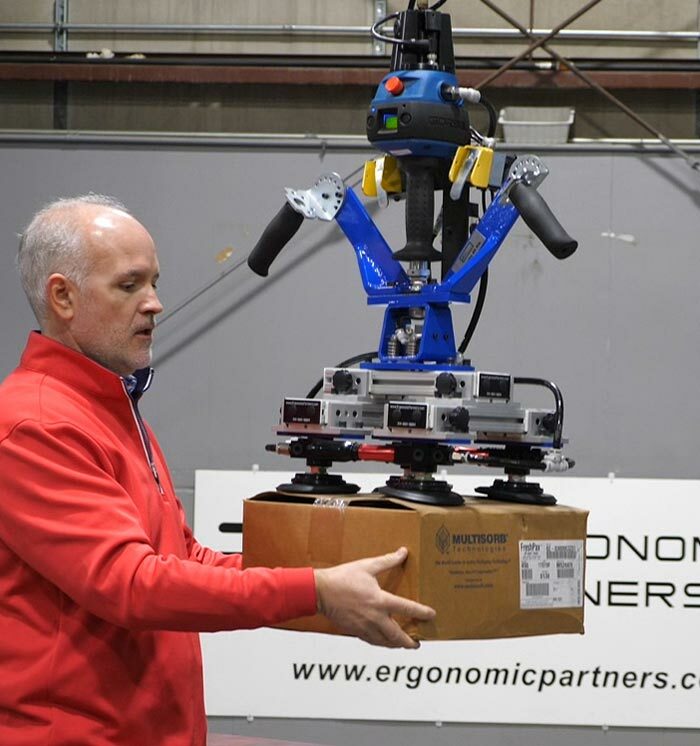 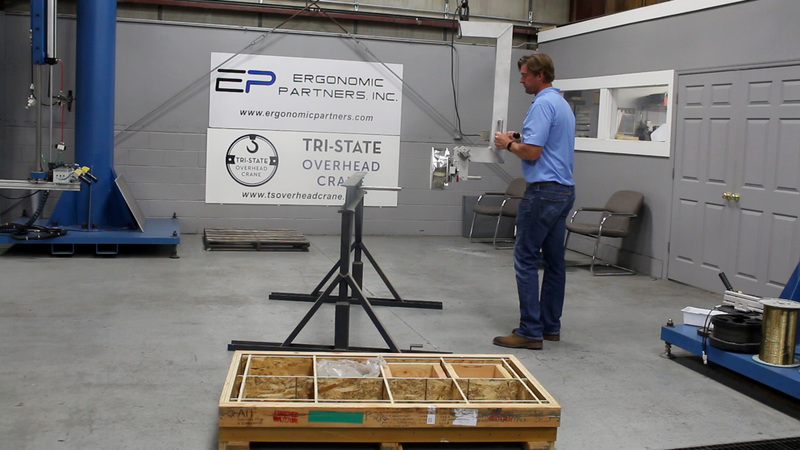 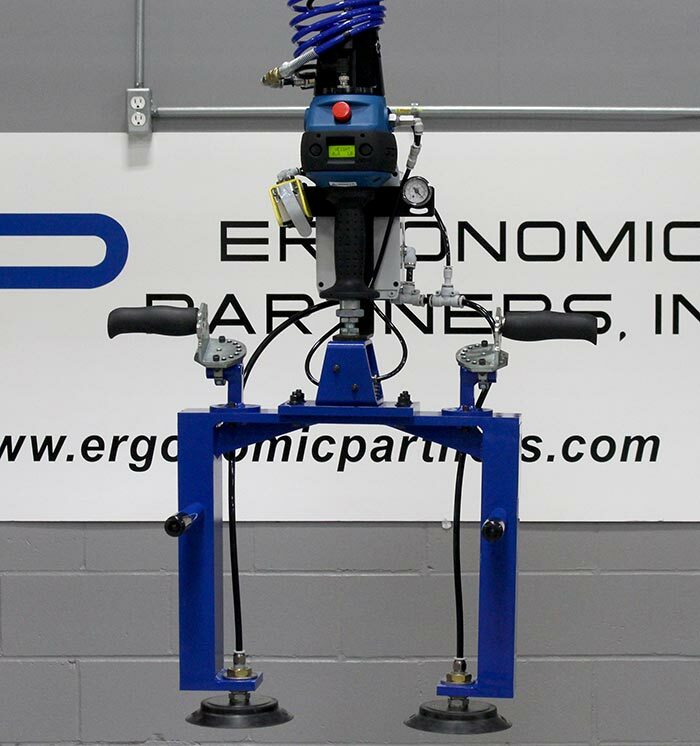 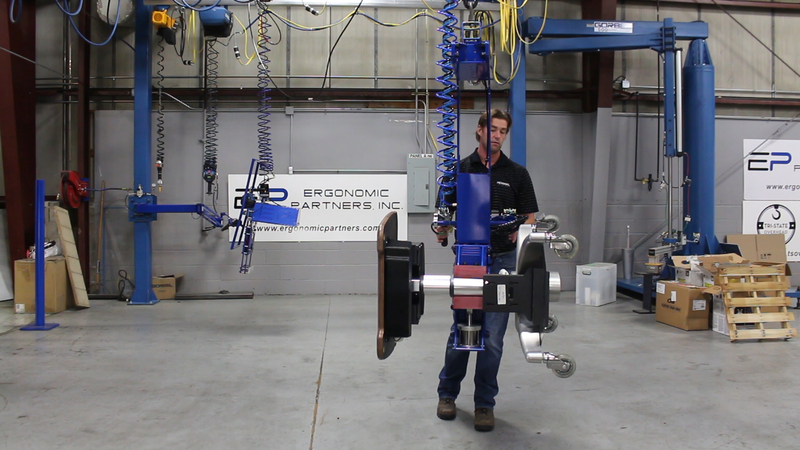 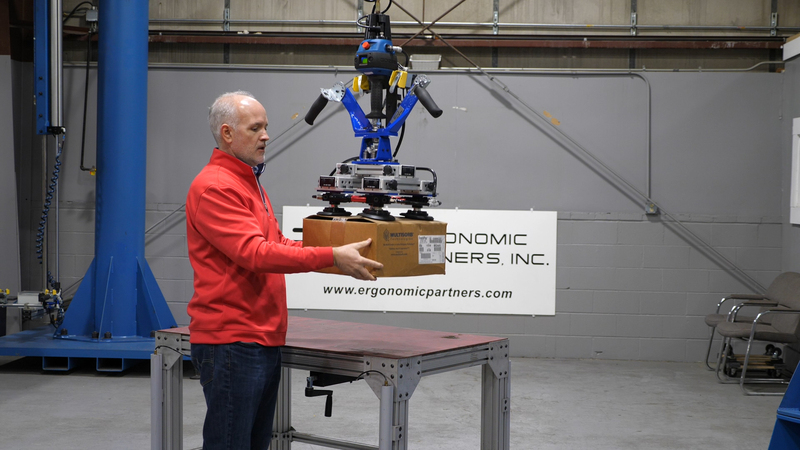 Ergonomic Partners engineers, designs and manufacturers ergonomic lift assists; serving clients from coast to coast, Canada, Mexico and especially focused in the states of Missouri, Illinois, Indiana, Kansas, Arkansas, Mississippi, Nebraska, Tennessee, Kentucky, Iowa, and Oklahoma.